Update as of 10am -- Most areas have 7 to 12 inches of snow , expect another 5 to 12 inches. 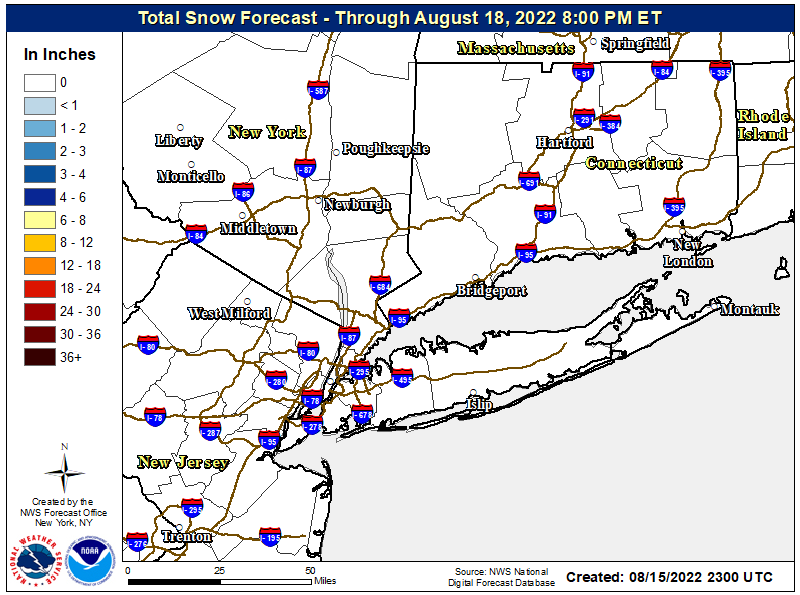 Most areas will be 15 to 24 inches, some areas could see up to 30 inches in heavy snow bands. 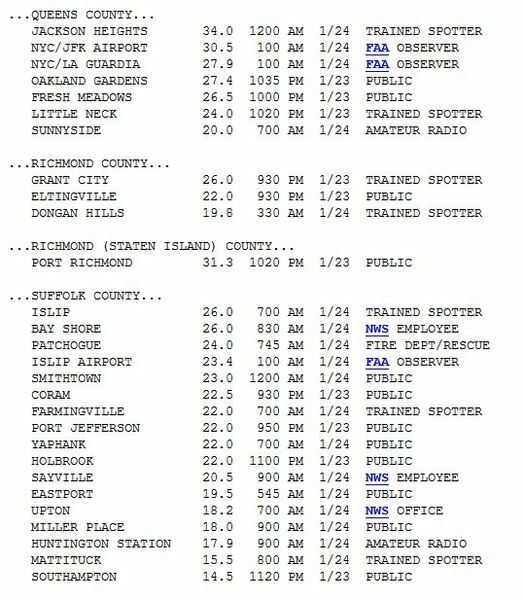 From Port Jefferson South to Patchogue then West to NYC snow amount 20 to 25 inches with a few spots 25 to 30 inches. caution driving and walking. 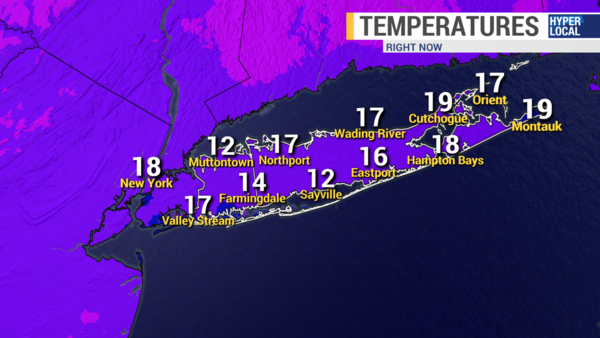 Temperatures in the teens and 20s this morning. TONIGHT: Watch for Icy Conditions. Partly Cloudy skies. 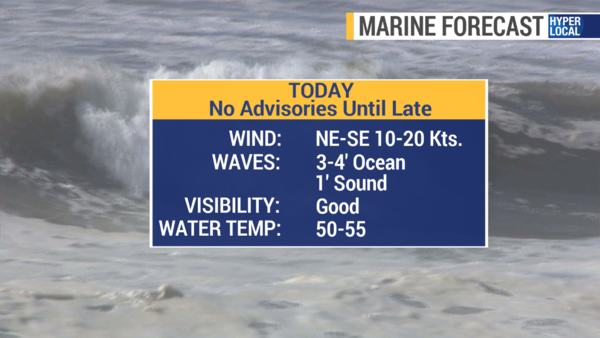 Winds South-Southwest 5 to 10 mph. Lows 20 to 25. 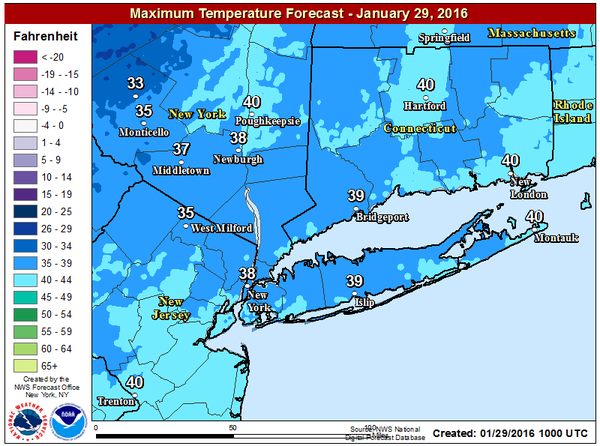 Temperatures rising into the 30s by morning. Below is map for Tuesday evening - Clouds and threat of rain showers ahead of Cold Front. 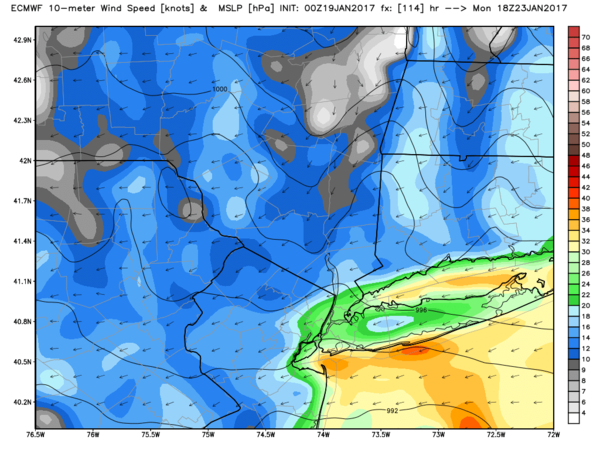 Warm air moving over Long Island on Tuesday. TOMORROW(TUESDAY) : Mostly Cloudy skies, breaks of sunshine. Chance of a late day shower. Warmer. 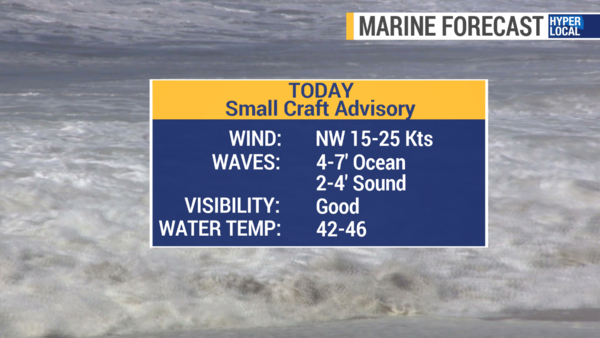 Winds South-Southwest 5 to 15 mph. Highs 40 to 50 . Overnight will be Mostly Cloudy. Chance of a few spotty showers. Lows near 27. Watch for Black Ice. WEDNESDAY: Sun and Clouds. Highs 38 to 43. Overnight will be mostly clear lows 22 to 27. Watch for Black Ice.THURSDAY: Partly Sunny. Highs near 35. Overnight will be mostly cloudy with chance of snow showers.Lows near 23. 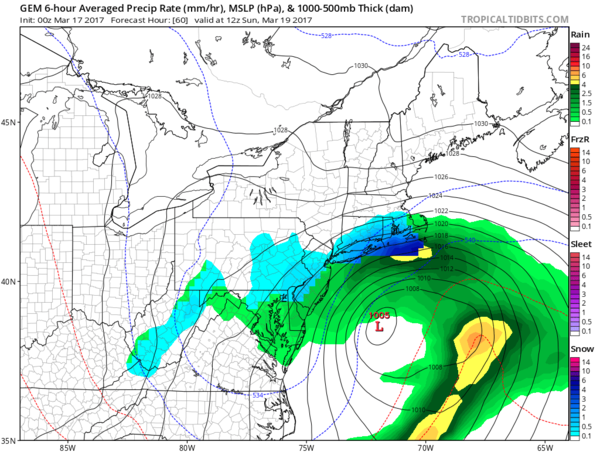 Watching a storm that looks like it will pass to the East Thursday night into Friday - Below are the ECMWF (euro) and GFS model. 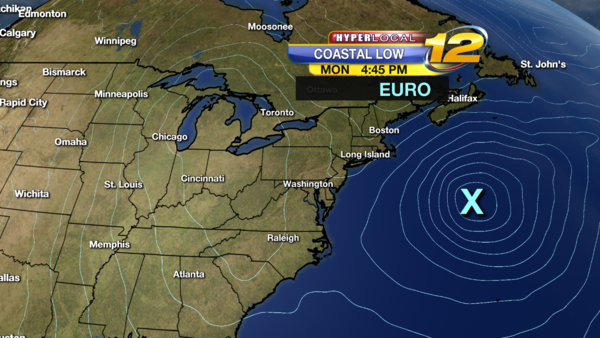 Euro Forecast shows Storm off Shore - We will Watch closely. 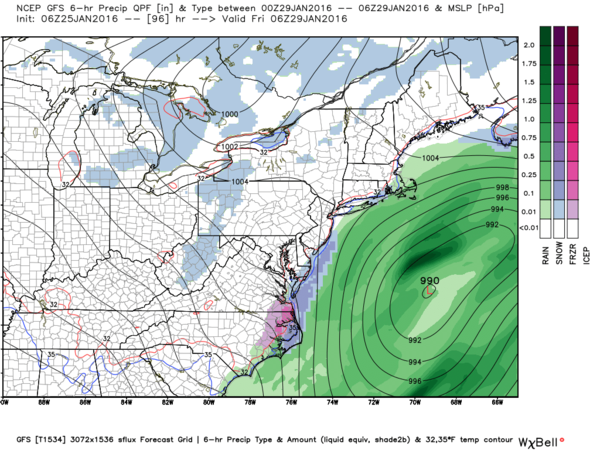 GFS model for Early Friday morning Showing storm off shore. 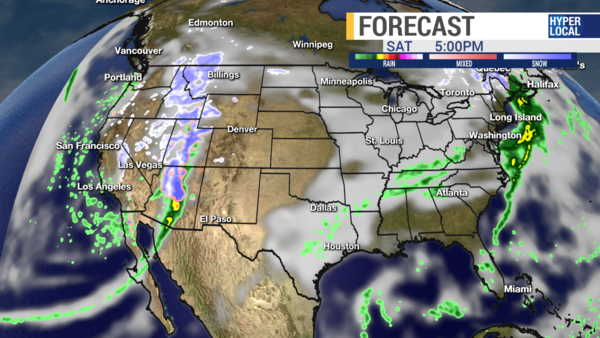 TRACKING COASTAL STORM -- AS OF NOW LOOKS TO GOT OUT TO SEA. SATURDAY: Partly Sunny. Highs 37 to 42. Overnight will be partly cloudy. Lows 20 to 25. SUNDAY: Partly sunny. Highs near 41. Lows near 27. TONIGHT: Increasing Clouds. Winds West-Northwest around 5 mph. Lows near 28. FRIDAY: Mostly Cloudy skies, some breaks of sunshine. Some scattered rain and snow showers. A dusting to 3 tenths possible. 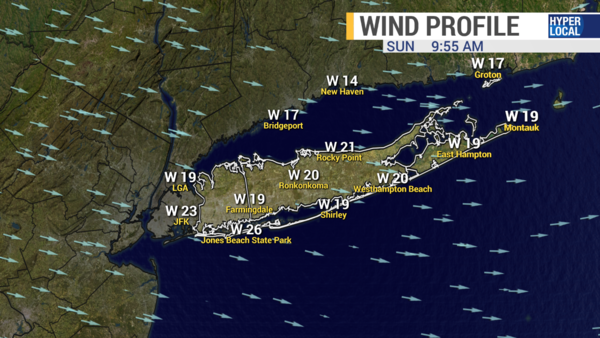 Winds West-Northwest 10 to 20 with gusts to 30 mph. 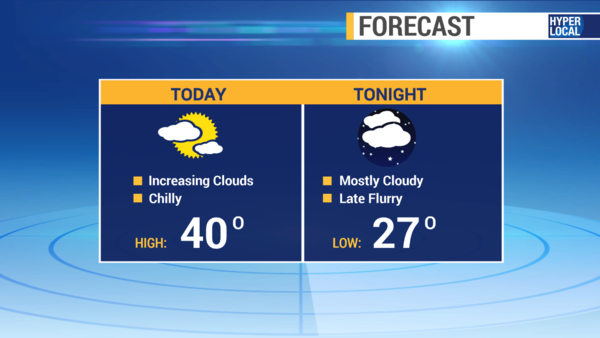 OVERNIGHT: Partly Cloudy with lows 22 to 27. SATURDAY: Sun and Clouds. Breezy a little chilly. Highs 35 to 40. OVERNIGHT: Partly Cloudy to Mostly Cloudy skies. Lows around 30. SUNDAY: Partly Sunny. Warmer. Highs 43 to 48. OVERNIGHT: Mostly Cloudy skies. Lows near 35. MONDAY: Mostly Cloudy skies. A few showers. Highs 47 to 52. OVERNIGHT: Mostly Cloudy skies. Lows 33 to 38. TUESDAY: GROUNDHOG DAY: A shadow means 6 more weeks of winter. I think there will be sunshine and a shadow. Partly Sunny skies. Highs 47 to 52. 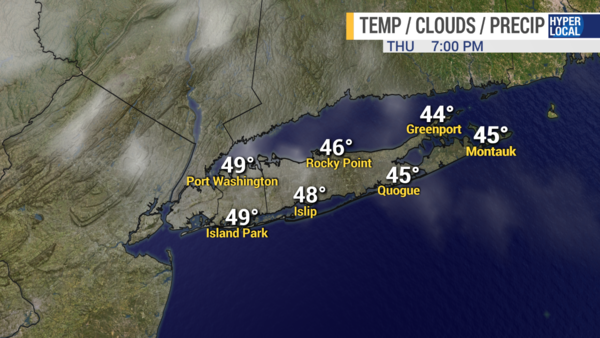 TUESDAY NIGHT: Mostly Cloudy with lows near 40. WEDNESDAY: Warm, Wet and Windy. Cloudy skies. Periods of rain. Gusty winds. Highs 50 to 55. OVERNIGHT: Cloudy with scattered showers. Windy. Lows near 38.
there is an increased potential to hear the sound. contact information, and description and location of the disturbance. as possible. Noise Disturbance Hotline: 1-866-819-9028 (Recorded line). showers this afternoon. 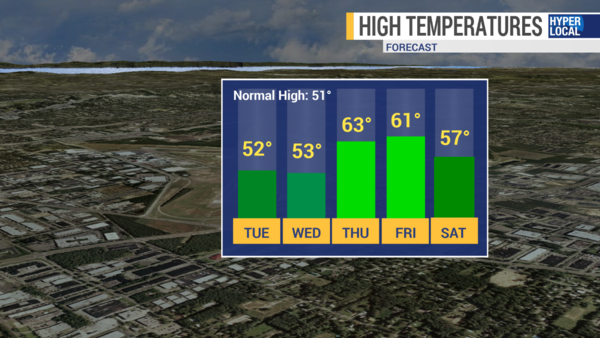 Temperatures will be above normal the next 7 days. January 2016 will end up with above normal TEMPERATURES and above normal PRECIPITATION. West-Northwest 10 to 20 gusts to 30 mph. Highs near 39. Sunset: 5:07pm. 15 with gusts to 25 mph. Lows near 25. 5 to 15 mph. Highs near 38. 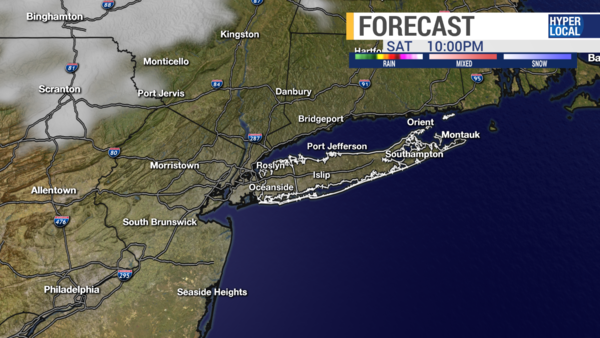 SATURDAY NIGHT: Mostly Cloudy Skies. Lows near 30. 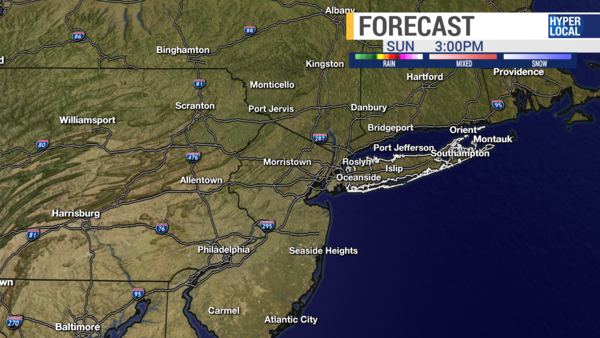 SUNDAY: Partly Sunny and Mild. Highs 45 to 48. Cloudy skies. Lows near 35. MONDAY: Mostly Cloudy skies. A few showers. 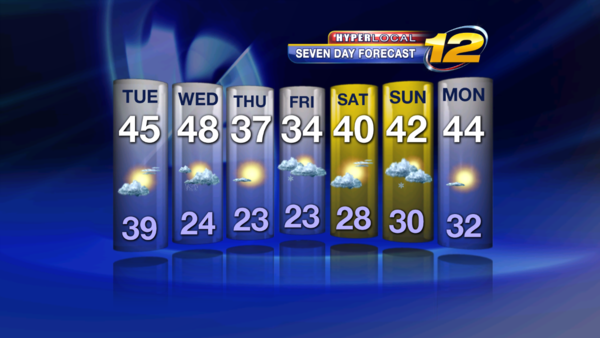 Highs near 47 to 52. MONDAY NIGHT: Mostly Cloudy skies. Lows near 36. 13th. Forecast: Sun and Clouds. Mild. Highs 45 to 50. THURSDAY: Sun and Clouds. Breezy and Colder. Highs 37 to 42. OVERNIGHT: Partly Cloudy skies. Cold. Lows 25 to 30. Hopefully you are enjoying what's left of the weekend! We have another nice day today with warmer temperatures. In fact, take a look at the map below and you'll see that we're close to 10 degrees warmer than yesterday...NOTE: the map below does not indicate the CURRENT temperature, but rather the number of degrees warmer that it is now compared to this time yesterday. 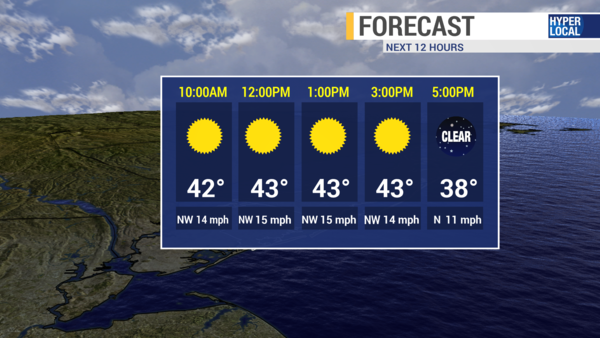 Afternoon highs will be around 49 degrees. Normal high = 39. It will stay dry today and tonight, but tomorrow there is the chance for a couple of afternoon showers, otherwise mostly cloudy. 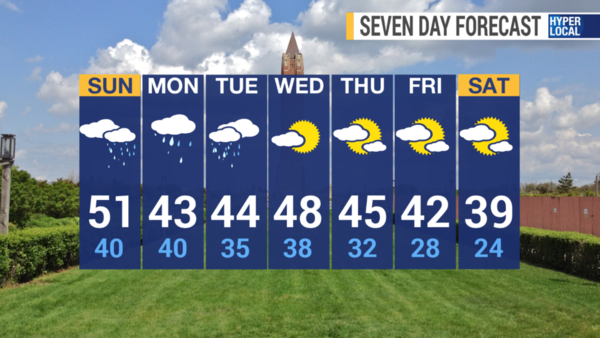 A better chance for steadier rain arrives on Wednesday. Wednesday will be the last day of these warmer temperatures for now, but it comes with some rain and wind. By the end of the week we're seeing high temps close to normal for this time of the year. 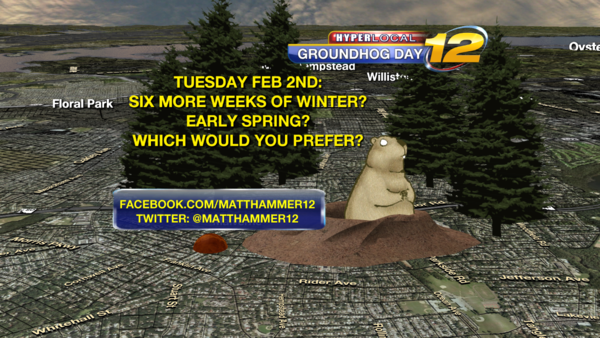 With Tuesday being "Groundhog Day" - which would you rather? Six more weeks of winter or an early Spring? Let me know! 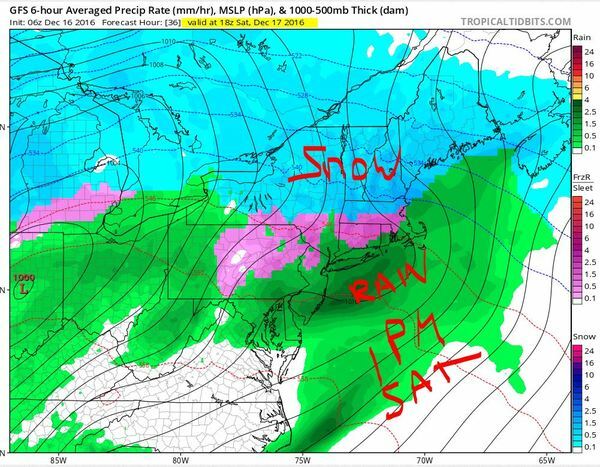 UPDATE BY METEOROLOGIST RICH HOFFMAN 1030AM FEBRUARY 2ND. 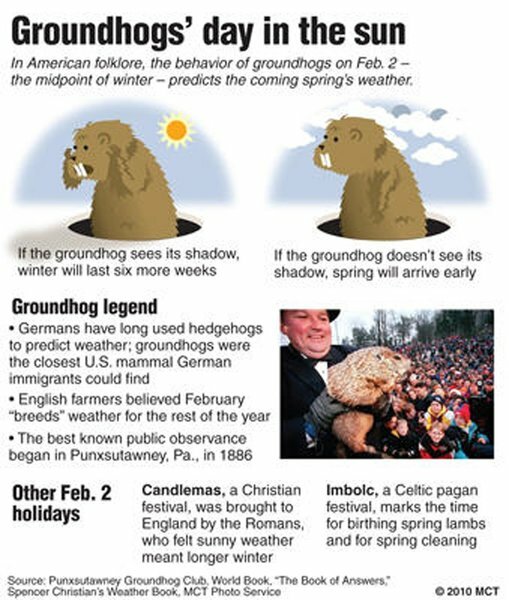 Holtsville Hal, Malverne Mel, Punxsutawney Phil and Staten Island Chuck all reported NO SHADOW - which means spring is right around the corner. It has felt like more spring than winter. Besides a few days of really cold weather temperatures have been well above normal. METEOROLOGICAL SPRING STARTS IN 28 DAYS - ASTRONOMICAL SPRING STARTS in 46 days March 20, 12:30 A.M. EDT .......Daylight Saving Time Begins Sunday March 13th at 2am. 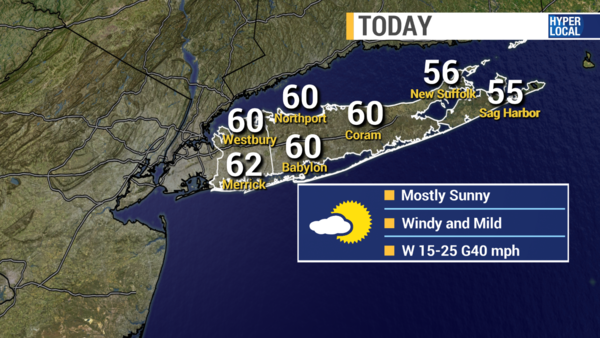 TODAY: Mostly Sunny and Mild.. 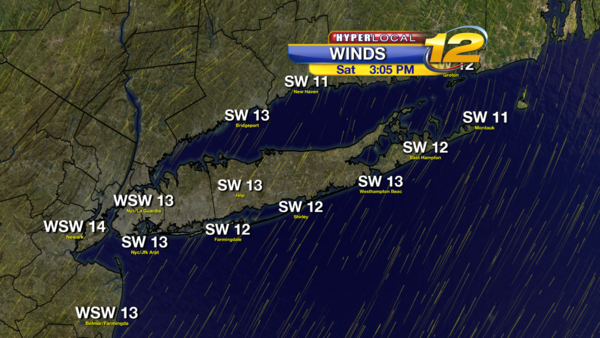 Winds North shifting to Southeast 5 to 10 mph. 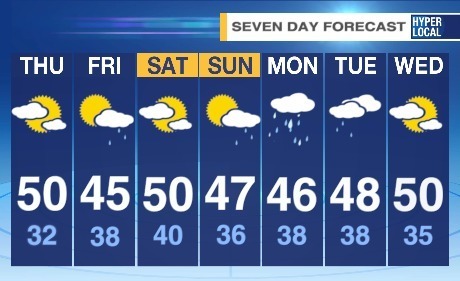 Highs 46-52. Sunset: 5:12pm. TONIGHT: Increasing Clouds. Winds Southeast 5 to 10 mph. Lows near 37. Sunrise: 7:01am. Normal Average Low is 23. TOMORROW: Cloudy skies. Windy. Rain developing towards afternoon. Heaviest Rain will be 4pm to 9pm. Chance of thunderstorms. Winds South-Southeast 10 to 20 gusts to 35 mph. Highs near 57. Weather Below shows Storm bringing periods of rain, chance for thunderstorms and gusty winds. 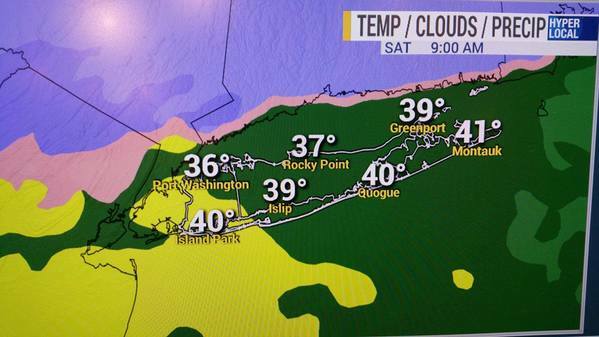 The cold air is locked away from Long Island. OVERNIGHT: Cloudy skies with rain ending. Windy. Rain Totals .75" to 1.25". Lows 30 to 35. THURSDAY: Morning clouds chance of showers before 9am. Partly Sunny in the afternoon. Mild. Highs 45 to 50. OVERNIGHT: Partly Cloudy. Cold. Lows 22 to 28. FRIDAY: Sun and Clouds. Breezy. Highs near 39. 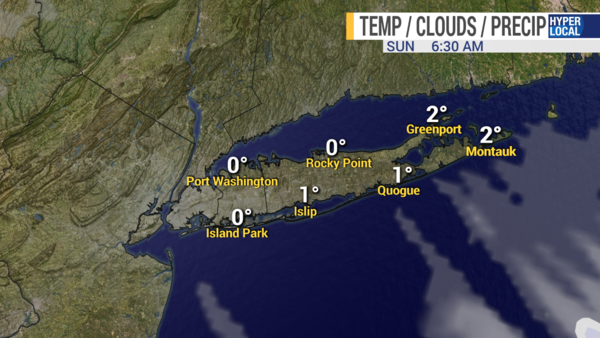 OVERNIGHT: Clear and Cold. Lows 25 to 30. SATURDAY: Mostly Sunny. Highs near 40. OVERNIGHT: Partly to Mostly cloudy. Lows near 30. SUNDAY: Sun and Clouds. Highs 42 to 47. OVERNIGHT: Mostly Cloudy. Lows 25 to 30. 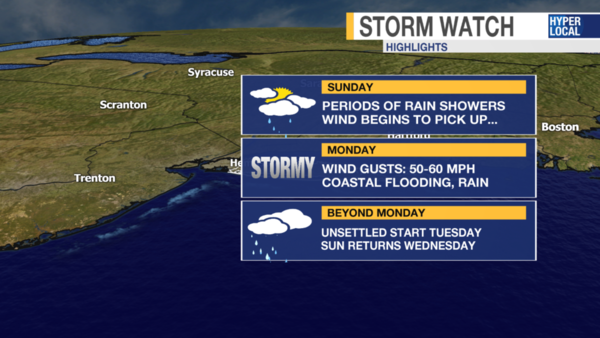 MONDAY: TRACKING A COASTAL STORM. Cloudy skies. Rain Developing. May start as some snow. Highs near 40. After temperatures in the 50s and 60s this week, Yes we can end the work week with snow. Still a question on how strong and how far west will the storm move. 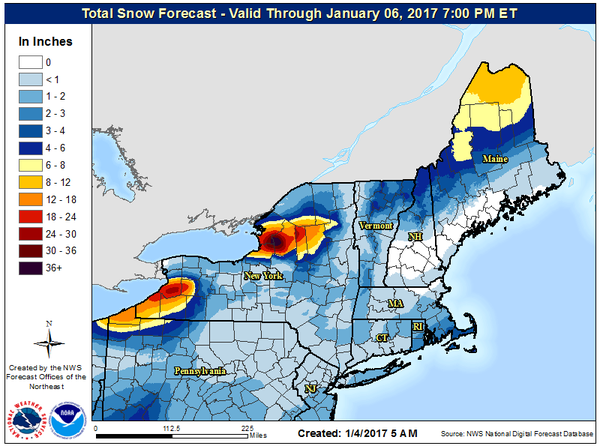 Here is current forecast: Scroll Down to see snowfall totals from weather computer models. 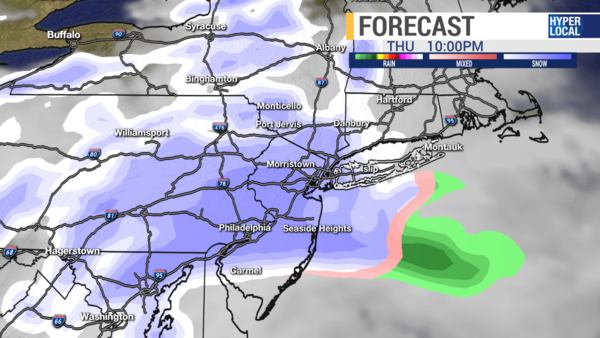 TONIGHT: Tracking storm which looks to bring some snow accumulation into Friday morning. 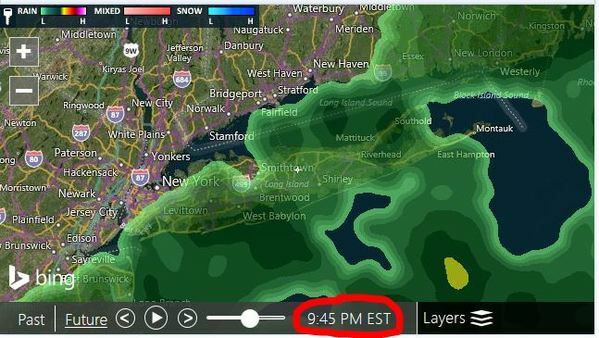 Light rain developing between 8pm and Midnight. 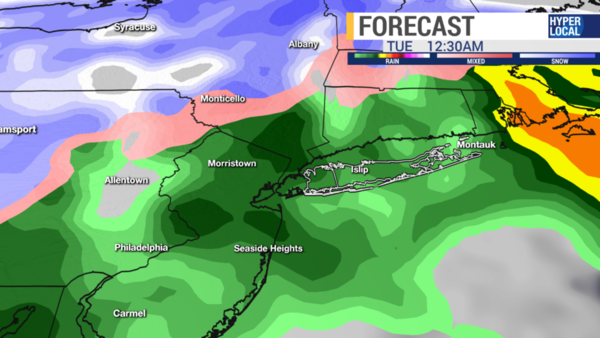 Rain mixing with and changing to snow towards morning. Some brief moderate snow is possible. Winds North 5 to 15 mph. Lows 30 to 35. 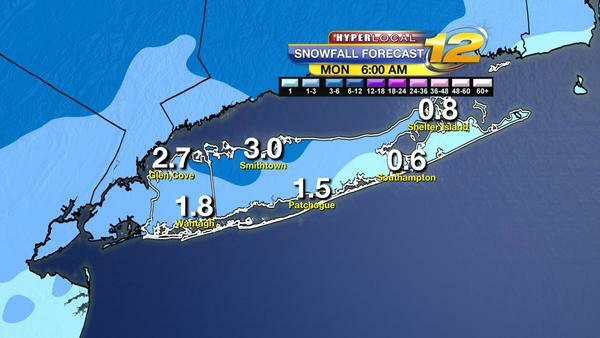 Slushy Snow Accumulations 1 to 3 inches Highest Amounts in Suffolk County. 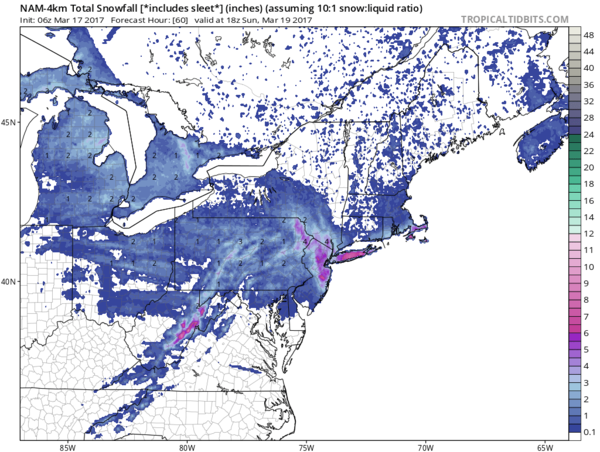 Any change in intensity or track of storm we could see some more or less snow. IF COLD AIR COMES CRASHING IN FASTER WE COULD SEE 3 TO 6 INCHES. 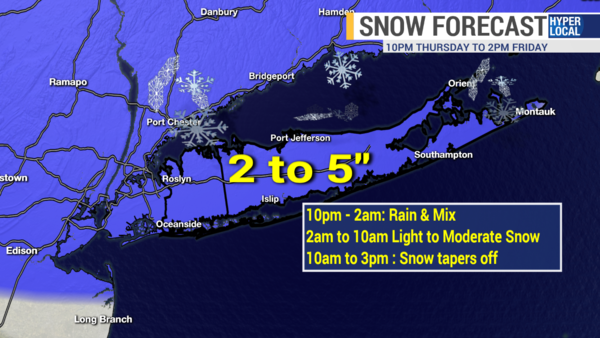 Rain to Snow: Rain to snow in Nassau County Midnight to 3am, Suffolk County 1pm to 4am. All Snow with some drizzle and a little rain 4am - 9am. 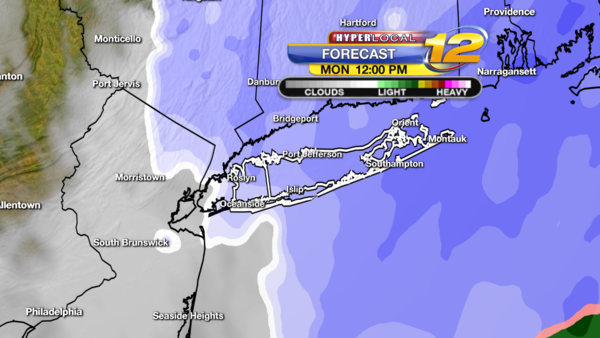 Some moderate snow possible during morning rush hour. 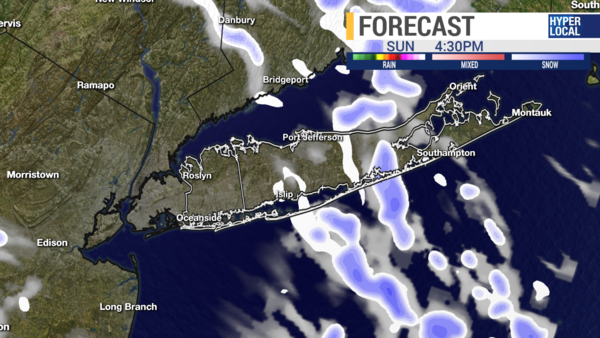 Snow Ends: West to East: Snow ends Nassau County 8am to 10am, Western Suffolk County 8am to 11am , East End 10am to 1pm. 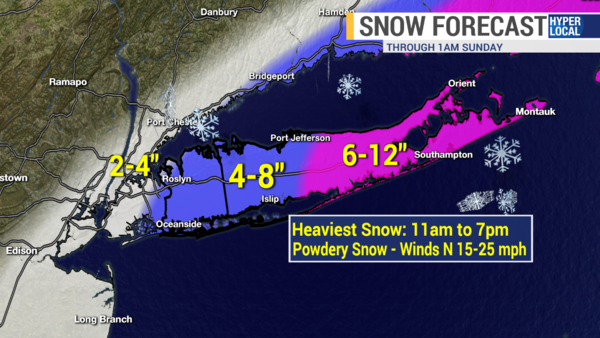 Highest snow totals will be in Suffolk County. 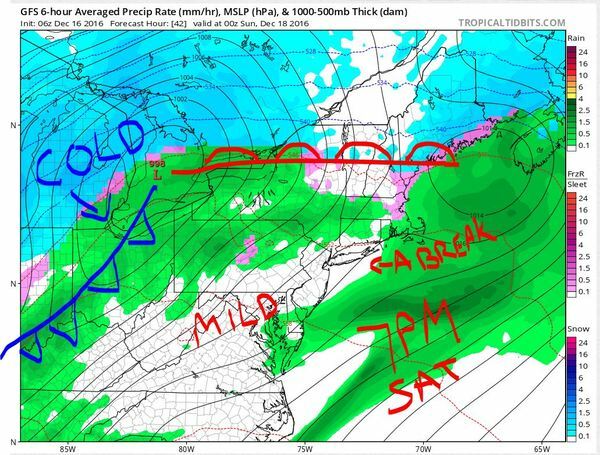 Weather maps below are for Thursday night into Friday Morning - you can see timeline of the event. 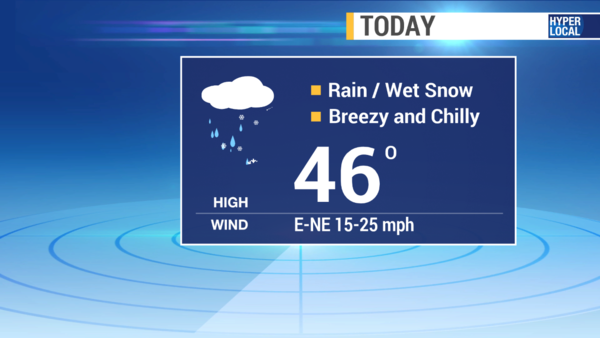 TOMORROW: Cloudy skies with Morning snow, may mix with rain and drizzle. Could be a sloppy morning rush hour. 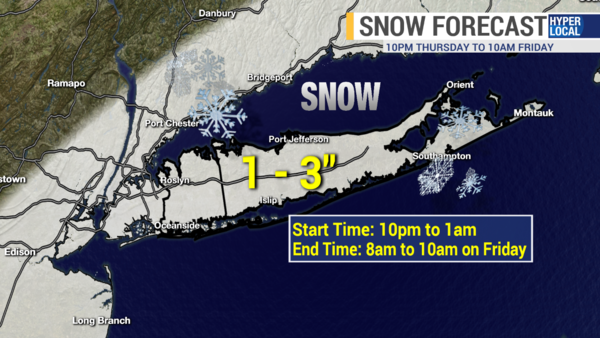 1 to 3 inches of snow possible, highest amounts in Suffolk County. 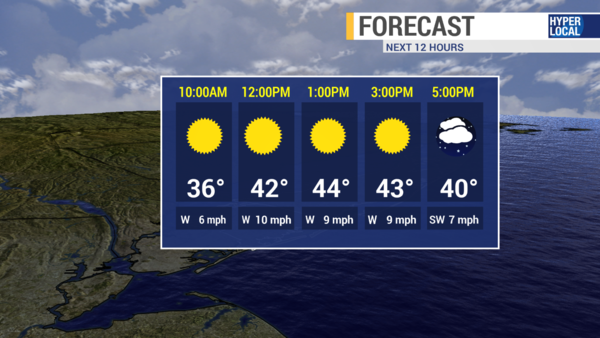 Sun and Clouds in the afternoon with highs around near 40. Windy. Winds North 10 to 20 some gusts to 25 mph. 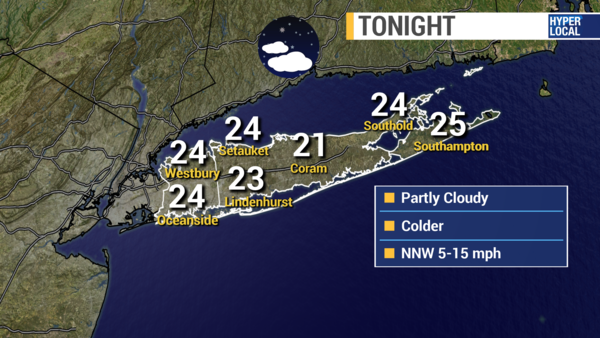 OVERNIGHT: Clear skies and cold. Lows 22 to 27. SATURDAY: Mostly Sunny. Highs 40 to 45. OVERNIGHT: Partly Cloudy. Lows 25 to 30. SUNDAY: Mostly Sunny Skies. Highs 40 to 45. OVERNIGHT: Partly Cloudy. Lows 23 to 28. MONDAY: Partly Sunny to Mostly Cloudy. Highs 35 to 40. 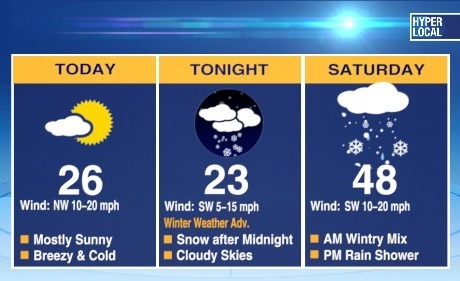 OVERNIGHT: Mostly Cloudy, chance of snow towards morning. Lows 25 to 30. 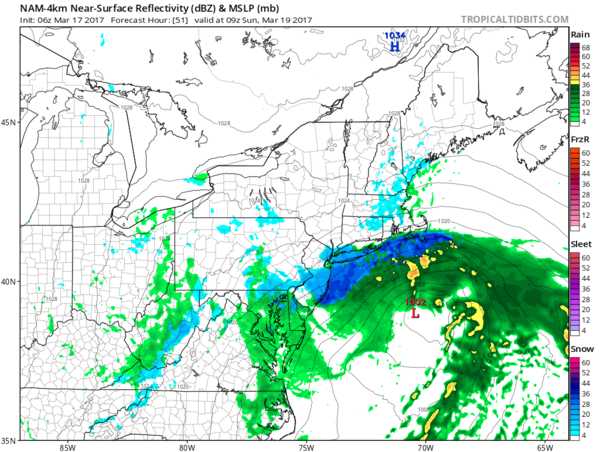 TUESDAY: TRACKING COASTAL STORM. Cloudy skies with rain and snow. Depending on track of snow, chance of moderate snowfall. Highs in the mid 30s. 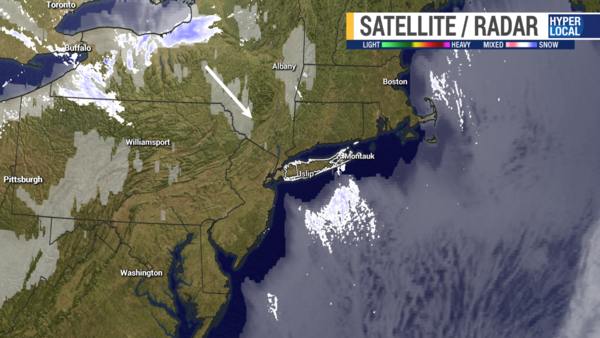 OVERNIGHT: Cloudy skies with snow showers. Lows 25 to 30. WEDNESDAY: Clouds with chance of snow in the morning. 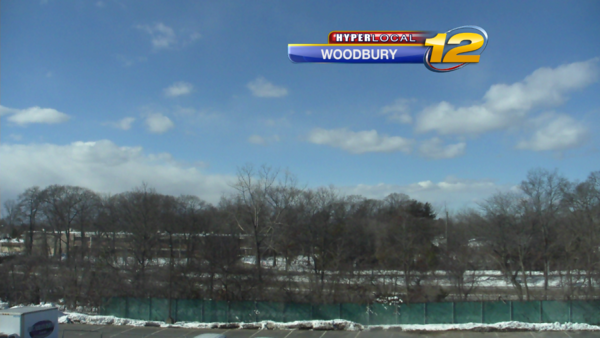 Partly Sunny, breezy and cold for the afternoon. Highs 32 to 37. OVERNIGHT: Partly Cloudy and cold. Lows 20 to 25. 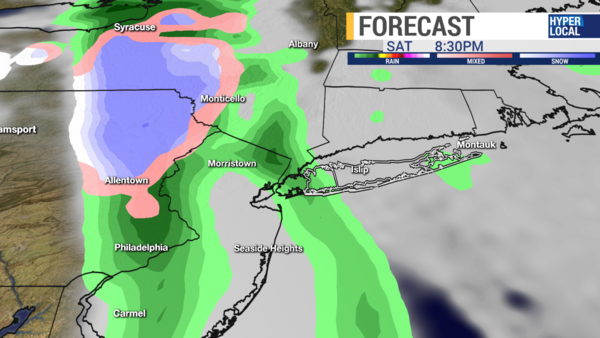 Rain will change to snow starting around 2 am on the west end and 5 am on the east end. 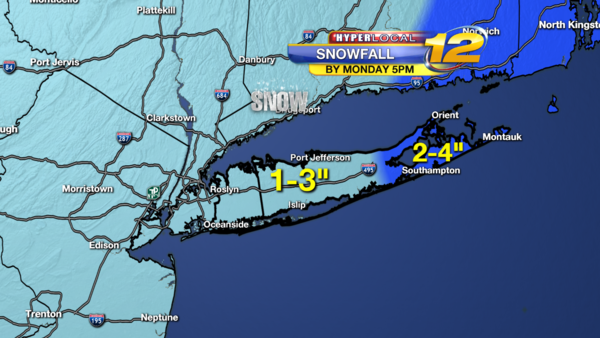 Snow will be steady through the morning commute and roads will become slippery. 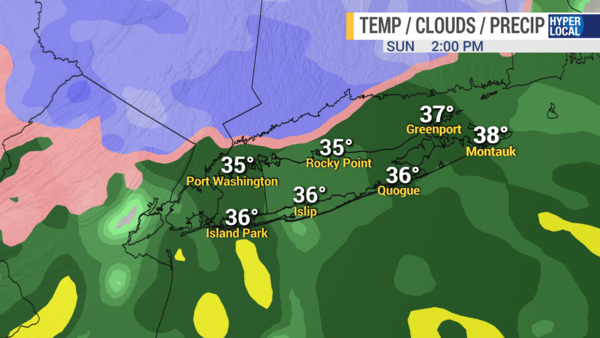 Temperatures slightly above freezing means there will be some melting at first. 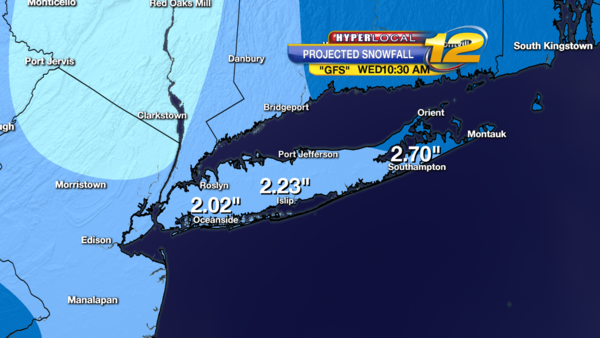 A slower moving storm could increase these amounts by and inch or two in some spots. 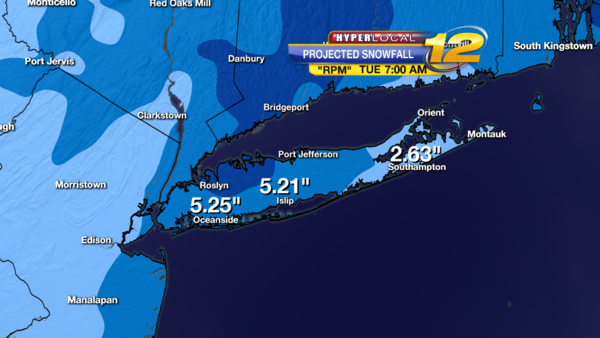 Current snow total projections. Heaviest expected in central Suffolk. 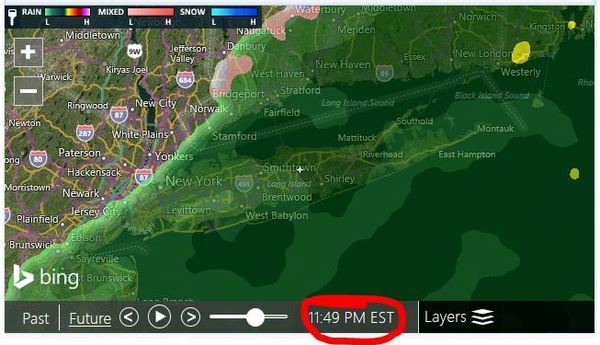 Rain will change to snow after 2 am. As we go through our weekend, we have to keep watching the potential for more snow to start the week on Monday. However, until then, we are looking good! 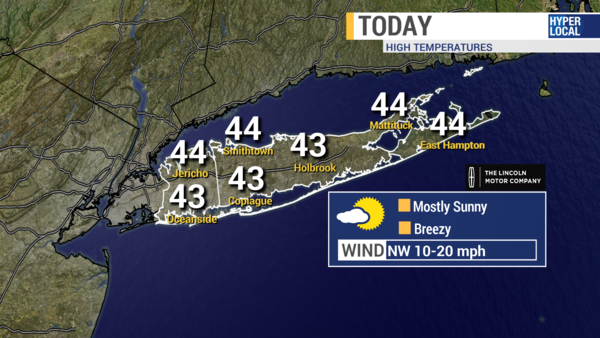 A mix of sun and clouds today with highs around 40 degrees. This will help with the snow melt, but by tonight, as lows dip back into the 20's, we'll have to watch out for refreezing and icy spots again. 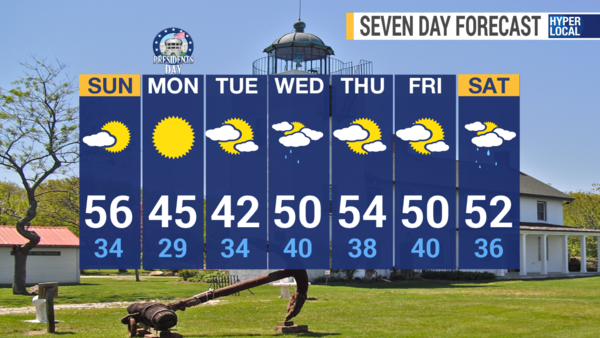 On Sunday, expect partly sunny skies and highs around 44 degrees. Now, you may be hearing about the potential for more snow next week. Here's what we know. 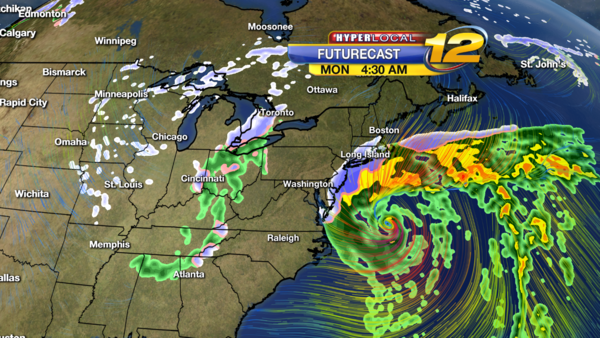 There will be a coastal storm with the center of that storm southeast of Long Island. There is still a wide range of possibilities for this storm. 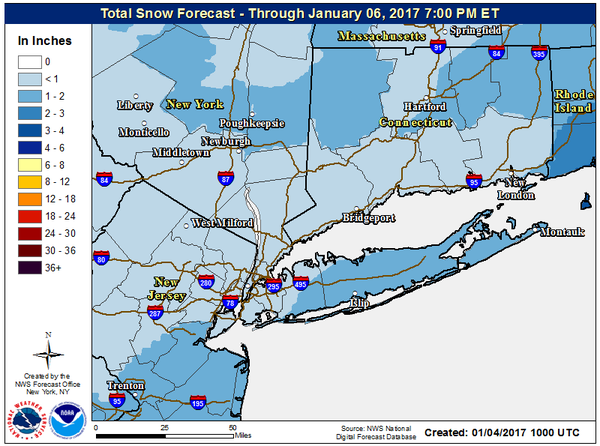 As of now, the WORST CASE SCENARIO would be light snow overspreading Long Island early Monday morning with some gusty winds to 30-35 mph. 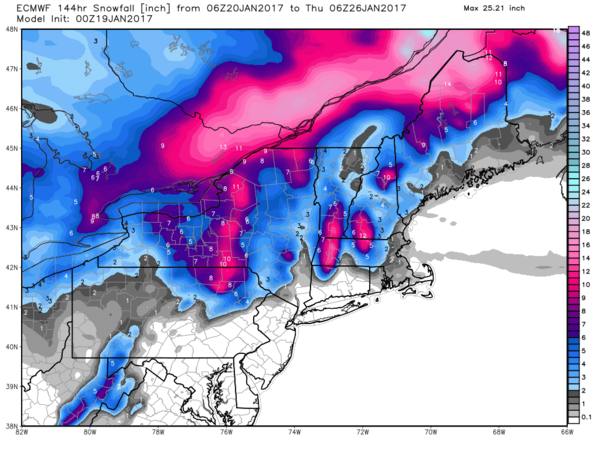 A few of the computer models (EURO, GFS) continue to keep the storm far enough away on Monday to provide us with much, if any snow. You will want to stay tuned for the latest through tomorrow. So, there is still a lot to iron out through tomorrow regarding our weather to start next week. There is definitely still the chance at some snow Monday through Wednesday - not snowing the entire time. Stay with us as we sort it all out for you through the weekend - and be safe on those icy spots again tonight! 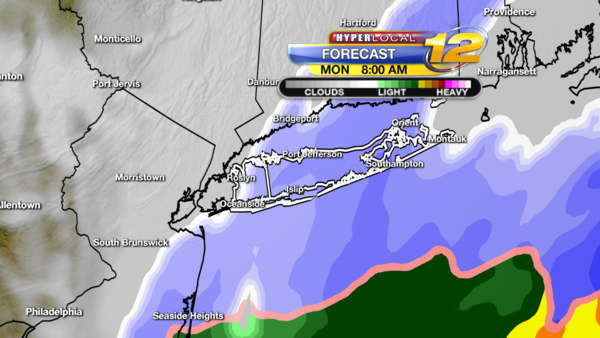 Take a look at the futurecast slideshow below...hit the arrow to the right to move through the latest projections. The blue of course is the snow! PART TWO: Monday night through Tuesday night expect periods of light snow and flurries amounting to an additional 1 to 3 inches by late Tuesday night. Unlike our last storms, these totals happen over a long duration which will help keep the impacts minimal. Again, some light snow and flurries will remain with us through Tuesday night with light additional accumulations. We could still have a few lingering flurries Wednesday morning. 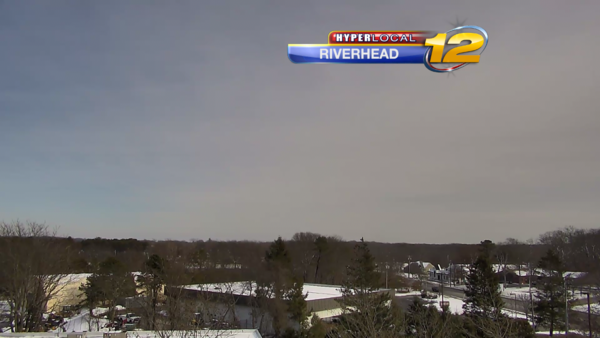 After that it's dry, but EXTREMELY COLD as we head towards Valentines Day weekend! Have a great rest of your Sunday! Enjoy the super bowl if you're watching! 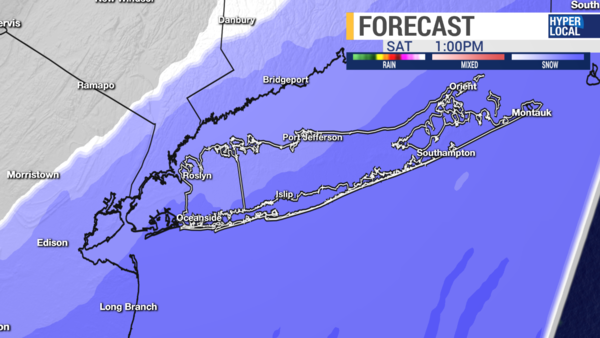 Expecting 2-4" in Nassau through 5pm and up to 4-8" in Suffolk with today's storm. 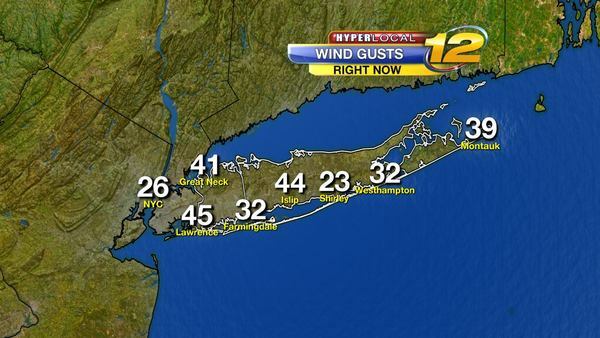 Winds gusting to near 35 mph. Expect light snow and flurries throughout tonight and into the day tomorrow. 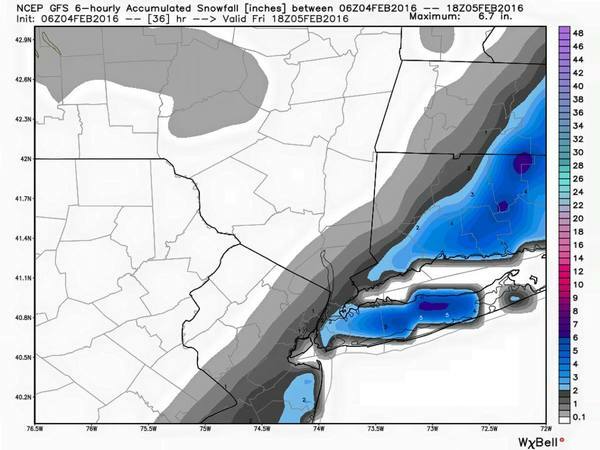 Some additional accumulation possible from tonight through Tuesday night of 1-3"
Full updates on News 12 and News12.com through the day! Be sure to share your snow photos and videos with us...be safe! 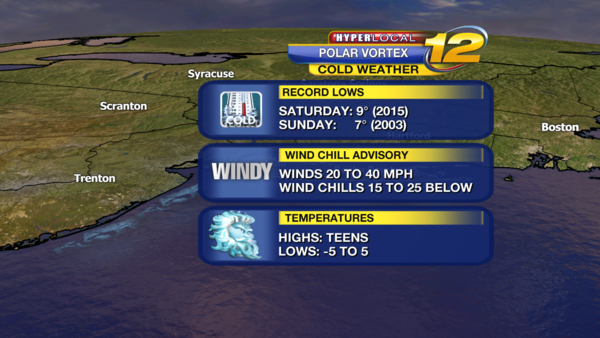 Very Cold record setting low temperatures this weekend - Wind Chill Advisory posted 4pm Saturday to Noon Sunday. 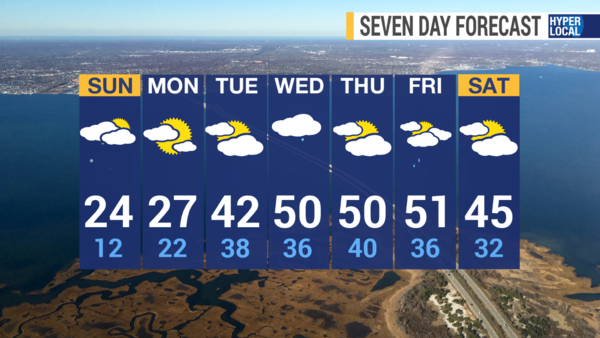 Temperatures warm late Monday into Tuesday as a storm approaches Long Island. TONIGHT: Mostly Cloudy with some scattered snow showers or light snow. Dusting to 1 inch of snow accumulation possible. Lows around 15. 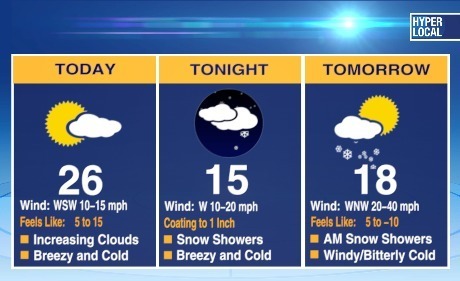 Wind Chills 5 below to 5 above degrees. 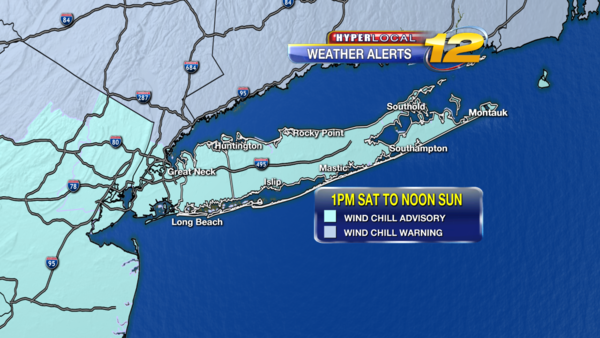 SATURDAY: WIND CHILL ADVISORY 4PM TO NOON SUNDAY. 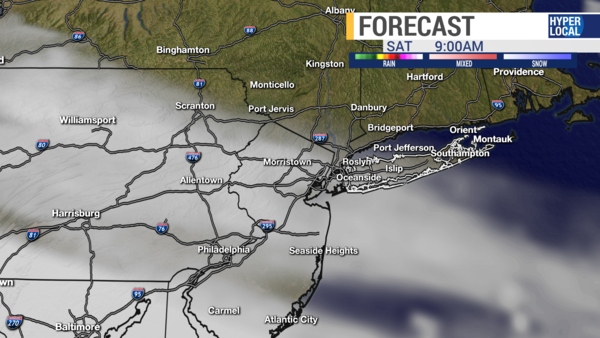 Clouds and a few snow showers in the morning. Some minor snow accumulations. Breezy and Very Cold. Temperatures in the morning 15 to 20 degrees, dropping to 10 to 15 degrees by 4pm. Winds Northwest 20 to 40 mph. Wind Chills Zero to 15 below. 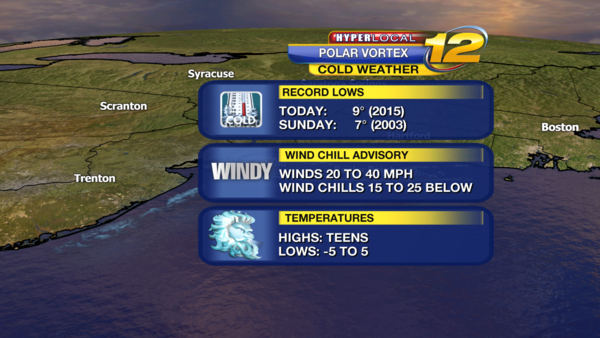 SATURDAY NIGHT: Record Low before midnight for February 13th is 9 degrees set in 2015.Clear, windy and FRIGID. Lows 5 below to 5 above. Record Low for February 14th is 7 set in 2003. 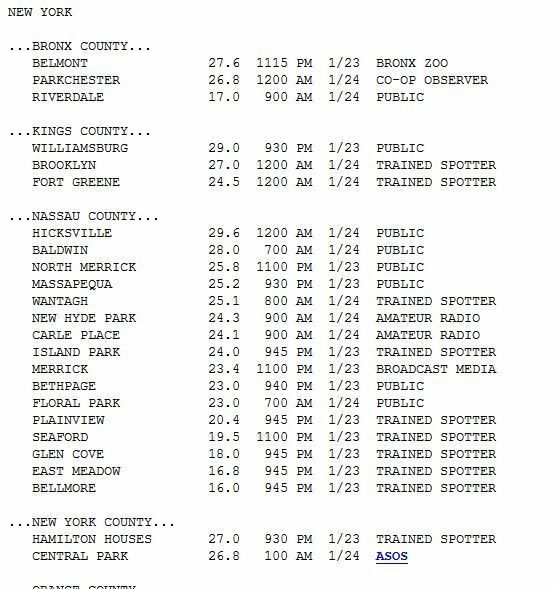 Islip has not been below zero since January 15th 1988. Wind Chills 15 to 20 below. Dangerously Cold Weather- bring Pets indoors. Pipes could burst, let water run. Dress in Layers. Check on Elderly. SUNDAY: WIND CHILL ADVISORY THROUGH NOON. Dangerously Cold Weather- bring Pets indoors. Pipes could burst. In the morning, Clear, windy and FRIGID conditions. Temperatures 5 below to 5 above. 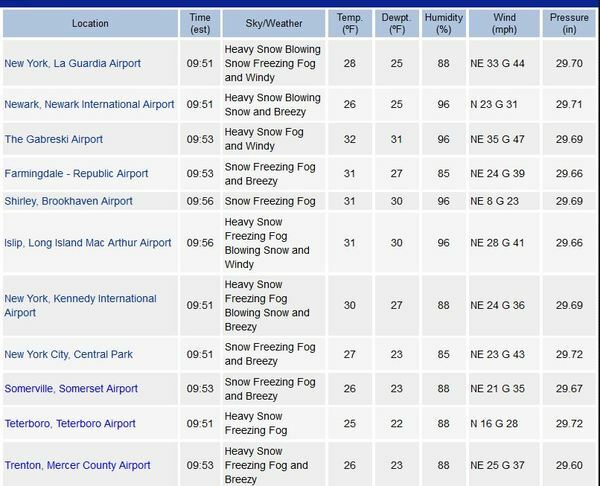 Islip has not been below zero since January 15th 1988. 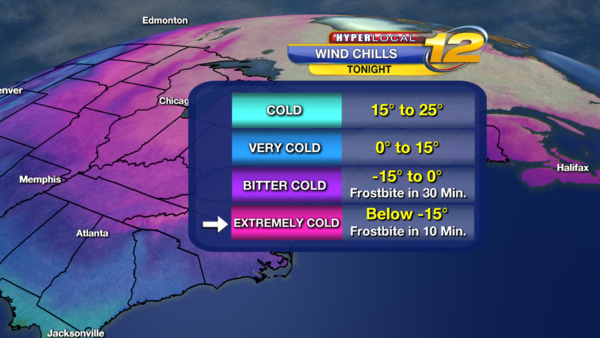 Wind Chills 15 to 20 below. 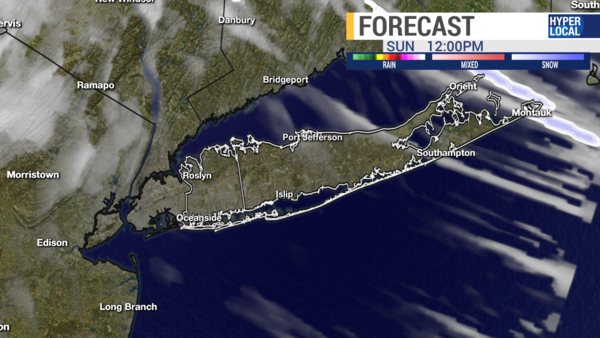 Mostly Sunny Skies for the afternoon. 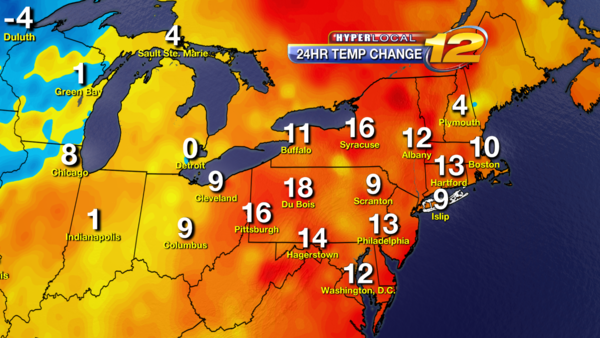 Highs 13 to 18. Wind Chills Zero to 15 below. SUNDAY NIGHT: Mostly Clear skies. 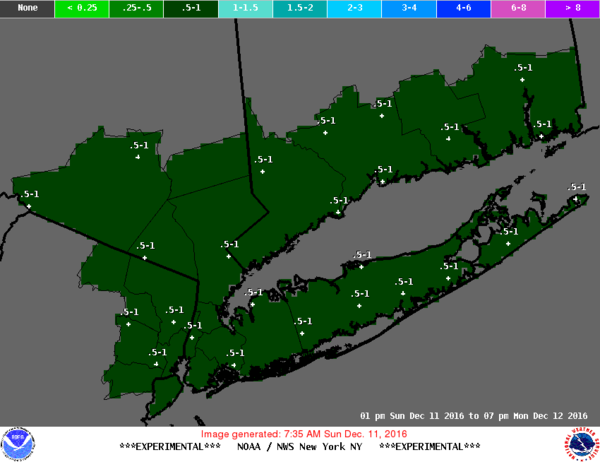 Lows zero to 10 above, Some locations in the Pine Barrens could be below zero. 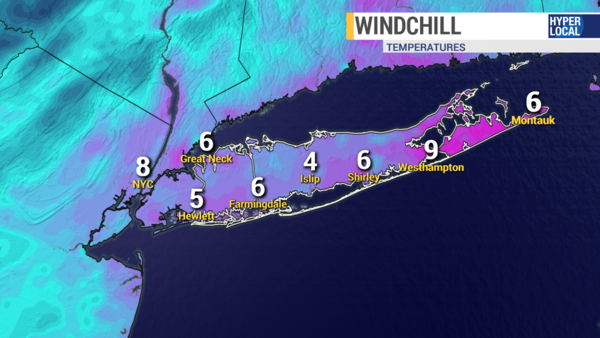 Wind Chills 10 below to 5 above. Record low is 3 set in 1994. 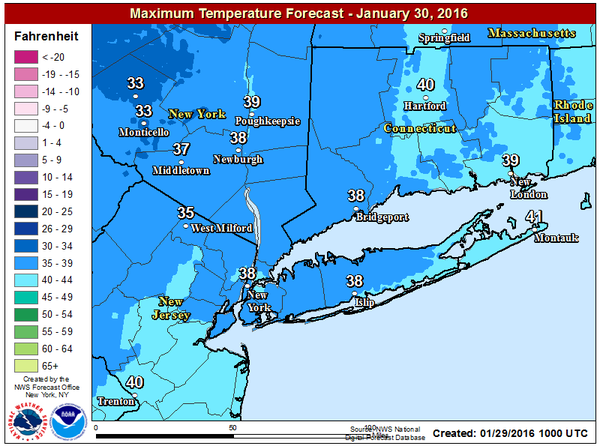 MONDAY: Cold in the morning with temperatures zero to 10. Morning sunshine giving way to late day clouds. 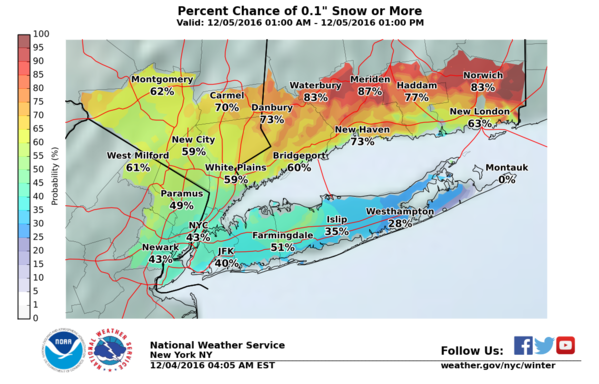 Chance of snow towards evening. Highs near 33. 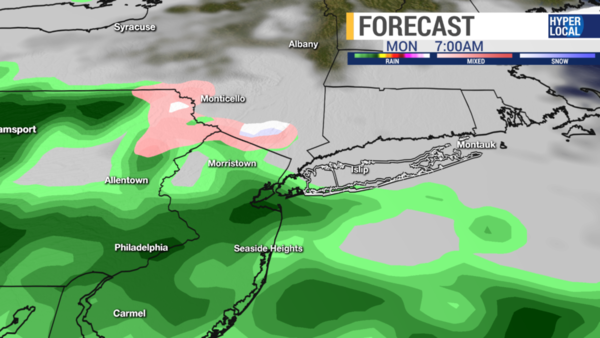 MONDAY NIGHT: Cloudy skies with snow changing to rain. Some rain will be heavy at times. Breezy. 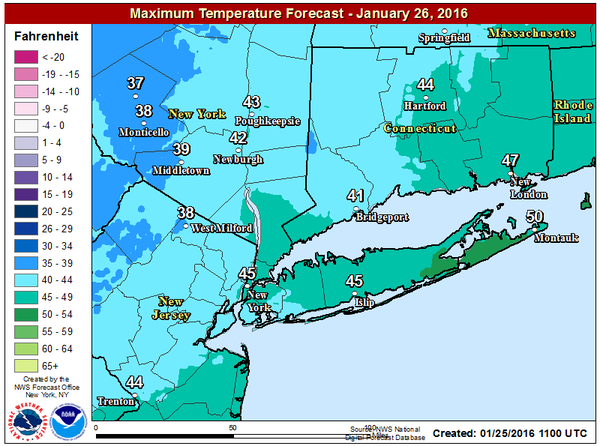 Lows near 31, temperatures rising to 40 by morning. 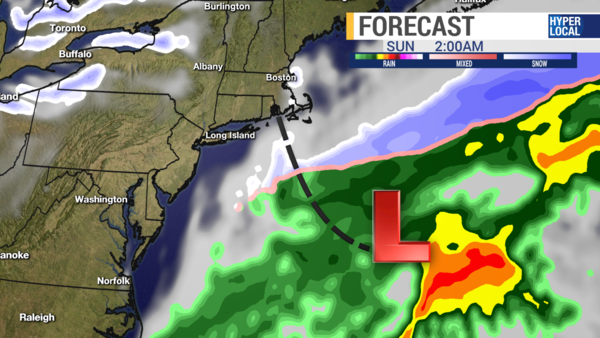 STORM AS OF NOW WILL GO OVER OR TO WEST OF LONG ISLAND - This will allow warm air to move over long island. It will be warm, wet and windy. TUESDAY: Cloudy skies with periods of rain. Some rain will be heavy at times. Windy. Highs 43 to 50. TUESDAY NIGHT: Cloudy skies with showers. Lows near 38. WEDNESDAY: Morning clouds, chance of showers. Sun and Clouds in the afternoon. Highs near 42. WEDNESDAY NIGHT: Partly Cloudy. Lows near 32. THURSDAY: Sun and Clouds. Colder. Highs near 34. THURSDAY NIGHT: Mostly Clear and cold. Lows near 22. It's the bitter blast of cold air we've been advertising all week now and it will certainly pack a punch! Wind chills this morning were already in the single digits and those "feels like" readings will drop considerably through the day and into tonight. A Wind Chill Advisory lasts until 12PM Sunday for winds 20-40 mph and those wind chill readings as low as around -20 degrees overnight. TODAY: Expect clouds with breaks of sunshine. There is the chance for a brief snow shower through the day. Bitterly cold with highs around 18 degrees in the morning. 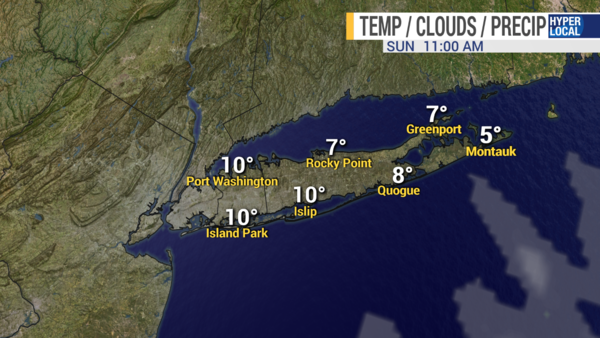 Temps will fall towards 10 degrees by this evening. 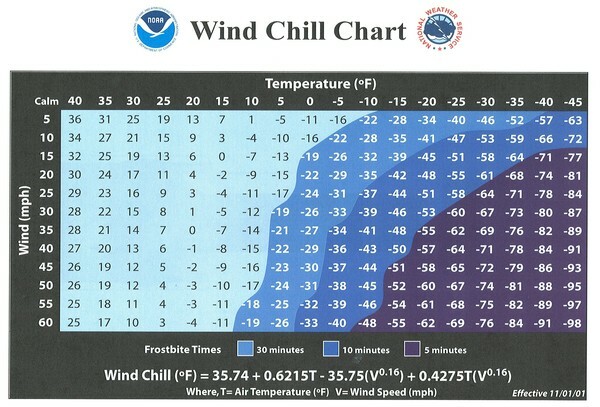 Wind Chills: -5 to 5 degrees. Winds NW 20-40 mph. During this extremely cold weather, be sure to check tire pressure, bring any outdoor pets inside, keep a light drip from faucets to lessen the chance of pipes bursting and try to stay indoors as much as possible. 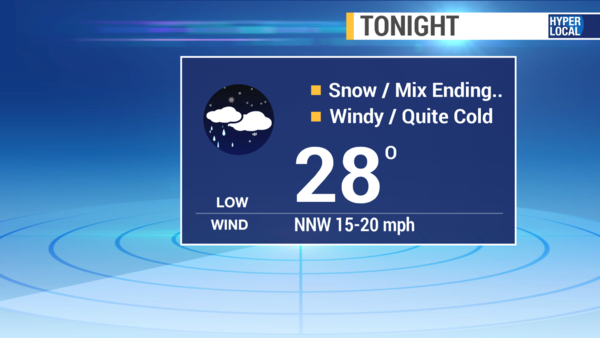 TONIGHT: WIND CHILL ADVISORY CONTINUES... 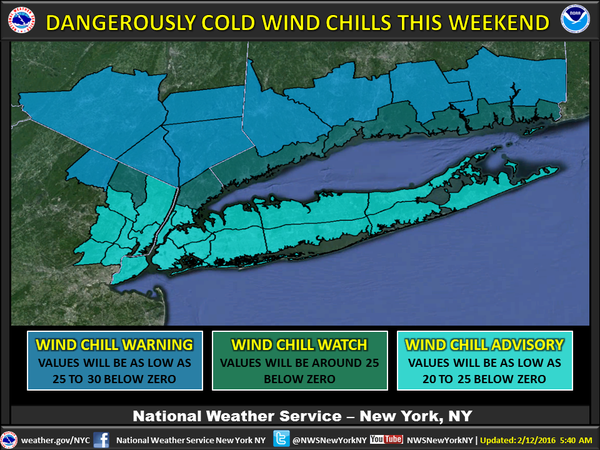 Dangerously cold with air temperatures around 0 degrees and wind chills -15 to -20 below zero. Previous record low for tonight before midnight is 9 degrees set last year. Record low for Feb. 14 is 7 degrees set last in 2003. 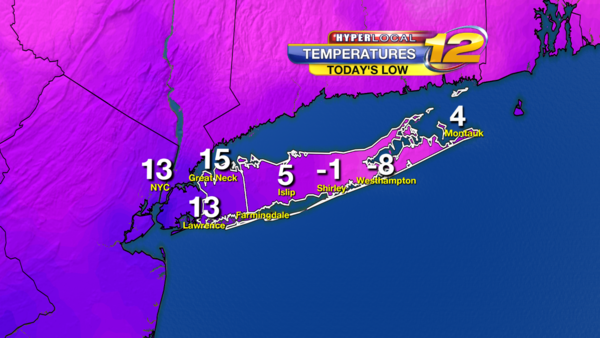 Islip has not seen below 0 temperatures since Jan. 15th 1988. Partly cloudy skies. Winds NW 15-35 mph. Later tonight, wind chill values will get into the "extremely to dangerously cold" category. It wouldn't take much longer than 10 minutes to get frostbite on exposed skin - be careful! 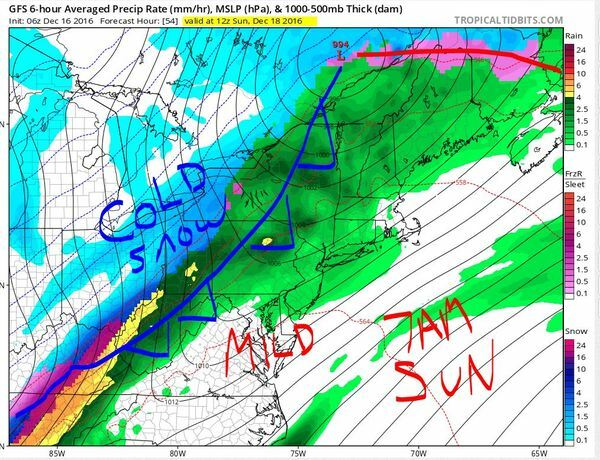 Use the arrows to the right of the slideshow below to see our chance for a few nearby flurries or a snow shower through this afternoon along with the temperatures at that time. Remember, wind chills will be much lower than that! 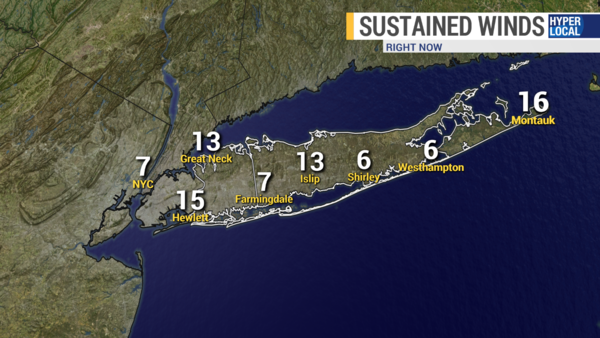 Not feeling a WHOLE lot better by late Sunday morning...still feeling like the single digits! Be safe in this cold this weekend! Please give me a follow and a 'like' on Facebook and Twitter so we can all better interact about Long Island weather - thanks! Good afternoon! After a frigid weekend with some record-setting low temperatures, we started off this President's Day with more of the same bitter cold...Check out today's morning lows below - we were just two degrees shy of tying a record low for the day at Islip. 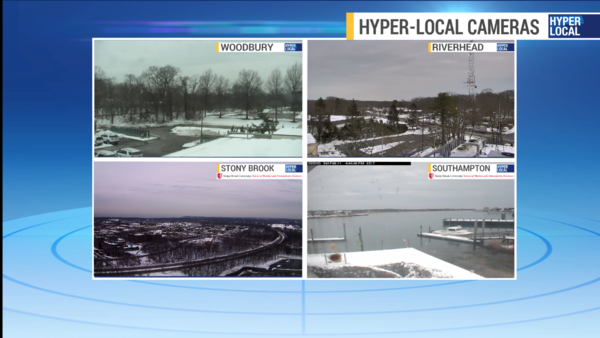 We had some scattered light snow and flurries this morning, but the worst of today's weather starts this afternoon. Take a look at the futurecast images below. Snow transitions to a brief wintry mix and then freezing rain by this evening. That could make for some very icy roads this evening and into early tonight. Even when air temperatures just above the surface warm to above freezing, it will still take the ground a bit longer to warm up due to the extreme cold we've had the past several days. That's when we need to worry most about the freezing rain leading to a glaze of ice on area roads. It does not take much ice to create for very dangerous travel - be careful through this evening! A round of very heavy rain moves through Tuesday afternoon leading to localized flooding...highs in the 50's! 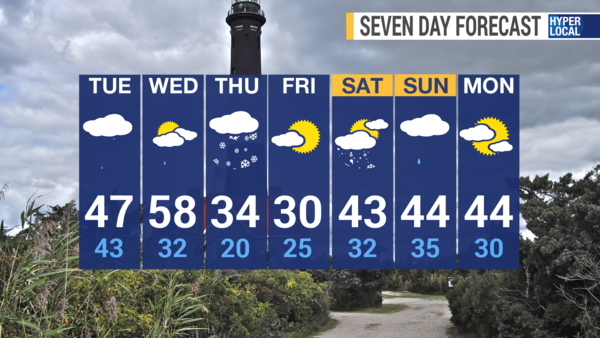 After this storm, we dry out on Wednesday with much more seasonable air returning. It will stay dry through Friday. 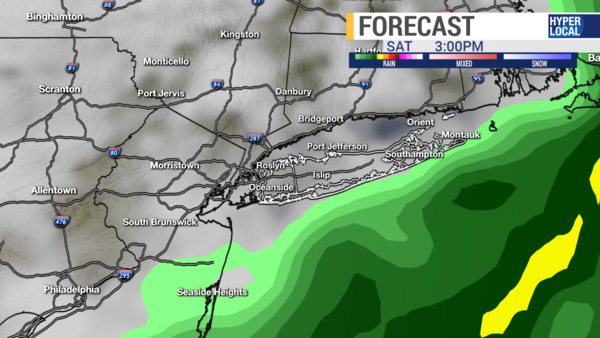 Then, we have the chance for a few scattered showers to start the weekend on Saturday. Have a great day and be safe on the roads if you have to travel this evening! 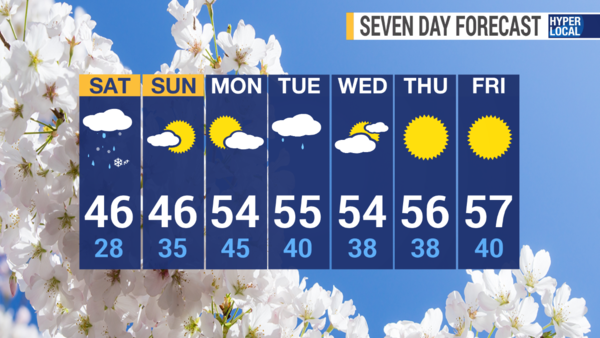 Hopefully you're ready to enjoy some warmer temperatures this weekend! Take a look at our early morning low temperatures today. We started the day around where our normal daytime highs should be. Normal HIGH = 41 degrees. The milder temperatures are in part thanks to a warmer wind out of the southwest between 10 and 20 miles per hour today. We do have to keep our eye on later Sunday night into early Monday morning. 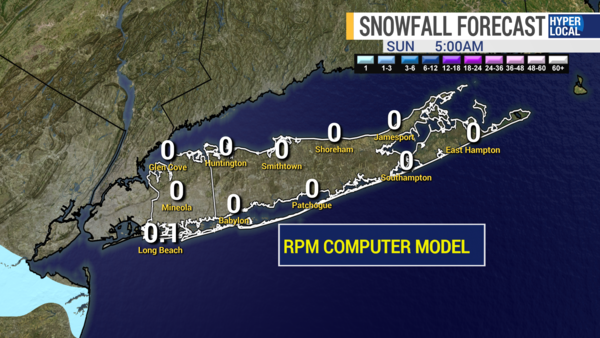 Yesterday it was looking like more of a snowy to wintry mix scenario for Long Island. Overnight, the computer guidance mostly shifted this SOUTH. So, will this stay south or will the computers flip flop back and forth on this? Right now, I'd lean towards the more south scenario and just a few nearby rain showers Sunday night and early Monday, but we will keep watching it closely just in case. 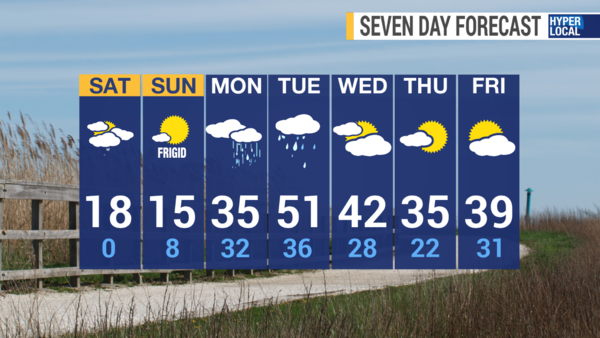 After our warmer weekend, temps drop to around 40 on Monday. 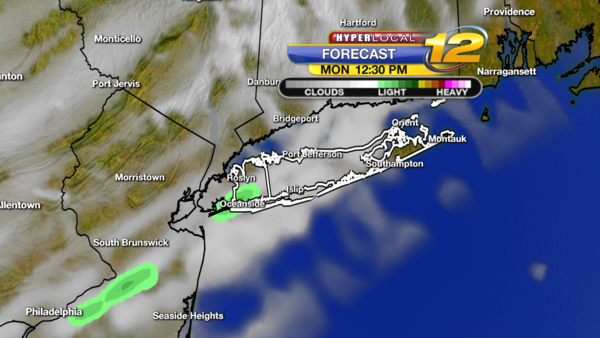 Increasing sunshine for Monday afternoon. Mainly cloudy with a few sun breaks Tuesday. Mostly cloudy with a few showers on Wednesday and a better chance for a more soaking rain later Wednesday night and through Thursday. The exact timing on that heavier rain is subject to change over the next couple of days. 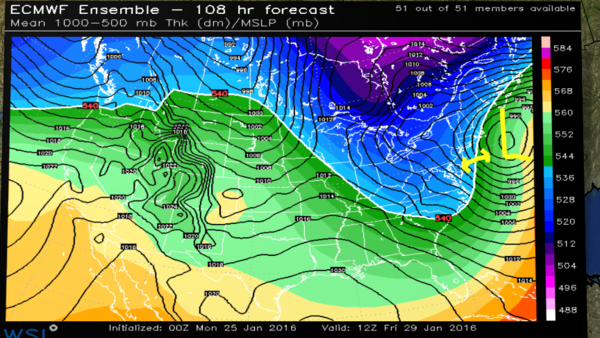 By next Friday, much colder with highs back in the low 30's. 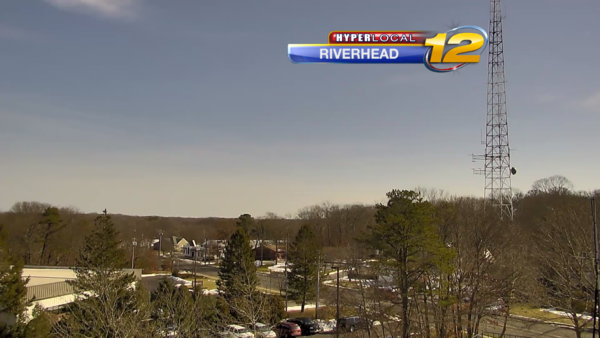 We actually set a new record leap day high at Islip MacArthur Airport just before 5pm! We hit 58 degrees then which broke the previous record for Feb. 29th previously set in 2004. 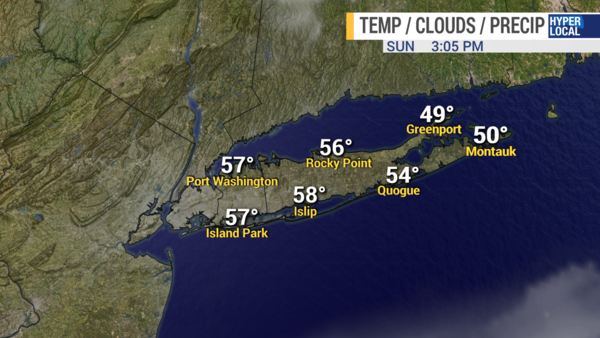 If you were in Nassau County, you had temperatures in the low 60's today. Our normal, average high this time of the year is 43 degrees. However, some cooler air is on the way. 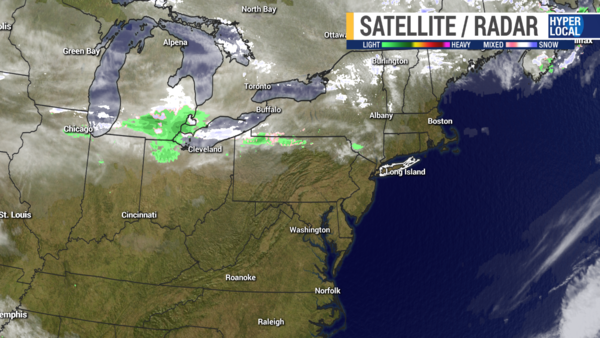 Satellite and radar will look like the above image throughout the overnight hours - nice and dry. So, let's recap what's on the way. 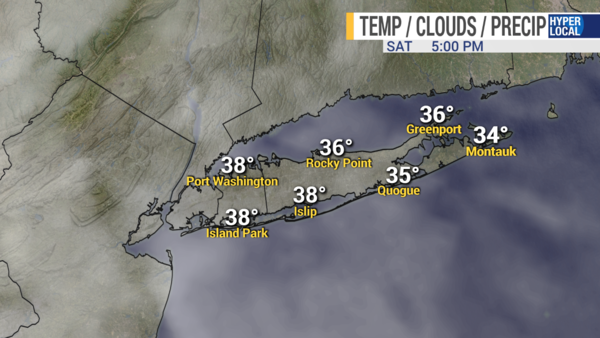 Overnight - partly cloudy and colder with lows in the 30's. 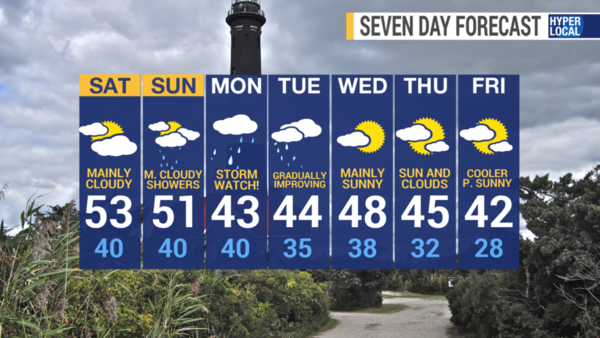 Tuesday starts dry, then cloudy with showers later Tuesday night. 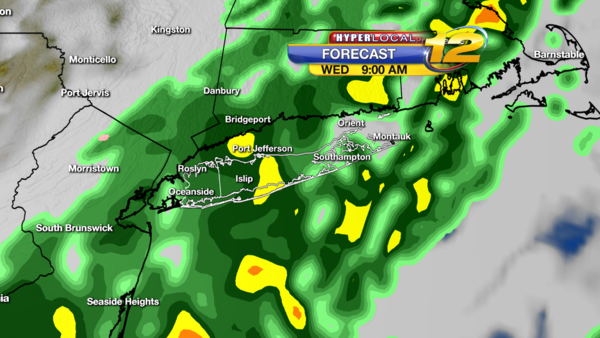 Periods of rain, especially through Wednesday morning. 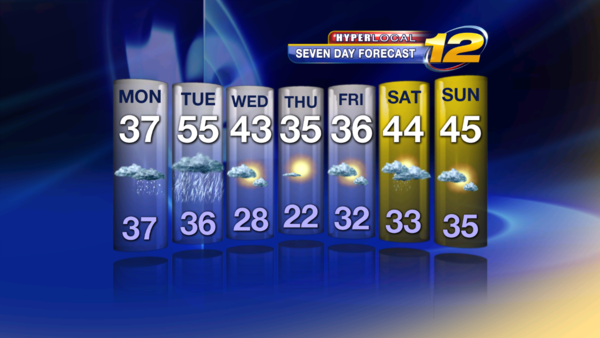 Over the next seven days, after those showers Wednesday morning, it turns colder for Thursday, but it will be dry. 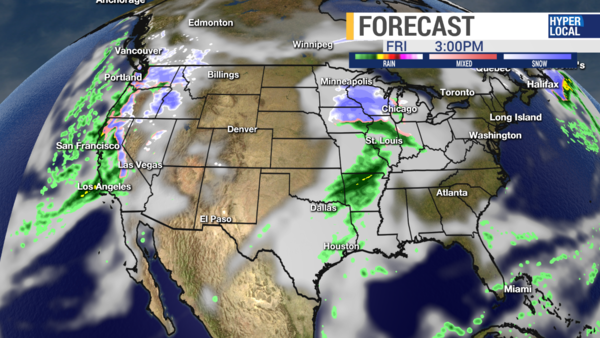 We are tracking a coastal storm for Friday. 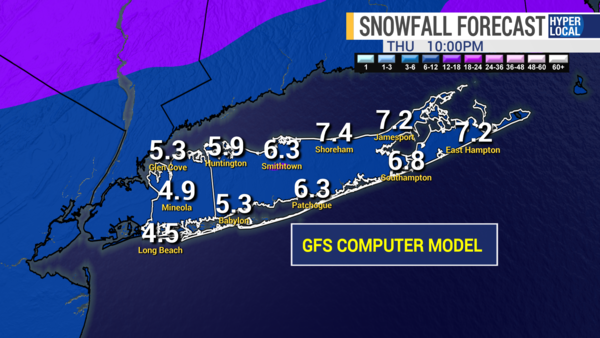 The computer models MAINLY keep this system offshore for right now, but if there is an adjustment to this then that could mean we would see more snow for Long Island. It's something we'll track closely this week. 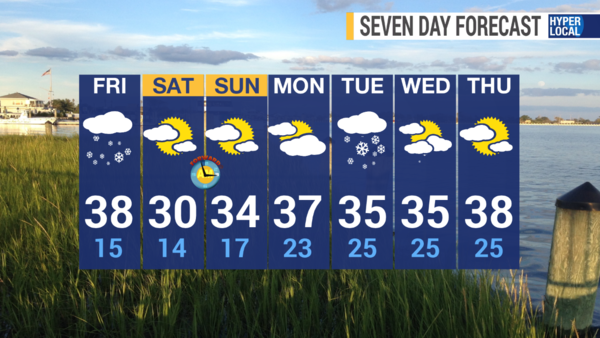 Dry after that for the start of the weekend and then we could see a few snow showers by Sunday. 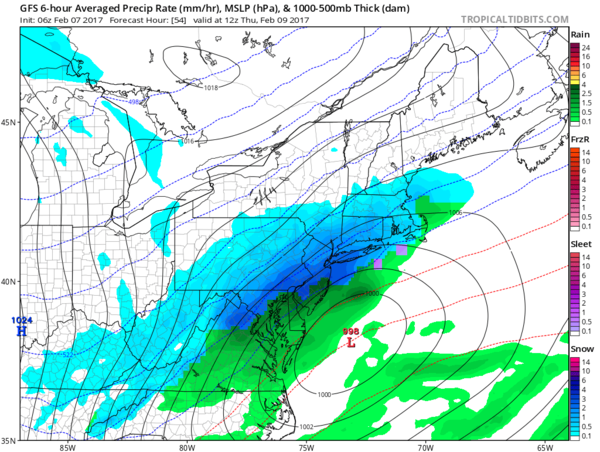 Update by METEOROLOGIST RICH HOFFMAN - 1PM MARCH 2nd. March can have some pretty wild weather. One day highs near 60 the next day it snows. The Record High for the month is March 13th 1990 when we hit 82. The record low for month is 8 set on March 8th 1990. Wow, look at that, one day lows in the single numbers and 5 days later highs in the 80s. TONIGHT: Clear Skies and Very Cold. Winds Northwest 5 to 10 mph. Lows around 22. 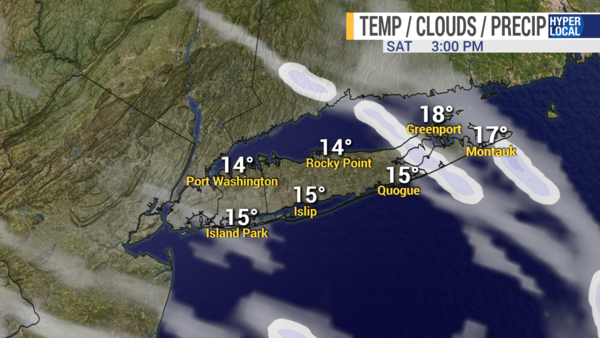 Wind Chills 13 to 18 degrees. Record Low 13 set in 2009. TOMORROW: Sun and Clouds. Chilly. Winds West-Southwest 5 to 10 mph. Highs near 38. 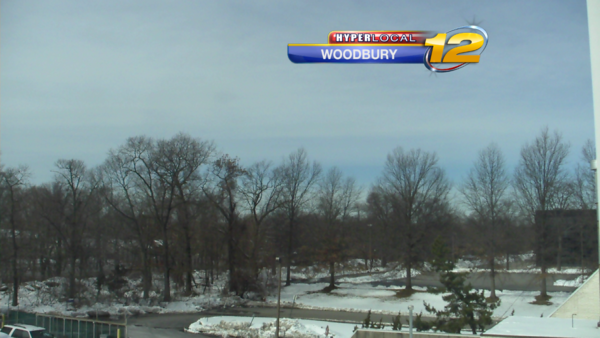 Wind Chills 28 to 33 degrees. 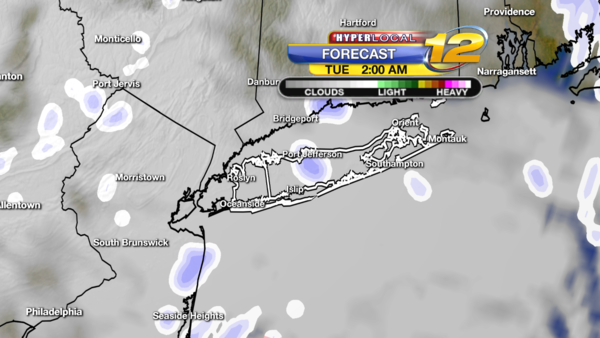 THURSDAY NIGHT: Cloudy skies with light snow developing towards morning. Watch for some snow covered and icy roads. Lows near 20. 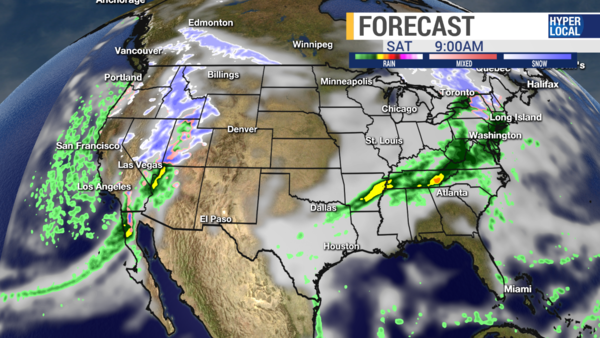 FRIDAY: Tracking Coastal Storm. 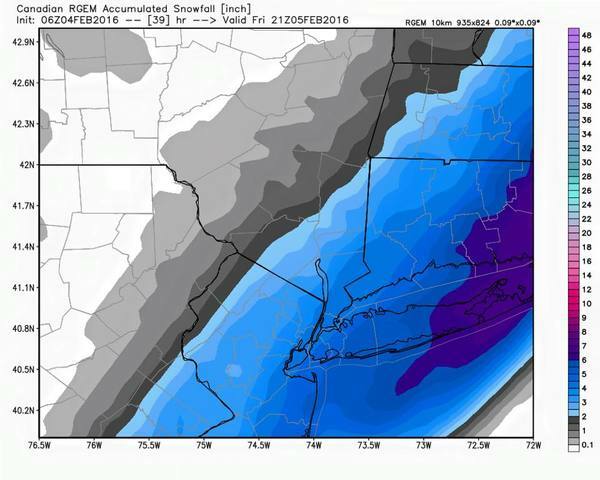 If storm track changes, snow totals change. Cloudy skies with light snow. Windy and Cold. 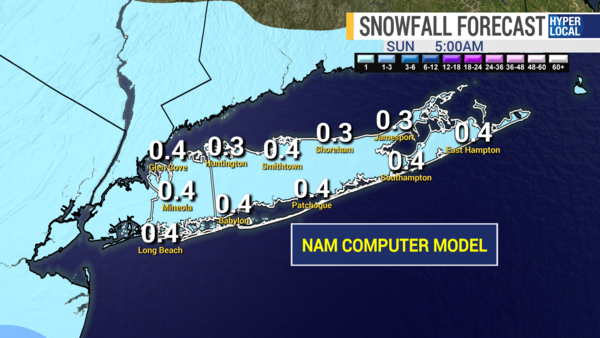 Some snow accumulation possible during the morning rush. 1 to 3 inches of snow possible. Highs in the 30s. BELOW MAP IS 1PM FRIDAY SHOWING TEMPERATURES RIGHT AT FREEZING SO WE WILL BE DEALING WITH SOME ICY ROADS. FRIDAY NIGHT: Cloudy skies with some light snow early then Partly Cloudy and Cold. 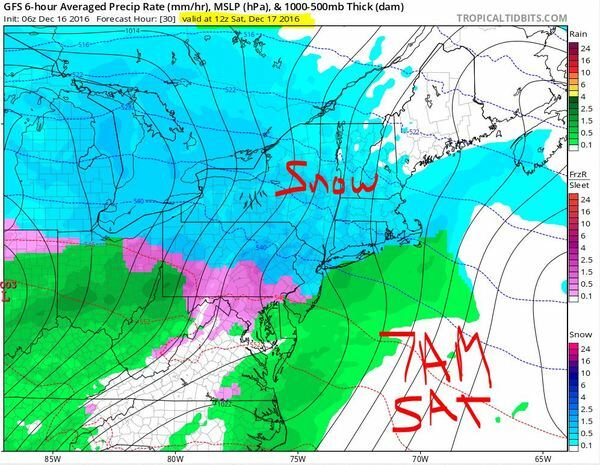 Below weather map for saturday and the storm is east of Long Island. 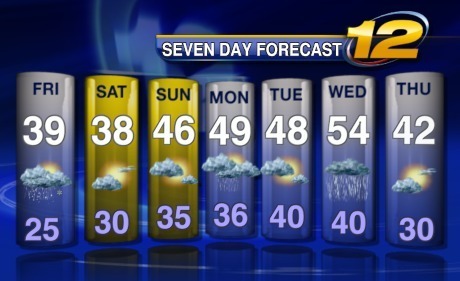 Drier weather returns. SATURDAY: Mostly Sunny. Chilly. Highs 37 to 40. OVERNIGHT: Mostly Cloudy. 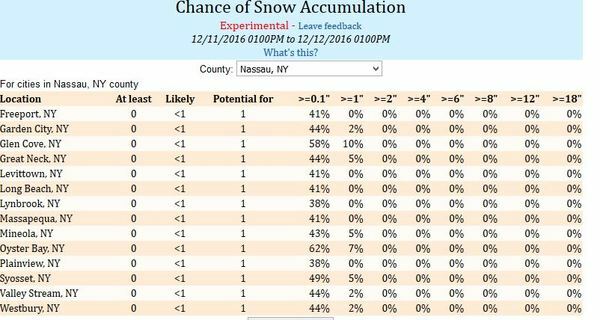 Chance of snow showers. Lows 25 to 30. 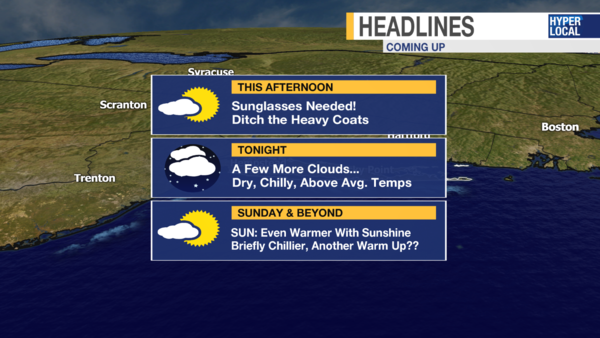 SUNDAY: Partly Sunny to Sun and Clouds. Highs near 42. OVERNIGHT: Partly Cloudy. Lows near 29. MONDAY: Sun and Clouds. A little warmer. Highs 45 to 48. OVERNIGHT: Partly Cloudy. Small chance of a shower. Lows near 35. 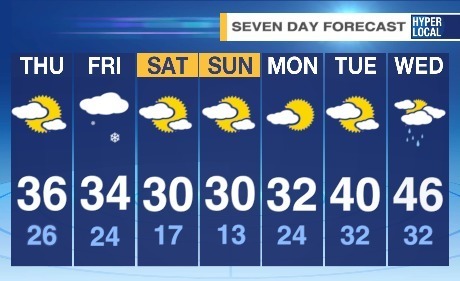 I WOULD PREPARE FOR SOME DELAYS FRIDAY MORNING. 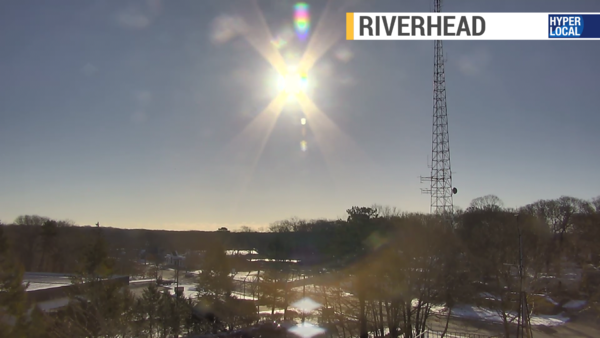 Saturday morning sunshine in Riverhead. We started off our weekend with a gorgeous sunrise this morning. 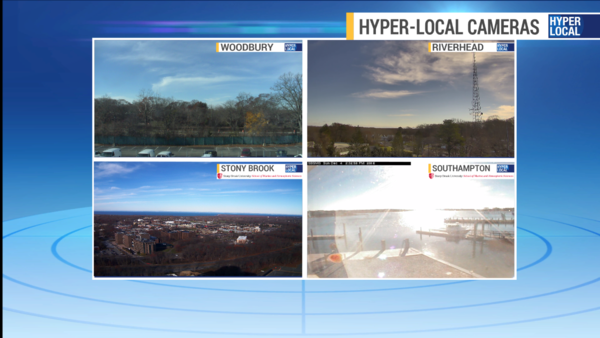 Mostly sunny skies started the day all across Long Island. 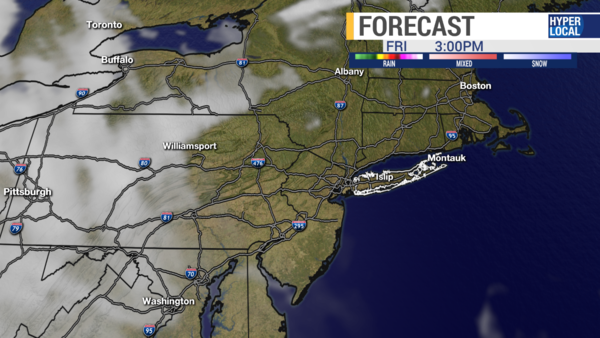 As we go through today, we will notice clouds increase this afternoon. It will stay dry. 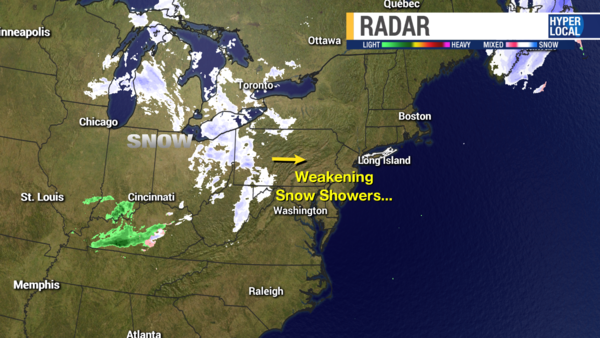 You can see in the picture below that we have a batch of snow showers and flurries to the west. Those will be weakening before reaching us. 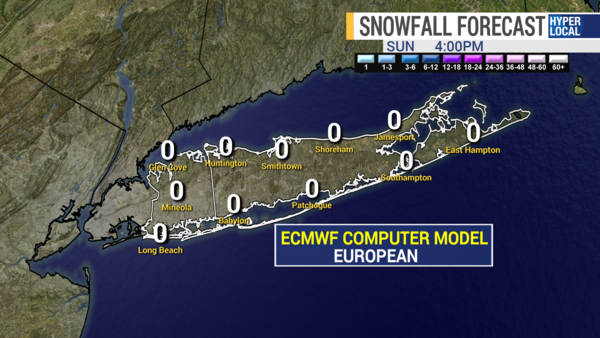 At worst, we're looking at a few morning flurries or a snow shower early tomorrow. Today will be nice and dry. Normal high for this time of the year is 45. So, we will be a little below average today with those increasing clouds. Tonight will become mostly cloudy and there could be a passing flurry very late, otherwise dry. We have a MAJOR warm-up on the way for the upcoming week. 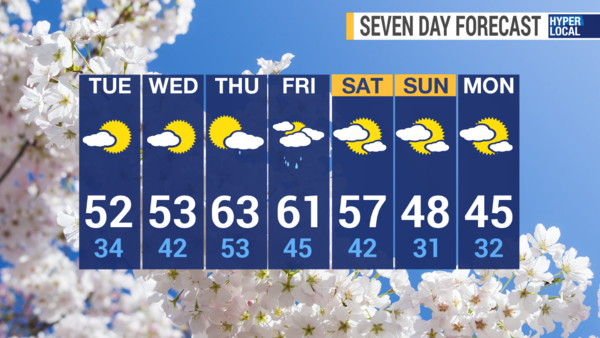 We'll have late April to early May weather for the middle of the week! Take a look at projected highs through Thursday below...that'll feel nice - who agrees?! The record high for Wednesday is 64 (2000). We have a good shot at breaking that! Other than the big warm-up on the way, dry Monday through Wednesday with partly to mostly sunny skies. 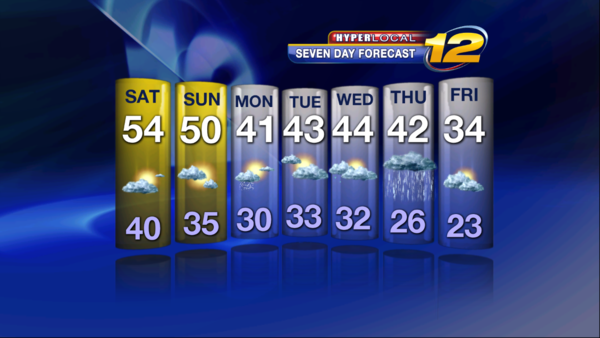 Showers arrive for the end of the week as temperatures cool back into the mid-40's by the start of next weekend. Remember to please follow me on Facebook and Twitter - thanks! Say the word Snow and everyone gets into a Frenzy - There is a difference between snow and SNOW. 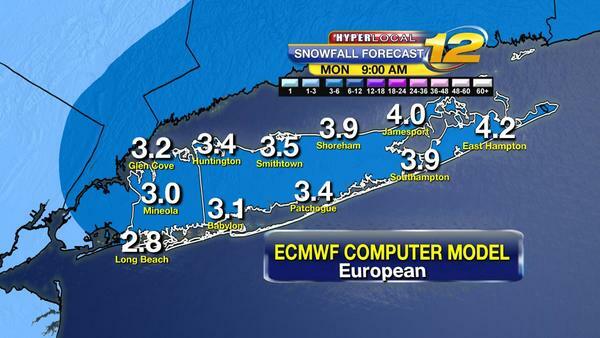 We can have Flurries, Snow Showers, Light Snow, Moderate Snow, Heavy Snow and the Big Ole' Blizzard. It seems more and more people dislike Snow - Now it's about 80% against 20% for. So what will happen the next few days. 1. A cold front this evening will bring colder weather starting tonight into the weekend. 2. 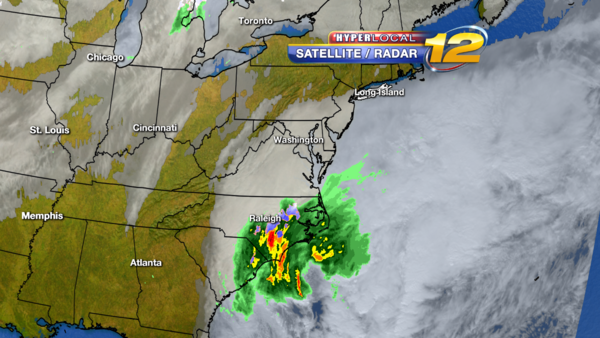 Storm developing in the Tennessee Valley will Track Northeast and South of Long Island. 3. 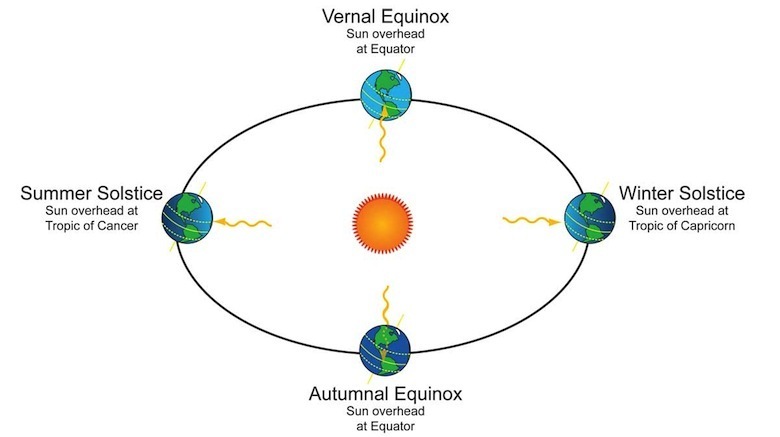 Spring Starts 12:30am Sunday March 20th when the Sun's direct rays hit the Equator. 5. 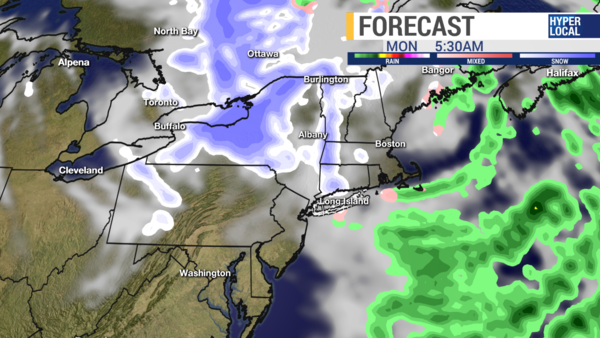 Precipitation Ends Early Monday and then late day sun with highs in the 40s. 6. 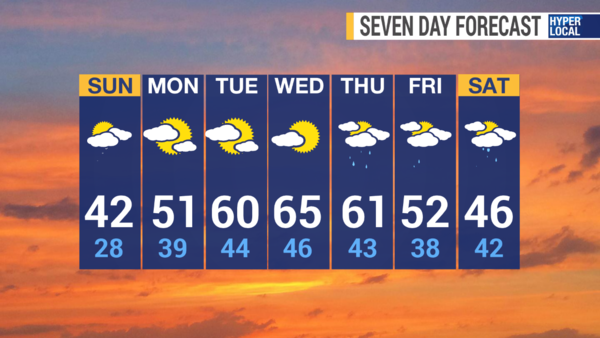 50s and 60s end of next week. FRIDAY AFTERNOON: Sun and Clouds. Chance of a shower between 3 and 6pm. Windy. Winds West-Northwest 10 to 20 mph. Highs near 55. Sunset: 7:03pm. FRIDAY NIGHT: Mostly Clear, a little breezy early. Cold. Winds North-Northwest 5 to 10 mph. 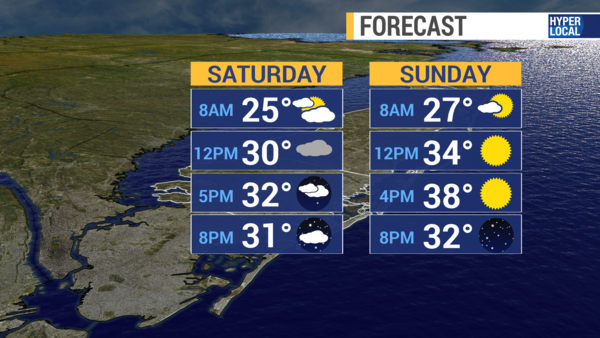 Lows near 30, some 20s around the Pine barrens. 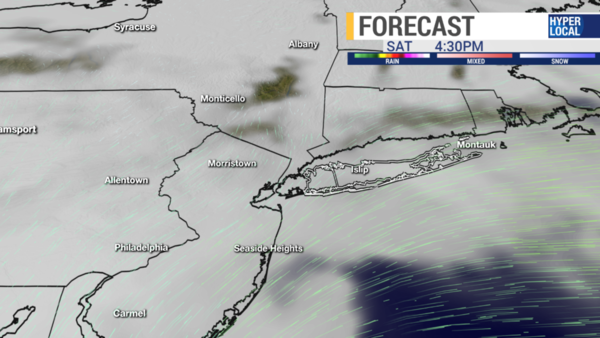 SATURDAY: Mostly Sunny with some late day clouds. A little chilly. Highs 40 to 45. 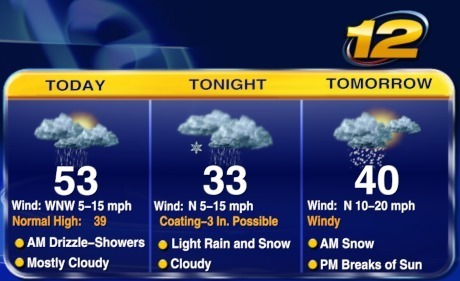 OVERNIGHT: Increasing Clouds with chance of snow towards morning. Lows 25 to 30. SUNDAY: SPRING STARTS 12:30am. PALM SUNDAY. 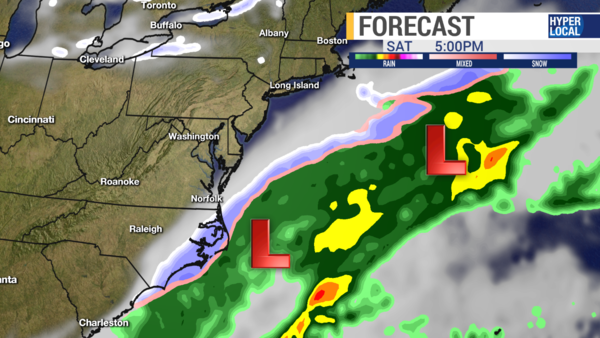 TRACKING COASTAL STORM - Timing, Track and Strength still in question. Cloudy and Cold. Periods of Rain and Snow. Winds North-Northwest 15 to 25 gusts to 35 mph. Wind Chills in the 20s. Highs 35 to 38. Snow during the day this time of year is hard to accumulate on roads - unless it comes down heavy. 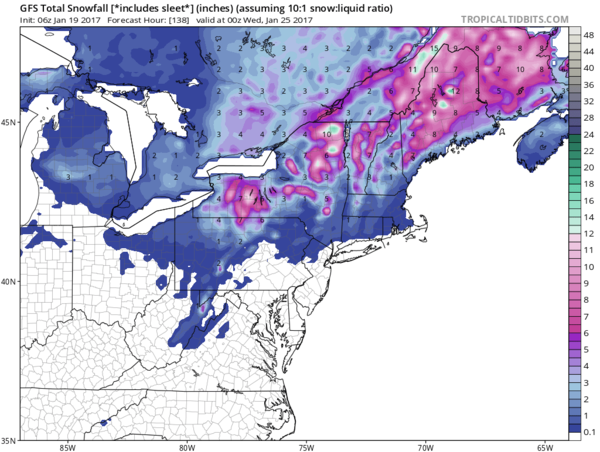 Below are the SNOW TOTALS from different weather computer Models from 0z model data, 12 z data comes out during the day, 0z is the overnight model runs. 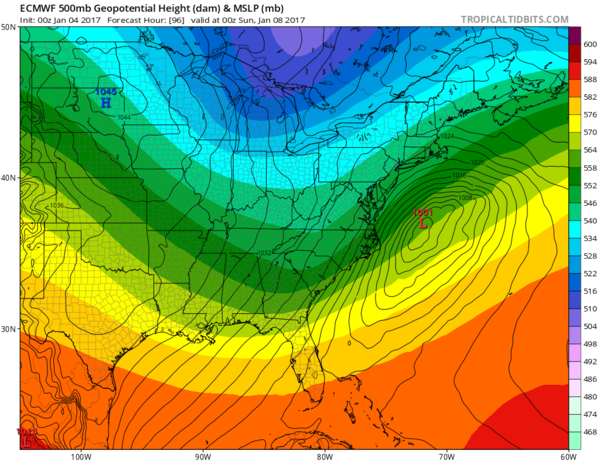 From 12z Thursday to the 0z models Friday the track was to the east more. I will track to see if there is a difference from 0z run to the next 12z run. I WOULD PREPARE FOR 3 INCHES TO 5 INCHES, and if a east storm track happens snow totals will go down.. Forecast will change a few more times before Sunday. When snow falls during the daylight hours during the spring it melts when it hits the pavement and snow accumulates on colder surfaces like grassy areas. This time of year the sun is high enough in the sky that even if its cloudy and snowy the sun's energy can melt the flakes as they fall. Hence why it's very difficult to get a major snow storm after March 17th. 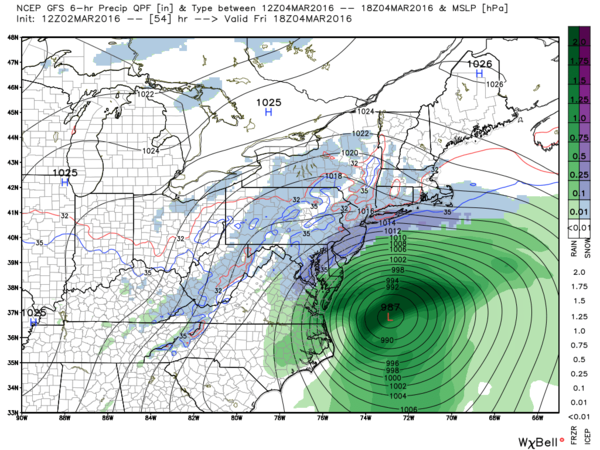 GFS has the storm, weaker and a bit east hence the lower amounts. 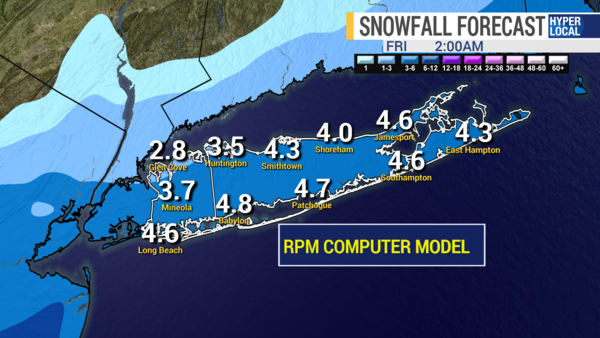 RPM MODEL AS RAIN TO SNOW with more snow north and west of Long Island. 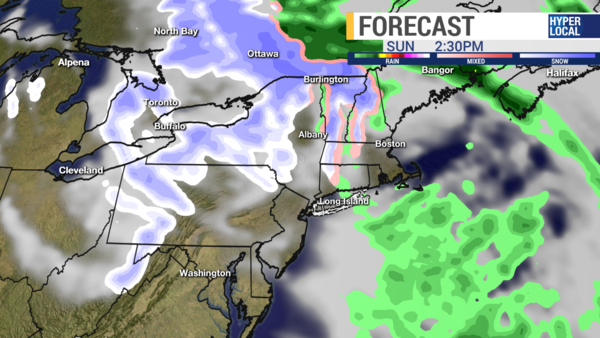 SUNDAY NIGHT: : Wintry Mix and Snow. 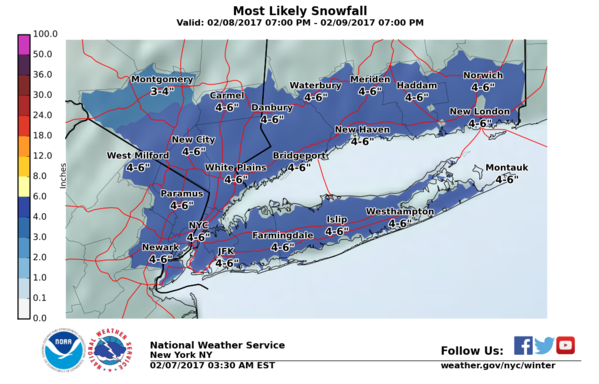 Be prepared for several inches of snow. Lows 30 to 32. 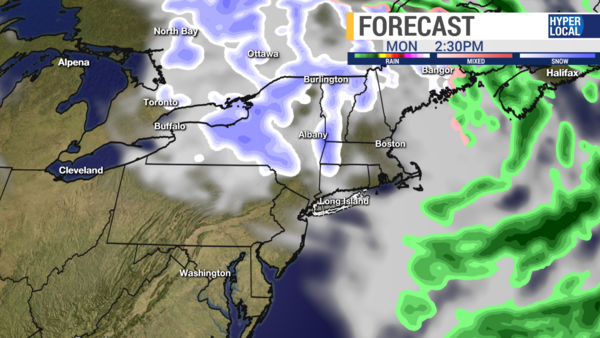 MONDAY: Morning Clouds and Snow Showers. Icy roads possible for morning rush hour. Windy. Partly Sunny in afternoon. Northwest winds 15 to 25 mph. 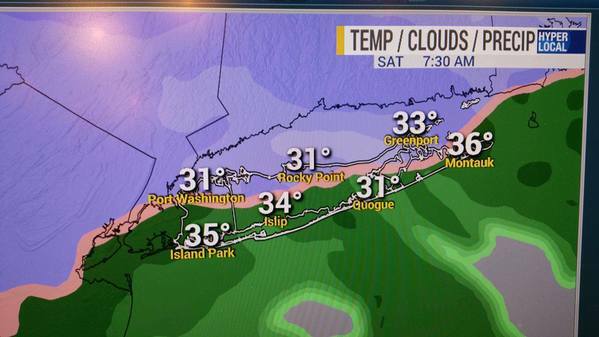 Wind Chills in the 20s.Be Prepared for a couple of inches of snow. Highs near 44. MONDAY NIGHT: Partly Cloudy. Cold. Lows 27 to 32. TUESDAY: Sun and Clouds and Breezy. Highs 42 to 47. OVERNIGHT: Mostly Cloudy. Lows 30 to 35. WEDNESDAY: Partly Sunny. Warmer. Highs in the low 50s. OVERNIGHT: Partly Cloudy. Lows 40 to 45. THURSDAY: Sun and Clouds. Mild. Highs 53 to 58. OVERNIGHT: Mostly Cloudy. Lows in the 40s. Good evening! After our rain today, we have drier weather on the way, but there will be more wind around tonight and tomorrow. We have a WIND ADVISORY in effect...see the below graphic and slideshow for more information on that. I'll say it again...HOPEFULLY this is the last time we have to talk about snow around here until next winter! We could see a quick coating to AT MOST one inch of slushy snow on colder surfaces through this evening really only if any heavier bands develop. 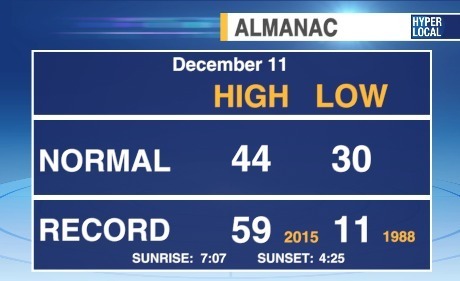 Our high temperature today around 46 degrees actually occurred late this morning. 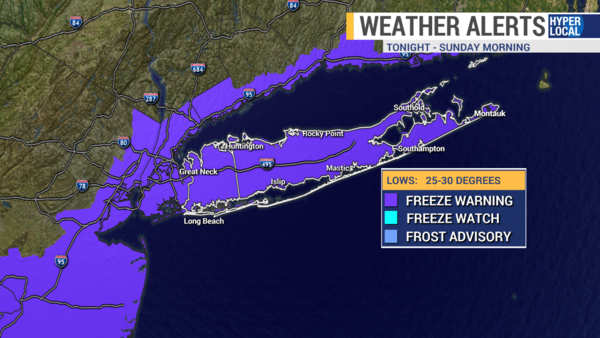 FREEZE WARNING late tonight through the start of Sunday. Heading to Citi Field? 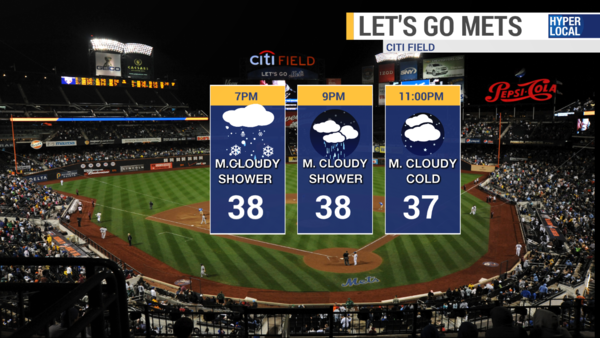 Here's your NY METS game forecast! 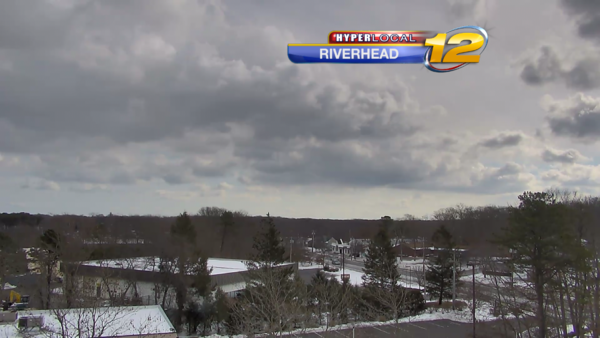 Possible leftover rain or snow shower to start...then mainly cloudy and cold - BUNDLE UP! 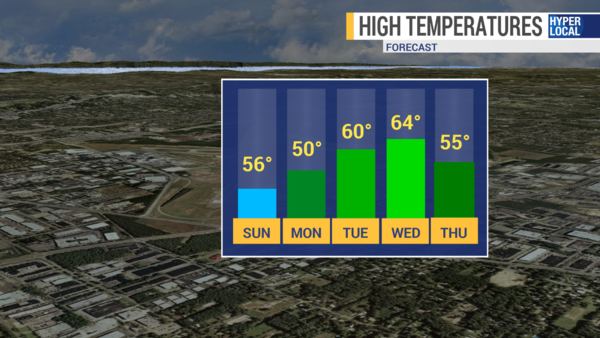 Notice the milder temperatures though for all of next week! Update by Meteorologist Rich Hoffman 9am June 1st 2016. JUNE 1ST - The start of Meteorological Summer - (June - July and August) The 3 warmest months of the year. 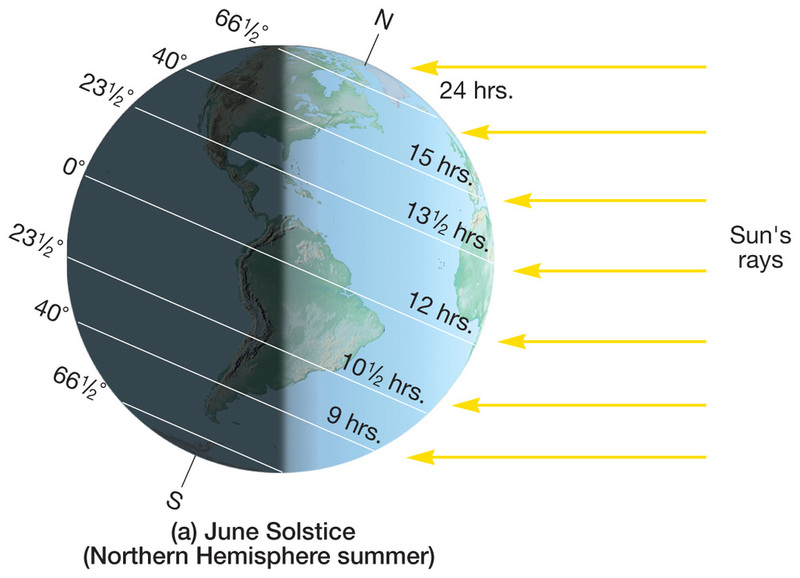 On June 20th at 6:34pm Eastern Daylight Time, the Sun's direct rays will hit the Tropic of Cancer and we will have more than 15 hours of Daylight - This is also the northmost point that the sun's direct rays will hit. On June 21st the Sun's Direct Rays will start moving south once again back to the Equator for fall. This is why days start getting shorter after the Summer Solstice. If you notice water temperatures take a little more time to warm up. Our warmest water temperatures typical happen in September - Yes water temperatures are warmer in September and October than they are in May and June. 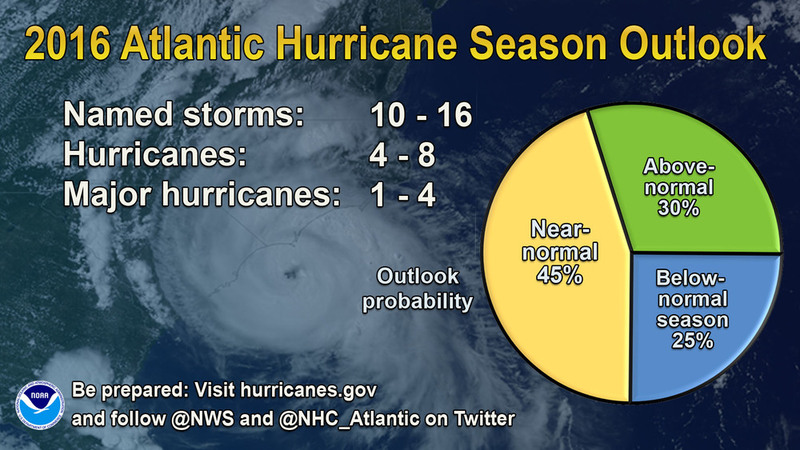 This is also why we have a better chance of a tropical system impacting Long Island in late summer and fall compared to early on in the Tropical Season which is from June 1st to November 30th. Remember Sanday was October 22nd to October 30th 2012. Generic term for tropical depressions, tropical storms, and hurricanes. A tropical cyclone in which the maximum sustained surface wind speed is at least 74 mph. A typhoon is the same thing, just what it’s called in the western Pacific. The U.S. Joint Typhoon Warning Center uses the term super typhoon to apply to typhoons with sustained winds of at least 150 mph. A tropical cyclone in which the maximum sustained surface wind speed ranges from 39 to 73 mph. Though less intense wind-wise than hurricanes, tropical storms and tropical depressions can produce destructive and deadly flooding from heavy rainfall. 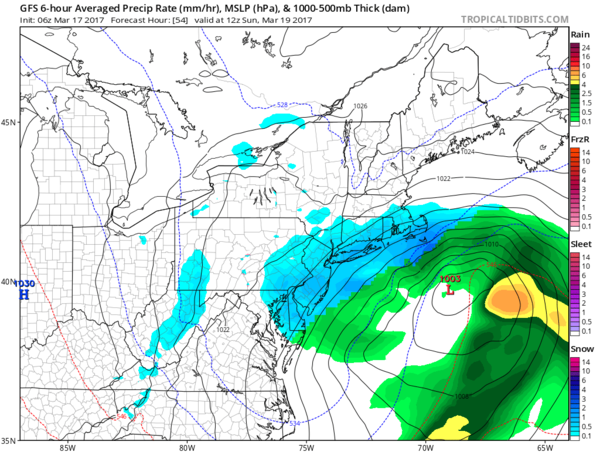 Remember it only takes one storm for it to be a bad season - We have to take it one week at a time, again typically we don't see tropical activity around Long Island until late August into September. The last Hurricane to cross Long Island was Gloria in 1985. Dry less humid today – only threat of rain will be late Wednesday into Thursday .. Holiday labor day weekend looks dry but we could have rip currents and rough seas depending on tropical systems off shore. 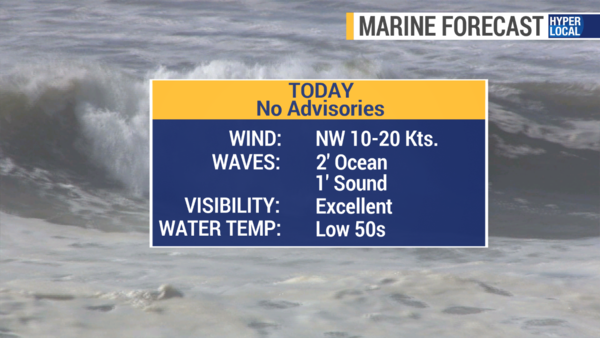 Marine Forecast: Watch for Rip Currents -- Waves 3 to 5 feet on the Ocean -- Water temperatures in the 70s. Water Conditions- Water Temperatures in the 70s. TONIGHT: Partly Cloudy Skies. Southwest 5 to 10 mph. Lows near 68. Sunrise: 6:19am. WEDNESDAY: Sun and Clouds. A bit more Humid. Highs near 84 degrees. 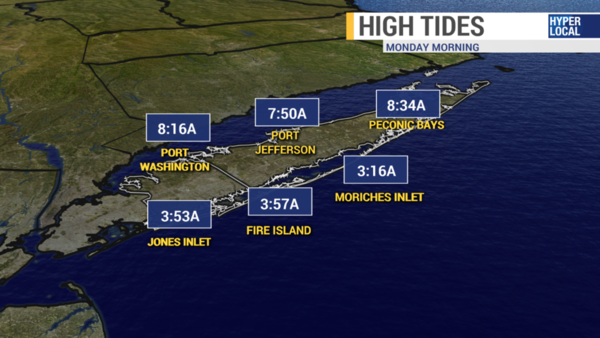 ***High Risk for rip currents and rough seas along the South Shore. Waves 3 to 5 feet. Be careful swimming. ***OVERNIGHT: Mostly Cloudy. Muggy. A few showers and storms. Lows near 69. THURSDAY: Mostly Cloudy with scattered showers, chance of thunderstorms. Highs near 82. ***High Risk for rip currents and rough seas along the South Shore. Be careful swimming. *** OVERNIGHT: Partly Cloudy skies. Los 60 to 65. FRIDAY: Mostly Sunny Skies. Dry and Comfortable. Highs near 78. 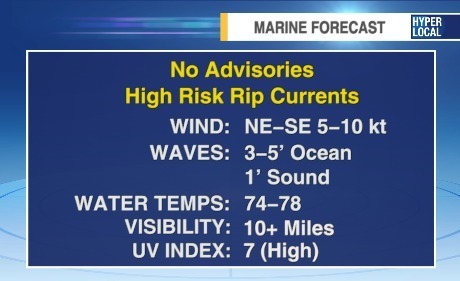 ***High Risk for rip currents and rough seas along the South Shore. Be careful swimming. *** OVERNIGHT: Mostly Clear Skies. Cool. Lows 53 to 62. SATURDAY: Mostly Sunny Skies. Highs 77 to 82. Tropical System off shore will create High Risk for rip currents and rough seas along the South Shore. Be careful swimming. OVERNIGHT: Mostly Clear Skies. Lows 55 to 62. SUNDAY: Mostly Sunny Skies. Highs 77 to 82. Tropical System off shore will create High Risk for rip currents and rough seas along the South Shore. Be careful swimming. OVERNIGHT: Mostly Clear Skies. Lows 60 to 65. MONDAY: LABOR DAY: Mostly Sunny skies with some clouds. Highs 77 to 82. 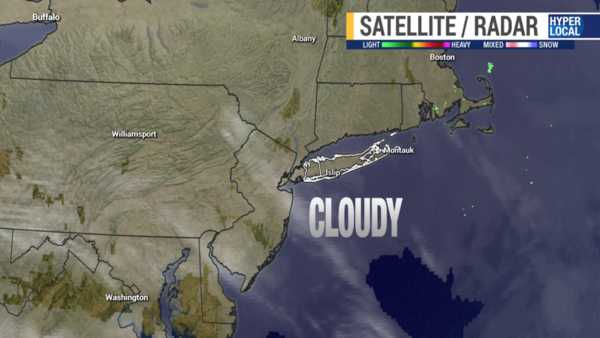 OVERNIGHT: Partly Cloudy Skies. Lows 62 to 67. 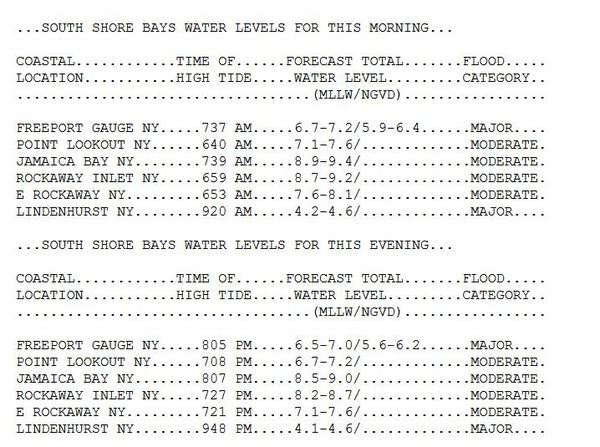 CURRENT WAVE HEIGHTS -- South of Long Island Waves 3 to 5 feet -- Gaston - Wave Heights near 34 feet. Tropical Depression #8, currently east of North Carolina. 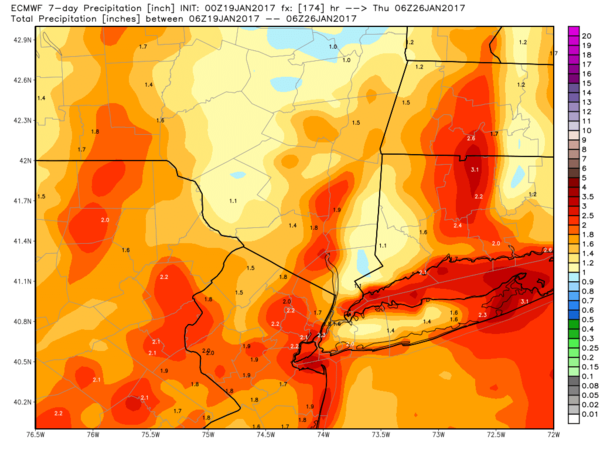 –( Forecast to become a tropical storm next 24 hours)- will stay south of long island - but expect dangerous surf on south shore of LI with rip currents and larger waves. Tropical Depression #9 Currently west of Cuba and south west of Florida in the Gulf of Mexico. ( forecast to become tropical storm next 24 hours) .. forecast track to be south of Long Island and East of the North Carolina by the weekend. 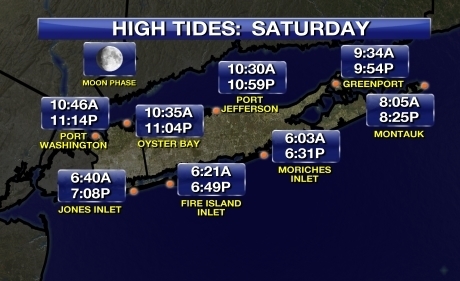 it will stay south of Long Island, but we could see rough seas with rip currents. Hurricane Gaston - well out to sea , hundreds of miles east of Bermuda -- and moving east. LABOR DAY Forecast: Mostly Sunny skies with some clouds. Highs 77 to 82. MONDAY NIGHT: Partly Cloudy Skies. 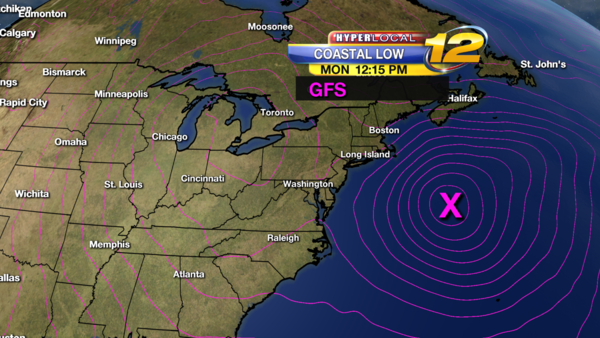 Lows 62 to 67.
tropical systems South of Long Island - We will have some rough seas and rip currents. Good morning! We've been talking about a big change in the weather for awhile now and it is almost here. So, if you're a fan of warmer than average temperatures (I sure am!) then try to get outside today and enjoy one last day of this warm weather. Big changes start tomorrow. Above you can see a map of what's happening today. 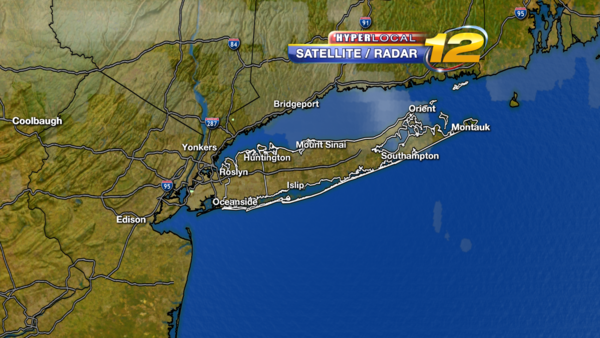 As of 9:30AM this morning, skies were mostly sunny all across Long Island. This will change throughout the day. 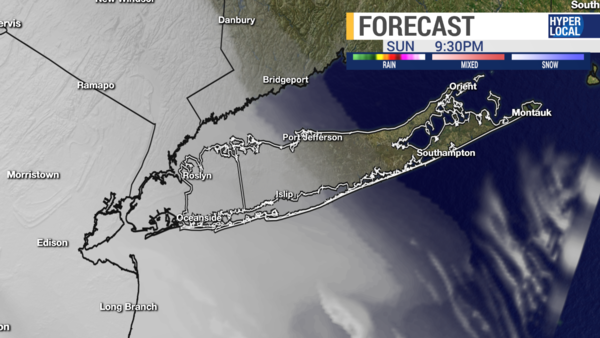 Starting with the eastern half of LI - you can see the grey color offshore. 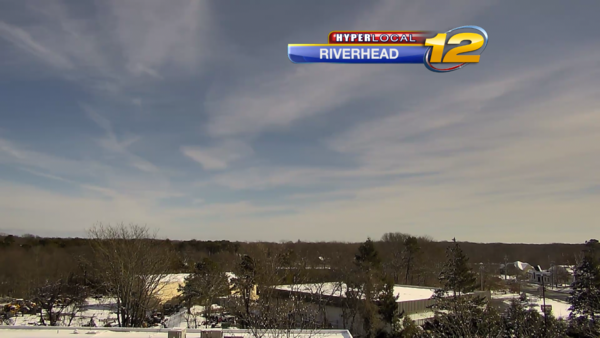 Those are clouds pushing back West towards Long Island. So this afternoon, skies become increasingly cloudy for Eastern then Central Suffolk County. 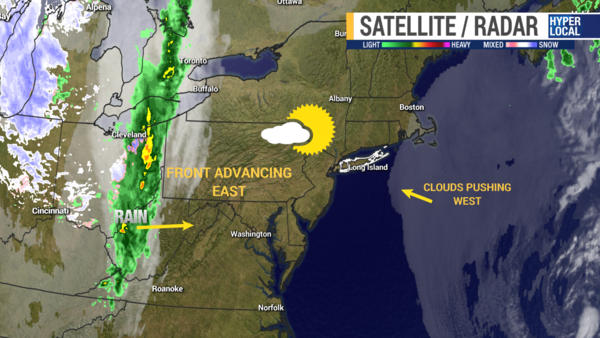 Back to the West, we have a cold front advancing East. Along with it...the chance for some wet weather starting tonight. It also marks the leading edge of our colder air. Gusts over the next two days will likely be between 40 and 50 miles per hour. On Tuesday, it will still be very breezy, but not as windy. So far we've gone over the change in terms of rain and perhaps a snow shower or two, the wind and to top it all off it will feel MUCH colder. 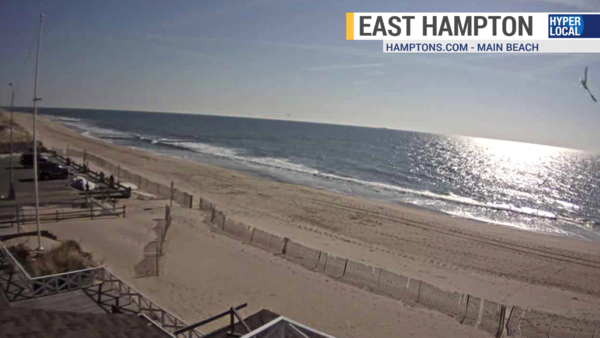 Expect a lot of sun to start the day with increasing clouds over the East End this afternoon and all across Long Island we'll see more clouds starting this evening. We could at least tie a record high today set back in 1999! Scattered showers arrive tonight. Otherwise, mostly cloudy. Lows near 40. Becoming windy. 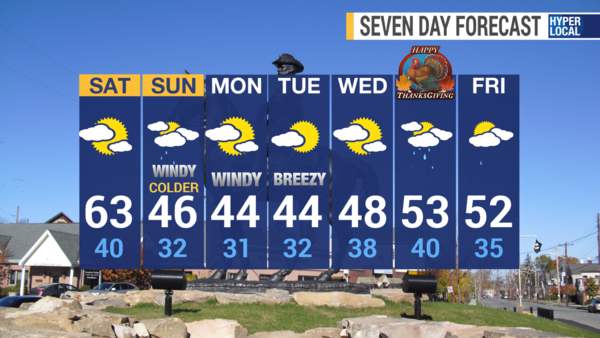 Over the next 7 days... windy, colder and unsettled tomorrow with a few showers. It will feel more like the 20s and 30s over the next couple of days due to the colder temps in conjunction with strong winds. 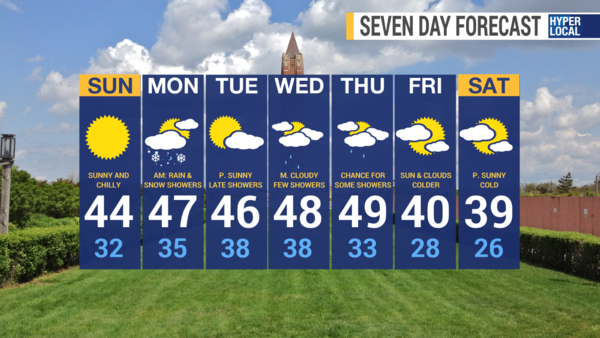 Highs Monday and Tuesday will be around 44 with mainly dry weather. The wind subsides considerably finally by Wednesday. It does look like we could have some showers to contend with on Thanksgiving, but at least it will be feeling a bit better outside with highs around the low 50s again. Have a great day! Remember, if you have any weather photos, videos or comments - please reach out to me on social media using the links below...thanks! Well, I hope everyone is having a great weekend so far! Today is a really nice day to finish the holiday outdoor decorations, get a Christmas tree or do anything outdoors! It won't be warm, but at least it looks great with plenty of sunshine. Here's what's going on. We have dry weather in control for today, but take a look below and notice all the green and blue colors to our South and West. That's what we're watching for late tonight and Monday morning. 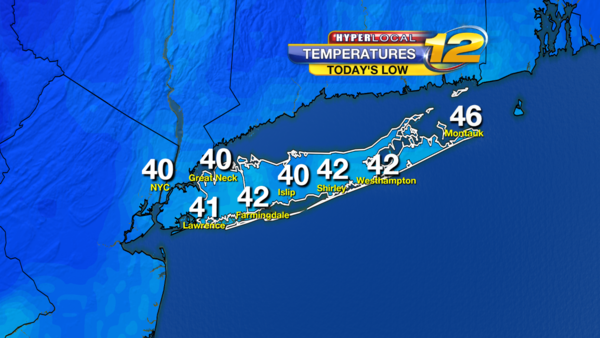 Back to today for a moment - our morning lows today were definitely cold - generally upper 20's to lower 30's. Through this afternoon, we'll be in the lower 40's with a NW breeze at 10-15 mph. The normal high this time of year is 47 degrees. 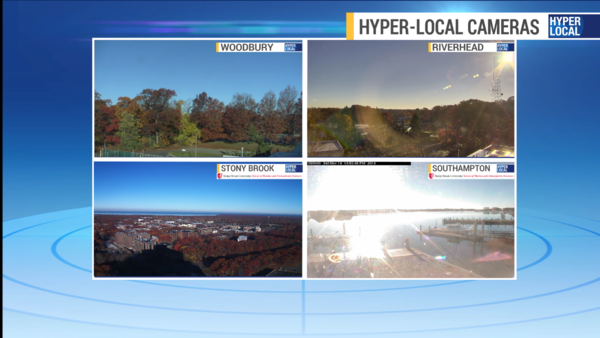 Plenty of sunshine though as I mentioned, so enjoy it! 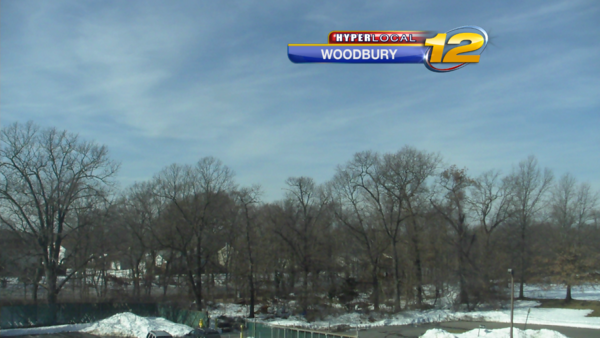 We'll just see some high, thin and wispy cirrus clouds today. Waters look OK for the rest of today...just a bit breezy! 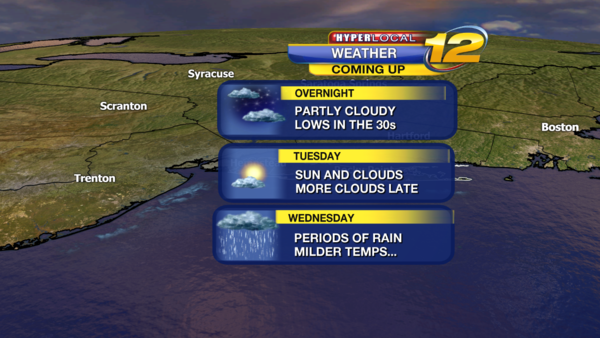 Our weather changes begin tonight with increasing clouds before midnight. Lows should bottom out around the lower 30s. 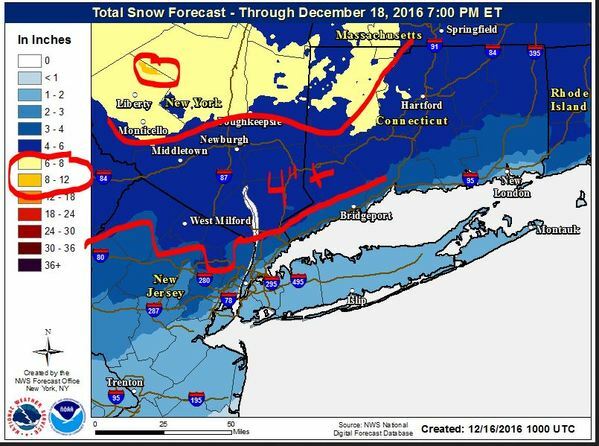 The below map is from the National Weather Service (NWS) and tells us their thinking on our wet and slightly wintry weather event on the way for late tonight and Monday morning. 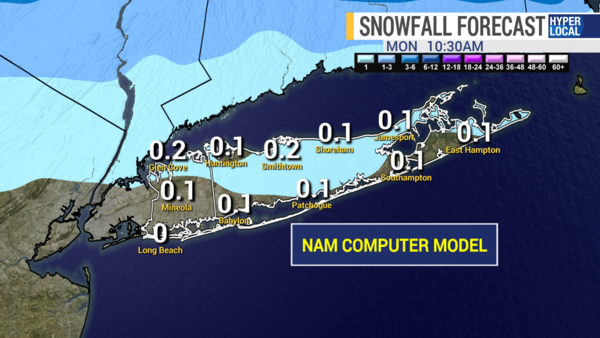 North and West of Long Island is where the best chance at some light snow accumulation is. 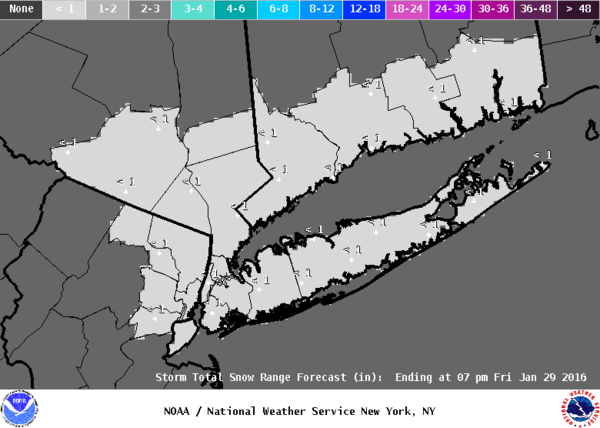 This map below is also from the NWS and shows the likelihood at seeing more than one tenth of an inch of snow. 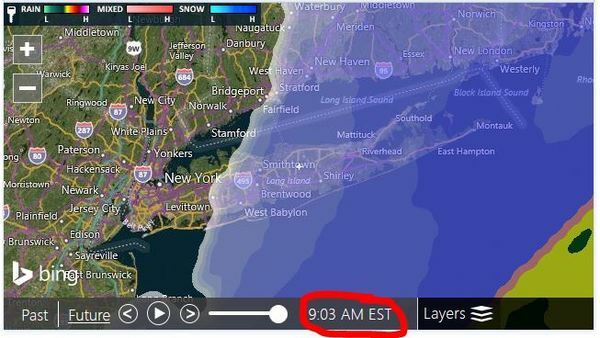 Notice how the chances of this aren't all that great on Long Island. 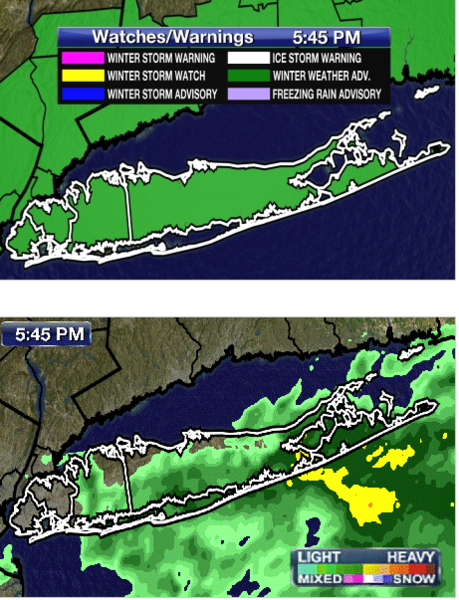 Even if we do get a quick coating in spots, a transition to all plain rain showers all across LI instead of a mix of rain and snow is likely after daybreak. 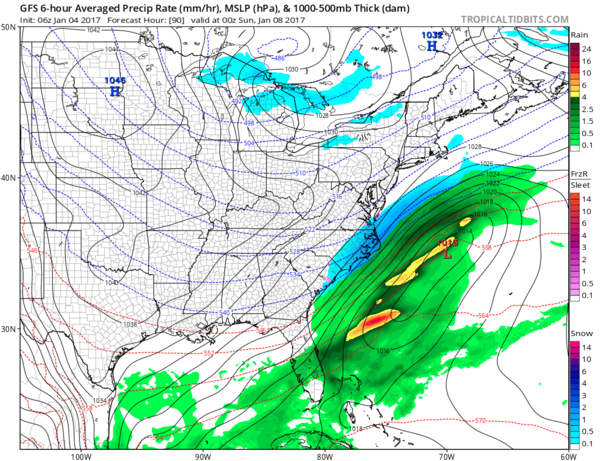 So, this next system is going to be mainly wet instead of mainly white or wintry. That being said, there may be a few slick spots very early tomorrow morning, but nothing much more than that. 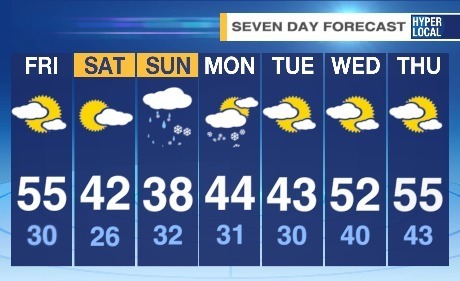 Now, that all important Hyper-local 7 Day Forecast! A bit unsettled at times this week, but the big highlight will be the much colder air that's on the way as we head towards next weekend! As always, if you have any forecast comments, questions or weather photos - head to my social media pages and I will get back to you as soon as I can. Have a great day and upcoming week! 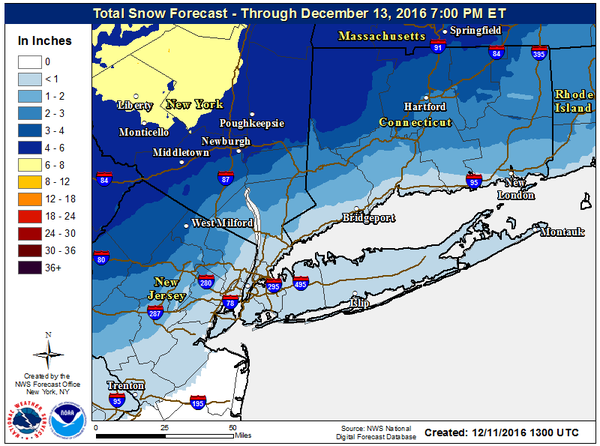 Good Morning - Forecast update by METEOROLOGIST RICH HOFFMAN SUNDAY DECEMBER 11TH 2016 AT 10AM. A cold start to our morning with temperatures in the 20s. 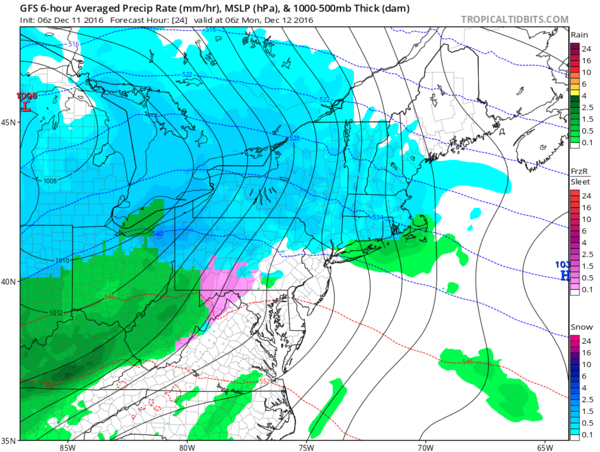 I am tracking a storm that will move through the Great Lakes and Bring a little snow and then rain to Long Island starting this evening into Monday. So, what can we expect. 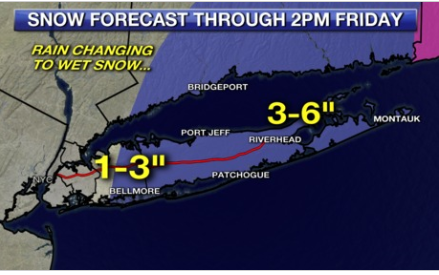 First, Long Island weather is always different than areas North and West of Long Island when it comes to snow storms. Second, listen to the forecast and know who is forecasting for what areas. 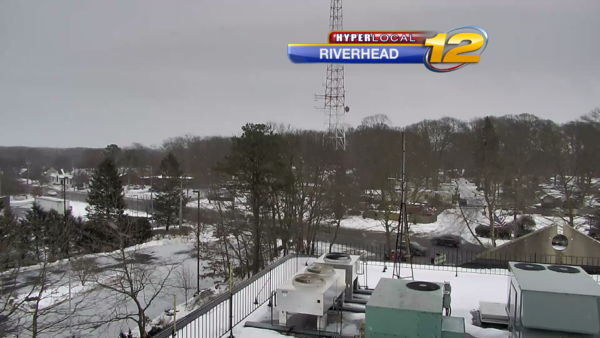 Third, Stay tuned to News12 and download the News12 weather app. 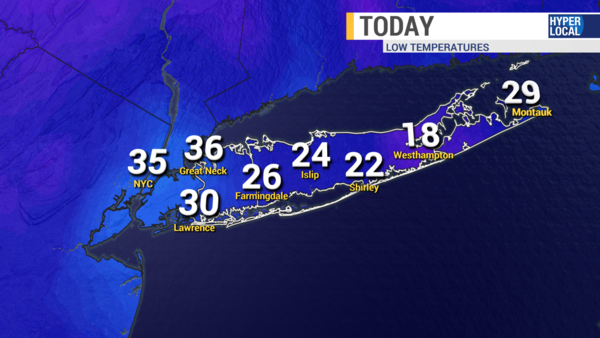 Today: Temperatures in the 20s this morning. 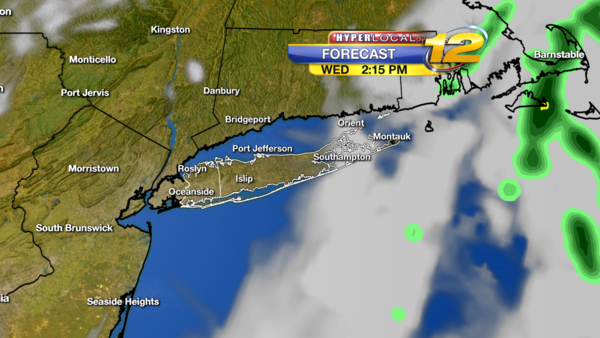 Clouds will increase through the day and become cloudy this afternoon. Temperatures between 3 and 6pm will range from 30 to 35. Cold enough for some snow and some slick roads. Some light snow and flurries will develop late afternoon, mostly on the light side. Once the sunsets, with the cold roads, even a half inch of snow could create slick roads so be alert driving this evening. 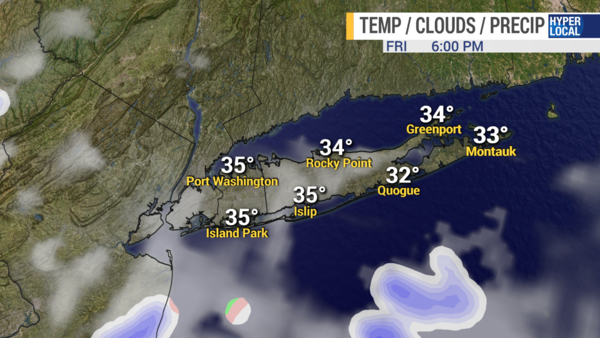 TONIGHT: Cloudy skies with temperatures from 6pm to Midnight in the 32 to 35 degree range. We will have some light snow or flurries. Some minor snow accumulation. Most areas half inch or less, some areas could see around 1 inch. 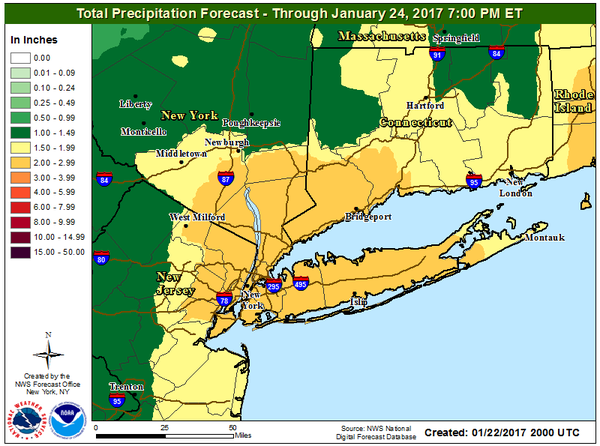 If the Precipitation comes down for a period, some areas could see 1 to 2 inches. As you can see we are not expect a lot of snow, but even minor snow can create issues on the roads. 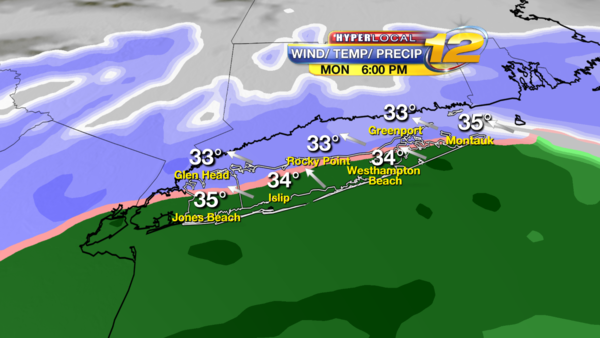 After MIDNIGHT: Temperatures will rise to close to 40 and any snow will change to rain. Any snow accumulation will be washed away. 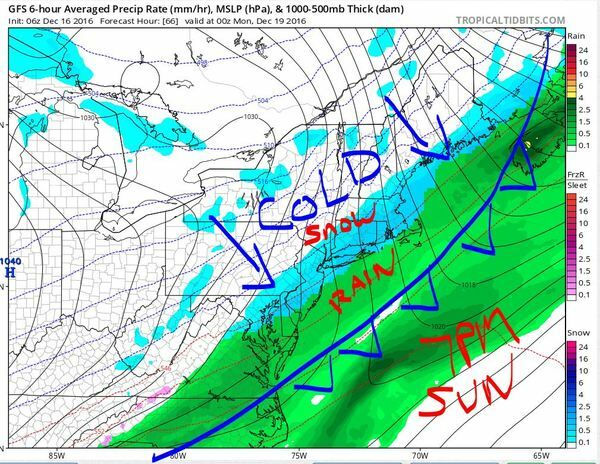 timeline showing snow going to rain and warmer air on the way. 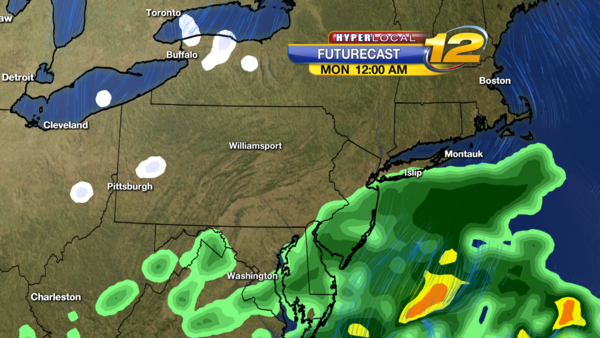 THE BELOW WEATHER MAP IS FOR 1AM MONDAY......You can see the snow changing over to rain at this point. Temperatures are warming to around 40. MONDAY: Morning rain, heavy at times. Temperatures will be in the 40s. Some puddles and slick roads will create a sloppy morning rush hour. Winds Southwest to West 15 to 25 and gusting to 35 mph. 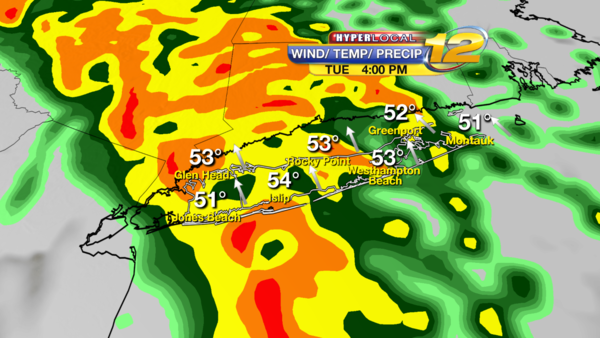 Rain will taper off after 2pm, it will be windy and mild. Highs 45 to 50. Sunset: 4:25pm. 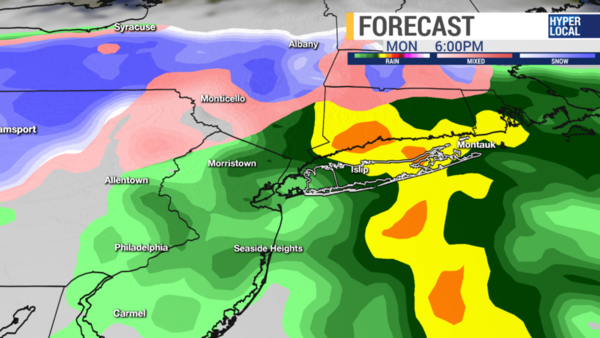 Below is the weather map for 7am Monday - You can see the rain over Long Island and the Snow to the North. Here is a detailed look at how much snow. 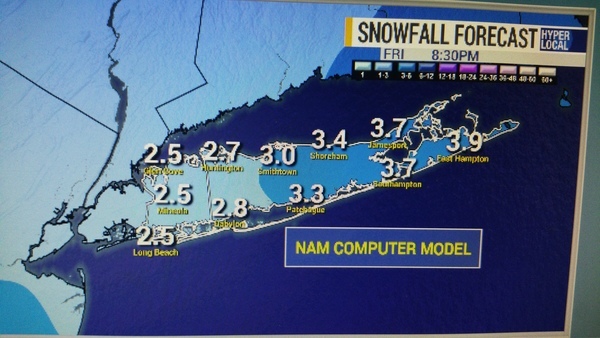 Suffolk County Potential for Snow. You can see heavy snow in the Catskills. 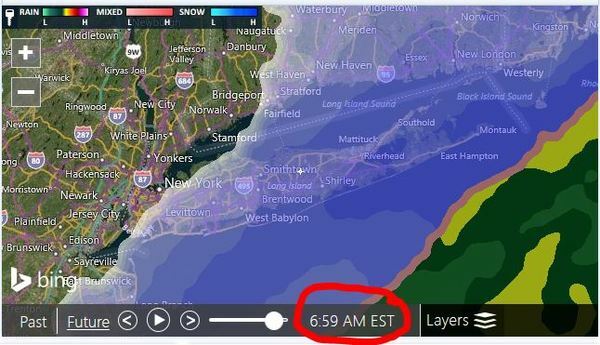 Little snow on Long Island. We need the moisture and we need the Precipitation . The below map show how much liquid will fall from the sky. Most areas will see below half inch and one inch of liquid. Since January 1st we are 11.59" below normal for Precipitation. TUESDAY: Mostly sunny skies. Highs near 43. Lows near 32.
near 40. Lows near 23. Partly Cloudy. Cold! Lows 15-20. FRIDAY: A mix of sun and clouds. Highs near 31. Lows near 23.
sleet, and rain. Highs near 39. Lows near 34. HAVE A GREAT DAY--- SEE YOU ON TV MONDAY MORNING AT 5AM. HAPPY HOLIDAYS RICH HOFFMAN. Coaster ride for temperatures, Cold today warmer weekend colder on Monday. chills zero to 10 above.. Breezy and COLD.. Dress in layers and stay warm. TODAY: Mostly Sunny with some afternoon Clouds. degrees. Highs near 26. Sunset: 4:26pm. by morning. Be alert and Careful for slick/snow covered roads. 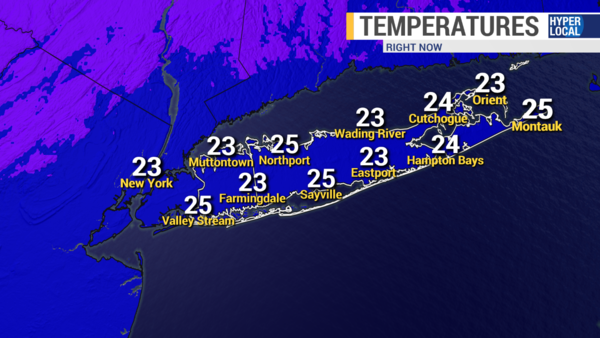 Temperatures rising from 23 to near 30 by 7am. showers during the afternoon. Temperatures 45 to 50. Some dry periods late afternoon into the evening. with spotty showers and fog. Dry periods as well not raining all the time. Lows 40 to 45. 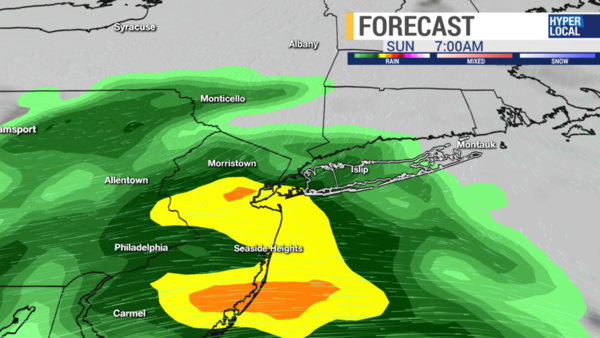 SUNDAY: Cloudy Skies with periods of rain. brief period of snow. Turning Colder. Roads could be icy. Lows near 23.
and Clouds. Breezy and Cold. Highs near 34. 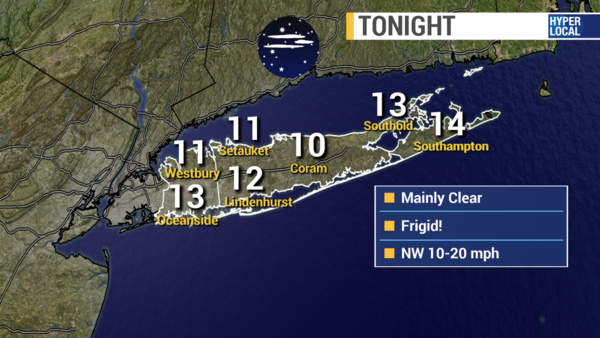 OVERNIGHT: Mostly Clear and Cold. TUESDAY: Sun and Clouds. Highs near 38. OVERNIGHT: Partly Cloudy. Lows near 32. WEDNESDAY: Mostly Sunny. Highs near 42. OVERNIGHT: Partly Cloudy. Lows near 28. TODAY: Mostly Sunny with some afternoon Clouds. Breezy and Cold. Winds Northwest10 to 20 Gusts 30mph. 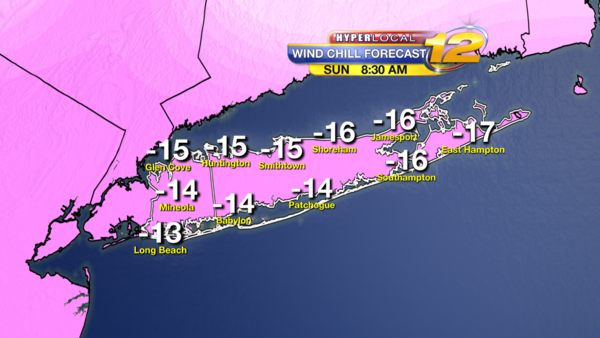 Wind Chills 5 to 15 degrees. Highs near 26. Sunset: 4:26pm. 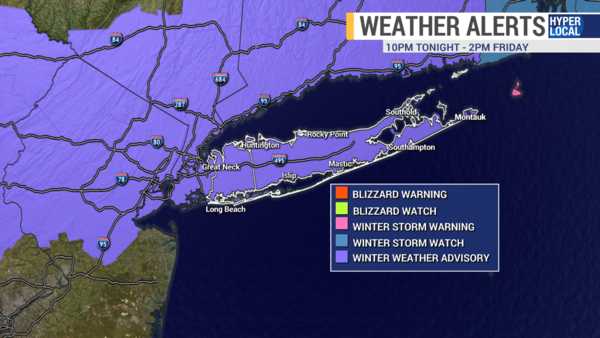 TONIGHT: Winter Weather Advisory Midnight to 10am. Cloudy Skies. 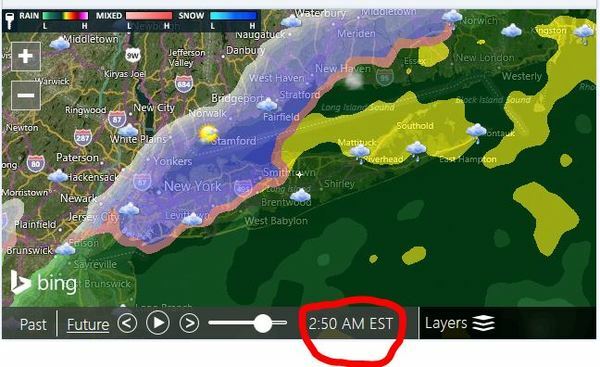 Snow developing after midnight. 1 to 2 inches possible by morning. Be alert and Careful for very slick/snow covered roads. SATURDAY: Watch for morning icy roads. 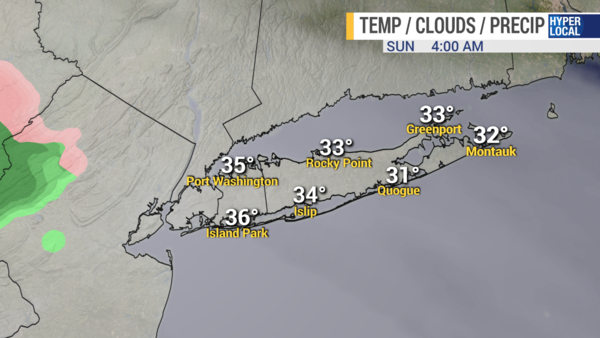 Morning Temperatures 30 to 35. Cloudy Skies. Roads could be very icy before changeover. 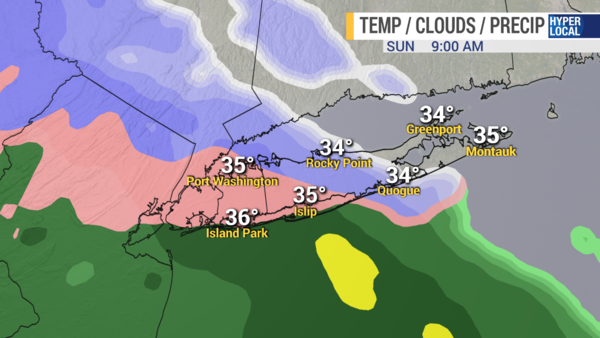 Light snow, sleet and freezing rain changing to rain between 7am and 10am. Snow total accumulation before a change to rain, 1 to 3 inches. **** IF CHANGEOVER HAPPENS LATER WE COULD SEE HIGHER TOTALS, ESPECIALLY ON THE NORTH SHORE***Rain tapers to spotty showers during the afternoon. Temperatures 45 to 50. 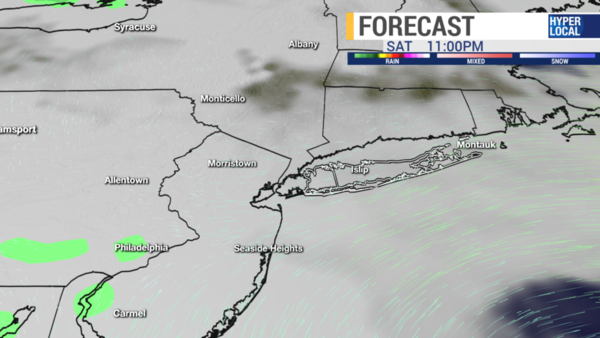 SATURDAY NIGHT: Cloudy Skies with spotty showers and fog. Lows 40 to 45. 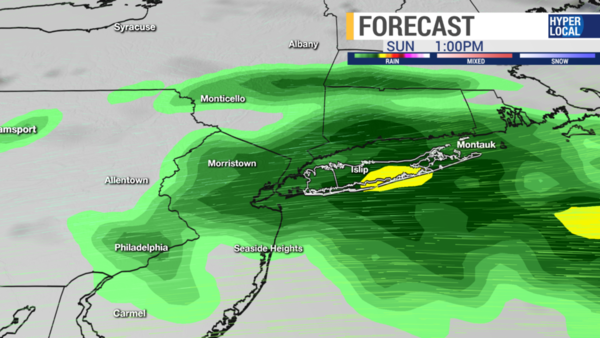 SUNDAY: Cloudy Skies with periods of rain. Breezy. 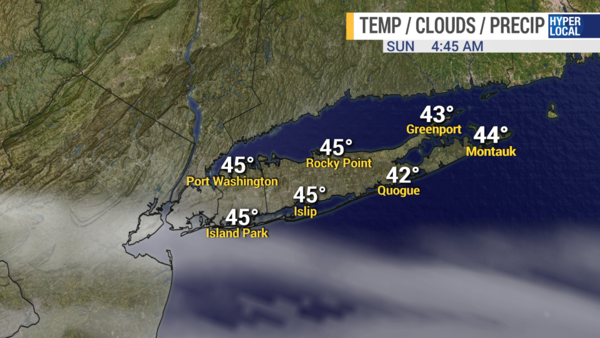 Temperatures in the morning 53 to 58. 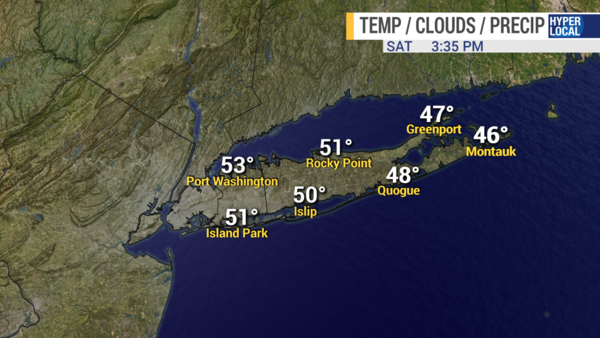 Temperatures dropping during the afternoon to 40 to 45 by 5pm. 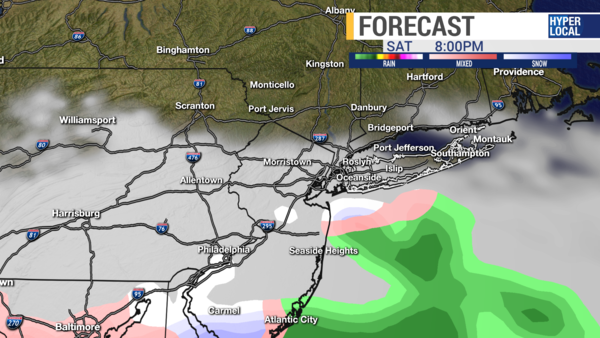 OVERNIGHT: Any rain tapers off and may end as a brief period of snow. Turning Colder. Roads could be icy. Lows near 23. MONDAY: Watch for Black ice in the morning. Sun and Clouds. Breezy and Cold. Highs near 34. SUNDAY NIGHT: Mostly Clear and Cold. Lows near 25. TUESDAY: Sun and Clouds. Highs near 38. OVERNIGHT: Partly Cloudy. Lows near 32. WEDNESDAY: Mostly Sunny. Highs near 42. OVERNIGHT: Partly Cloudy. Lows near 28. THURSDAY: Partly Sunny with late day Showers. Highs near 47. OVERNIGHT: Cloudy Skies with showers. Lows near 38. 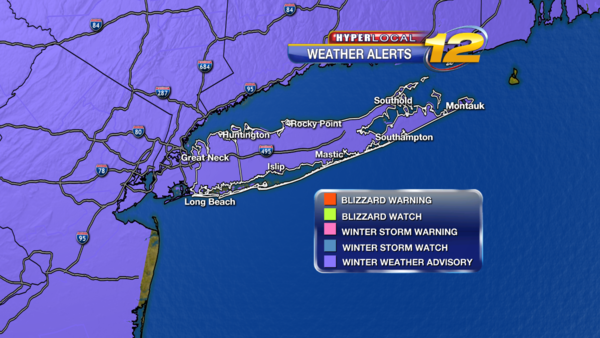 TONIGHT: Winter Weather Advisory Midnight to 7am. Cloudy Skies. 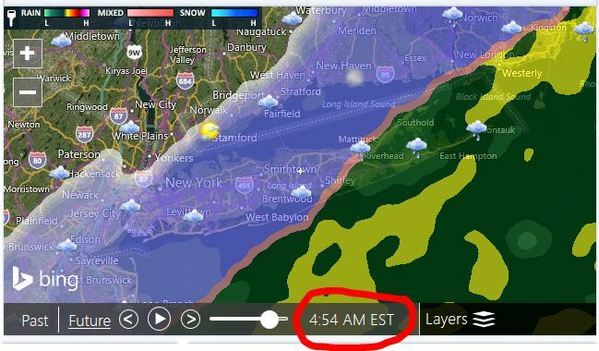 Snow developing after midnight. 1 to 2 inches possible by morning. Be alert and Careful for slick/snow covered roads. Temperatures rising from 23 to near 30 by 7am. SATURDAY: Watch for morning icy roads. 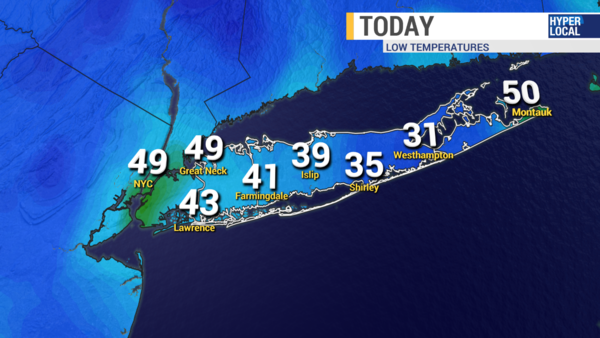 Morning Temperatures 30 to 35. Cloudy Skies. 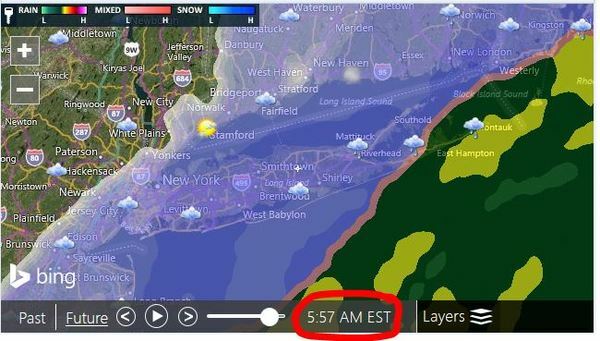 Light snow, sleet and freezing rain changing to rain between 7am and 10am. Snow total accumulation before a change to rain, 1 to 3 inches. Rain tapers to spotty showers during the afternoon. Temperatures 45 to 50. 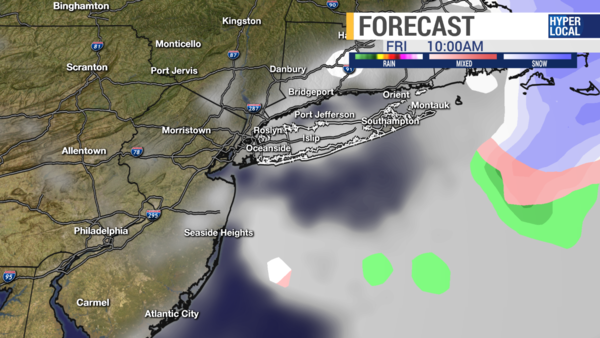 OVERNIGHT: Cloudy Skies with spotty showers and fog. Lows 40 to 45. MONDAY: Watch for Black ice in the morning. Sun and Clouds. Breezy and Cold. Highs near 34. 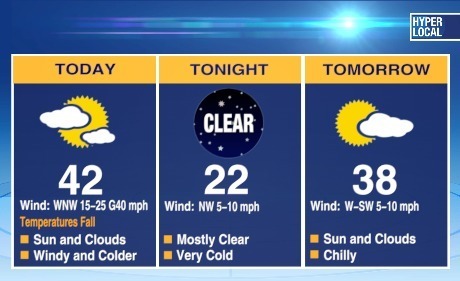 OVERNIGHT: Mostly Clear and Cold. Lows near 25. TODAY: Mostly Sunny Skies. Winds Northwest 5 to 15 mph. Highs near 46. Sunset: 4:29pm. TONIGHT: Increasing Clouds. Winds Southwest 5 to 10 mph. Lows near 34. SATURDAY: Cloudy Skies. 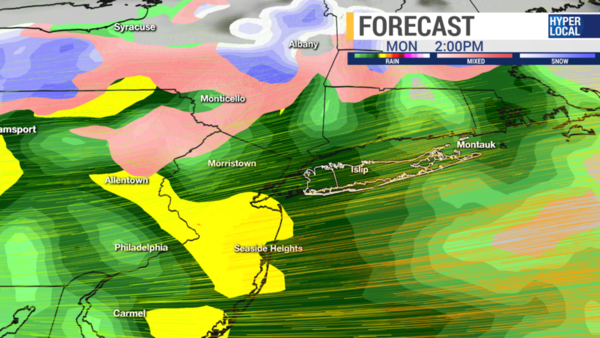 Rain through 3pm. 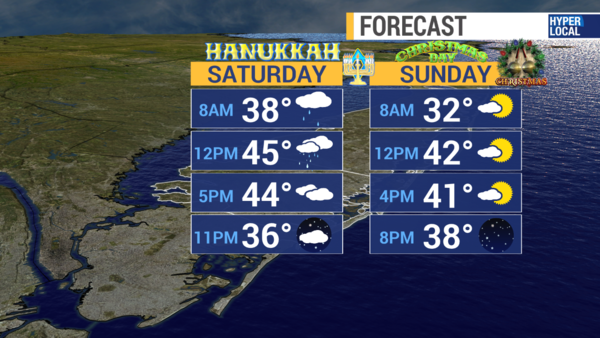 SATURDAY NIGHT: HAPPY HANUKKAH Sunset: 4:30pm. CHRISTMAS EVE MIDNIGHT MASS 10PM TO 1AM. Mostly Clear temperature near 36. Mostly Clear. Lows near 32. 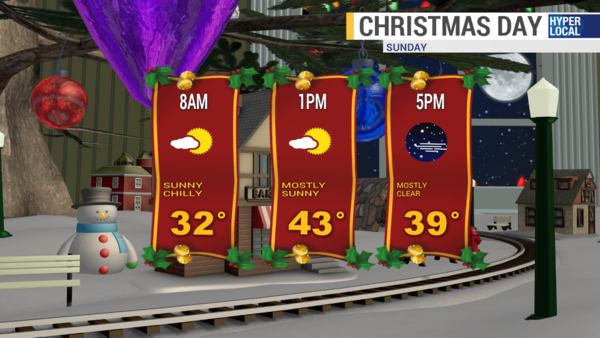 SUNDAY: MERRY CHRISTMAS: Mostly Sunny. Highs near 44. 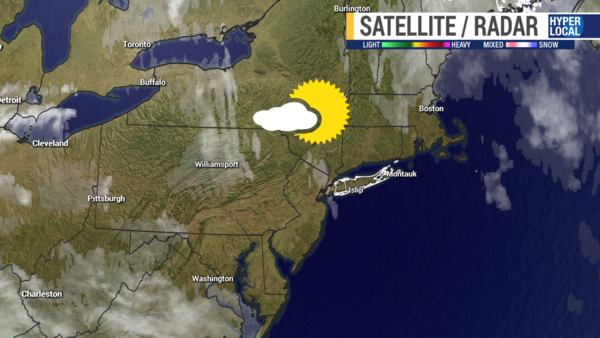 OVERNIGHT: Partly Cloudy Skies. Lows near 32. MONDAY: KWANZAA. Mostly Cloudy Skies. Chance of Showers towards evening. Highs near 47. OVERNIGHT: Mostly Cloudy with showers. Lows near 40. TUESDAY: Mostly Cloudy with showers, afternoon clearing. Highs near 48. OVERNIGHT: Partly Cloudy. Lows near 32. WEDNESDAY: Mostly Sunny. Highs near 40. OVERNIGHT: Partly Cloudy. Lows near 32. THURSDAY: Mostly Cloudy skies with showers. Highs near 47. OVERNIGHT: Mostly Cloudy. A few showers. Lows near 36. FRIDAY: Sun and Clouds. Highs near 42. OVERNIGHT: Partly Cloudy. Lows near 28. HAVE A GREAT WEEKEND - HAPPY HOLIDAY - HOPE IT IS GREAT FOR YOU AND YOUR FAMILY. MANY BLESSINGS. 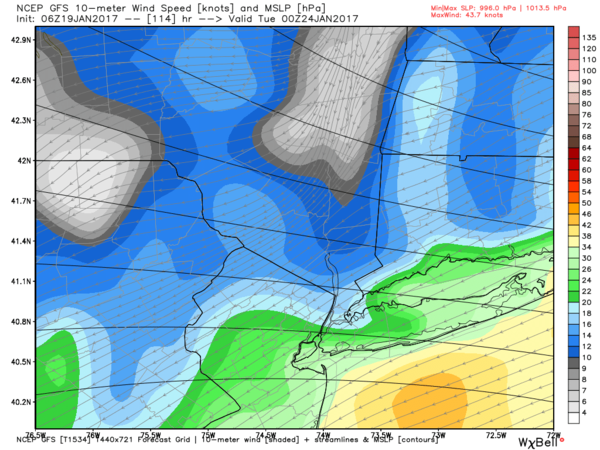 WINDS AND COLD WEATHER ON THE WAY…..
this afternoon. Winds West-Northwest 15 to 25 gusting to 40 mph. Highs near 53. Mostly Clear, Windy and Cold. 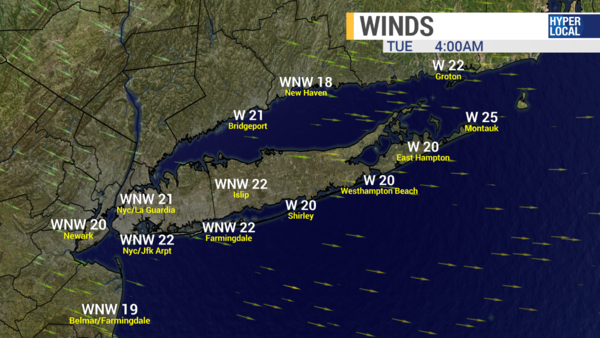 Winds West-Northwest 15 to 25 gusting to 40 mph. Lows near 26. Wind Chills in the teens. Sunrise: 7:16am. skies with some light snow towards morning. Lows near 26. Wind Chills in teens. 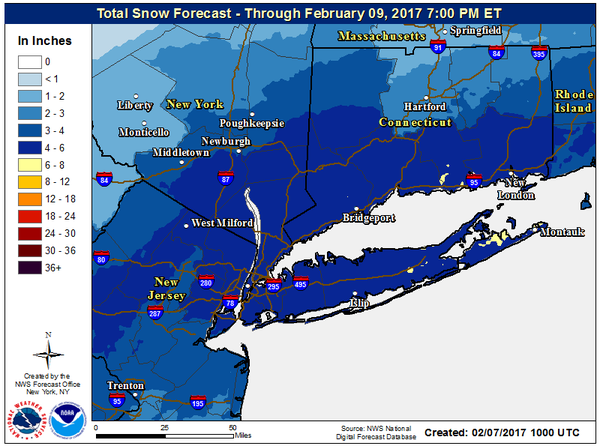 links are snow totals from the national weather service,. Mostly Cloudy and Cold. Lows around 24. NE snowfall - you can see the major lake effect snow. near 30 degrees. 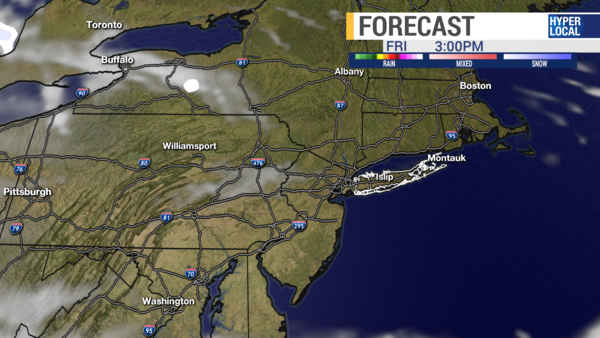 OVERNIGHT: Partly to Mostly Cloudy. Lows around 17.
a few inches of snow. Sun and Clouds. Highs near 30. OVERNIGHT: Partly Cloudy. Looking at the below maps GFS model to EURO Model. 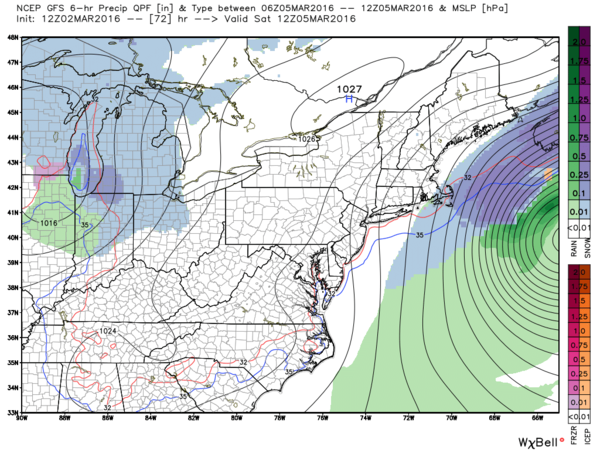 The GFS track is further South than the EURO hence less snow. 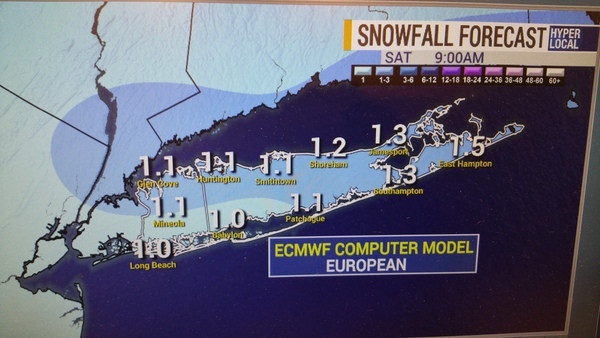 IF the European Model is correct we could see a chance maybe 3 to 5 inches Saturday night into Sunday. Right now too early to tell. We watch the trends. near 32. OVERNIGHT: Partly Cloudy. Lows near 24. TUESDAY: Mostly Sunny. Highs near 40. 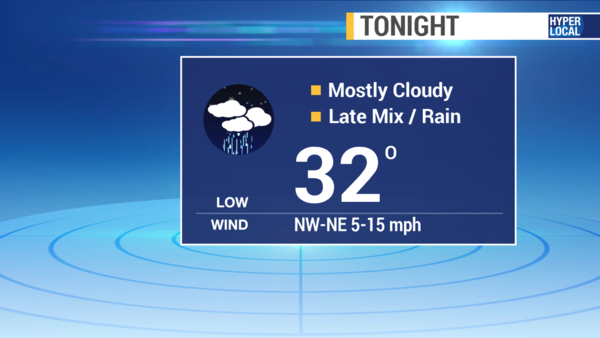 OVERNIGHT: Mostly Cloudy and lows 25 to 32.
skies and a few showers. Lows near 32. 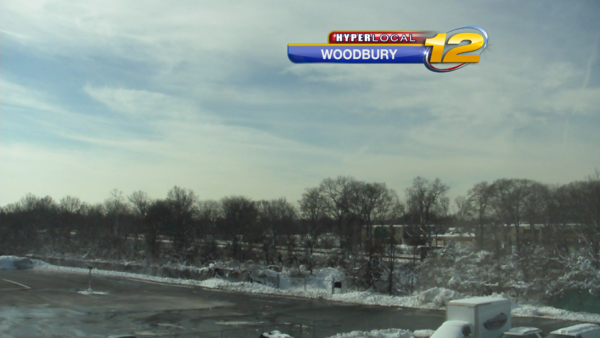 More typical winter conditions back on Long Island. After highs on Wednesday in the 50s, Highs now in the 30s. 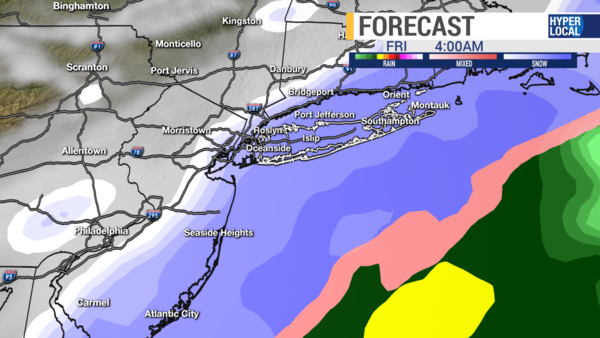 Quick moving snow overnight into Friday. 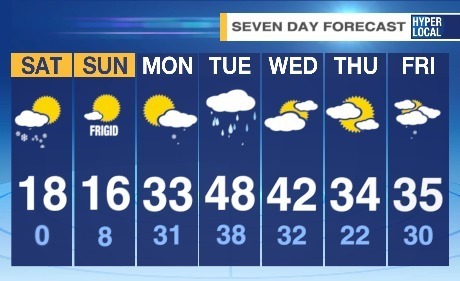 Cold weather through Monday. TODAY: Morning sunshine giving way to afternoon clouds. Winds West-Northwest 10 to 20. Highs near 35. Sunset: 4:39pm. 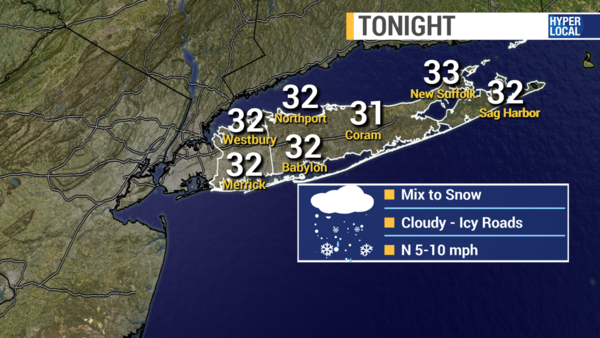 TONIGHT: Cloudy skies and light snow and flurries developing between 10pm and 1am. Winds Southwest to Northwest 5 to 10 mph. Lows near 25. 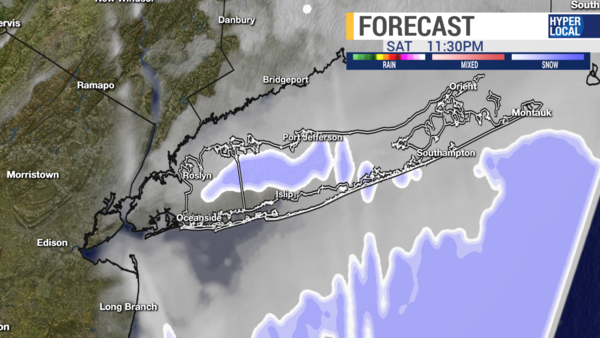 Light to Moderate Snow at 4am, Notice darker colors means heavier snow, this is why highest totals will be in Suffolk County. FRIDAY: Cloudy, breezy and cold. 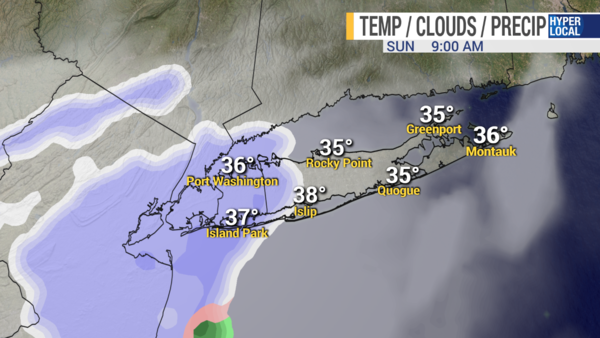 Light snow and flurries tapering off towards 10am. Highs near 35. Snow total 1 to 3 inches. Highest totals on the South Shore and East End. 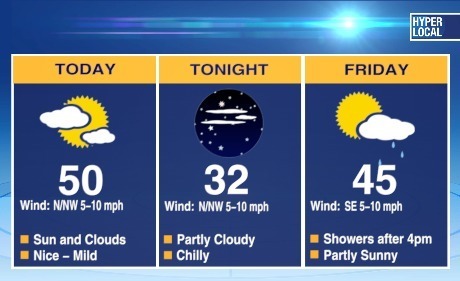 FRIDAY NGIHT: Partly to Mostly Cloudy and Cold. Lows around 20. 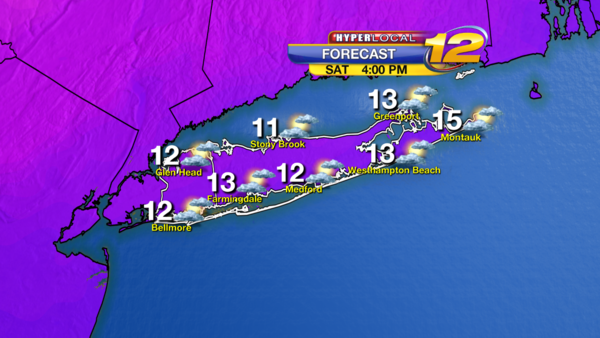 SATURDAY: Partly sunny, breezy and cold. 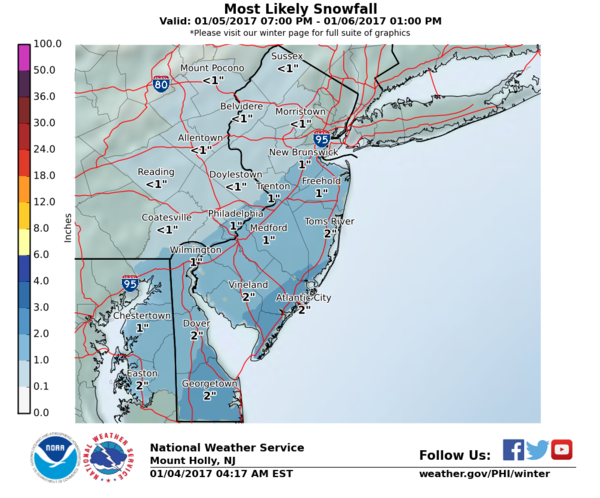 Chance of snow showers towards evening. Highs near 30 degrees. 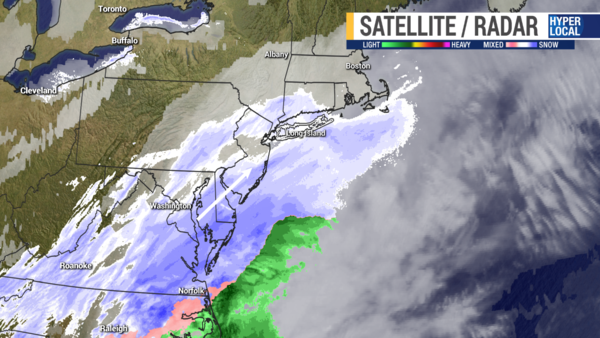 TRACKING COASTAL STORM: As of now, it looks to stay off shore. Will watch closely. 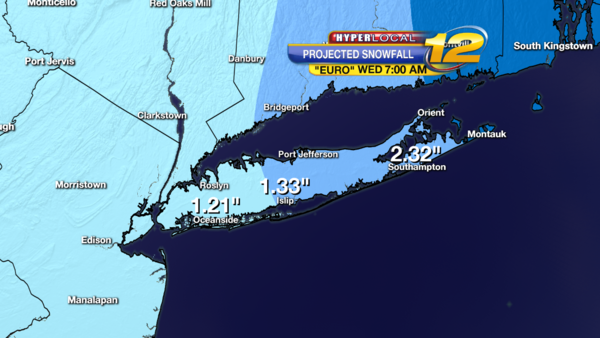 If storm moves northwest we will see some snow accumulation. SATURDAY NIGHT: Partly to Mostly Cloudy. 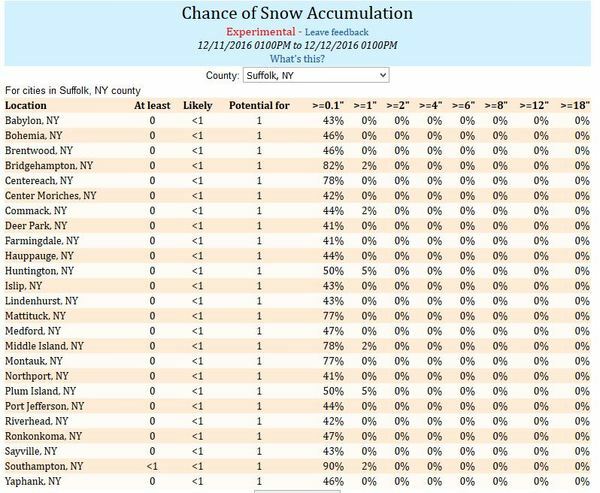 Chance of snow shower. Lows around 18. SUNDAY: Sun and Clouds. Cold. Highs near 28. SUNDAY NIGHT: Partly Cloudy. Breezy and Cold. Lows near 13. Wind Chills 5 below to 5 above. MONDAY: Mostly Sunny. Breezy and Cold. Highs near 30. MONDAY NIGHT: Partly Cloudy. Lows near 20. TUESDAY: Sun and Clouds. Highs near 40. TUESDAY NIGHT: Mostly Cloudy and lows 25 to 32. WEDNESDAY: Cloudy with Showers. Highs 43 to 48. WEDNESDAY NIGHT: Mostly Cloudy skies and a few showers. Lows near 34. Good morning! I just wanted to post a brief update on the latest forecast for you here this morning with our latest snow totals. It is definitely plenty cold to support snow! These temperatures will remain fairly steady through the day. 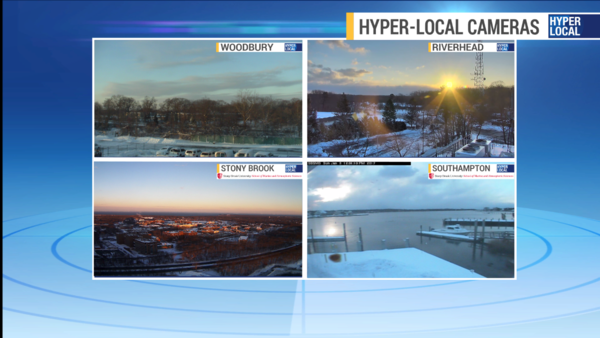 With temperatures this cold, we're looking at a drier and more powdery snow. That's important because the wind will be a factor today and aid in blowing that snow around a bit. Have a great day and be safe! Good morning! We had a partly sunny start to the day today, but even though we are seeing some sun to start, don't let that deceive you! It is downright frigid outside! Early morning temperatures were in the teens, but as if that's not cold enough...it feels even colder! 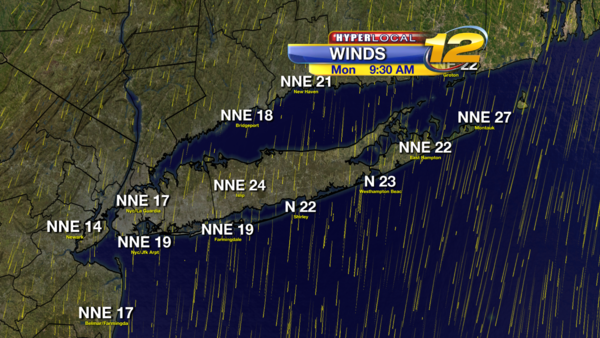 We still have a windy day today with winds NW 15-25 mph. Early this morning, winds were sustained around 5 to 15 mph with gusts 20 to 25 mph. 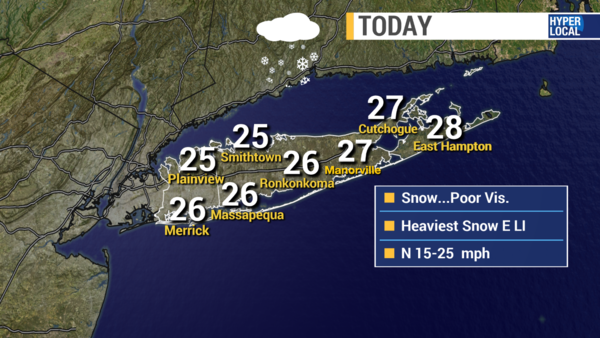 Let's quickly recap our storm from yesterday - our first significant widespread Long Island storm of the season so far! 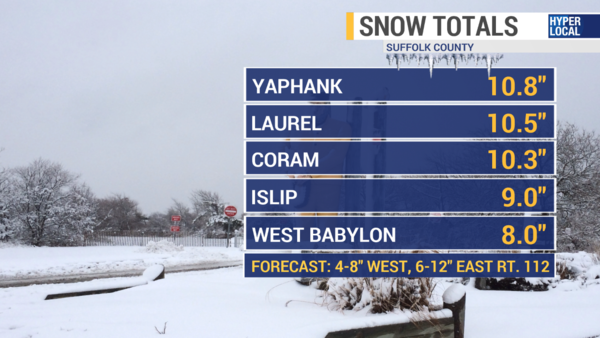 Let's look at Suffolk first - our early morning forecast numbers yesterday before the first snowflakes flew were 4 to 8" West of Rt. 112 and 6 to 12" East. 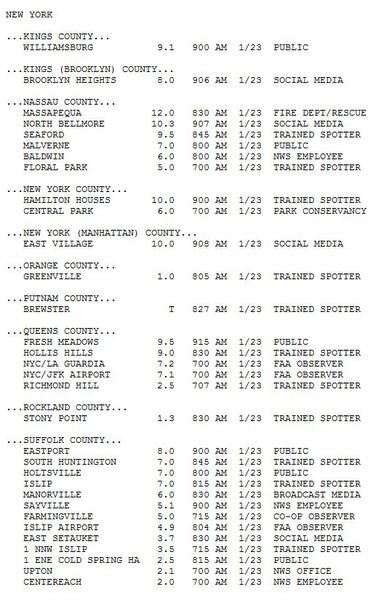 In the end, we were towards the higher end of the 4 to 8" in Western Suffolk with a few locations overachieving by around an inch or so. East of Rt. 112 - within range - around 10" to 12"
In Nassau, as you can see above, we were forecasting 4" to 8" before the first flakes fell and ended up on the higher end of that, with several locations exceeding by one or two inches. Take a look at the futurecast images below and we'll notice that we do run the risk for some flurries or a passing steadier snow shower this afternoon. We are not talking about anything that would really accumulate on top of our snow from yesterday. 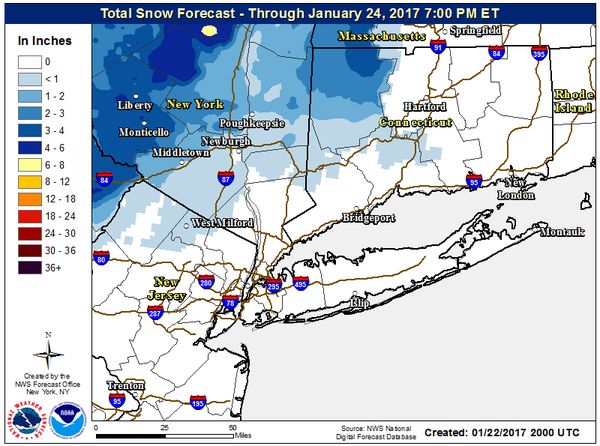 At worst, a dusting or fresh coating will be likely under any steadier snow shower should one hold together well passing over Long Island. A brief chill for the weekend. 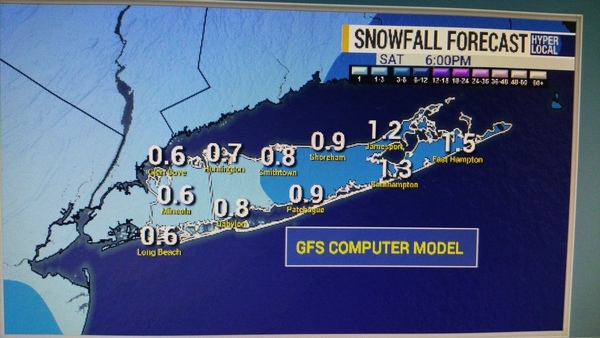 Chance of a little light snow Saturday evening. Warmer and a little wet next week. 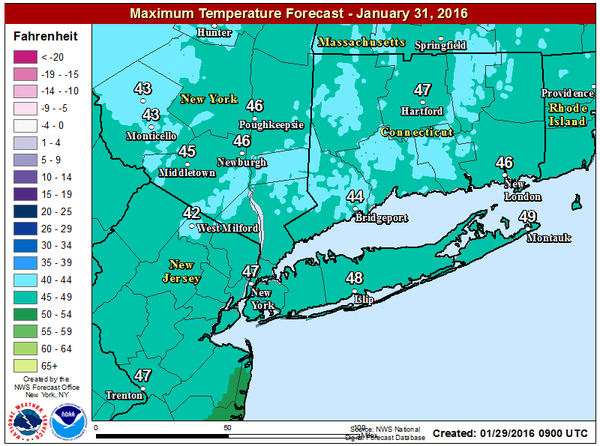 TODAY: Temperatures this morning will drop from the 50s into the 40s this afternoon. 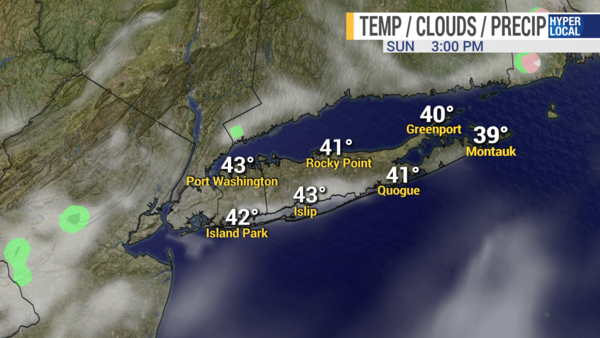 3pm Temperatures around 43. Winds Northwest 10 to 20 mph. Breezy and colder. Sunset: 4:48pm. FRIDAY 3PM WEATHER CONDITIONS - DRY AND SUNNY, BREEZY AND COLD. TONIGHT: Partly Cloudy Skies. Cold. Winds Northwest 5 to 15 mph. Lows near 23. SATURDAY: Mostly cloudy skies. Light snow or flurries developing late afternoon into the evening. Highs near 34. SATURDAY NIGHT: Mostly Cloudy with some light snow or flurries. Little to NO snow accumulation. Lows near 26. 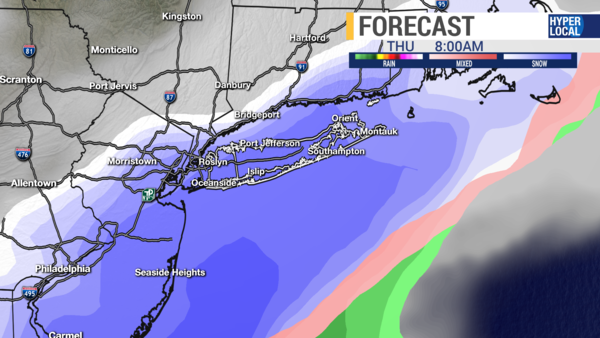 Most of the energy from the storm will be south of Long Island. If it moves a little north, maybe an inch or so. 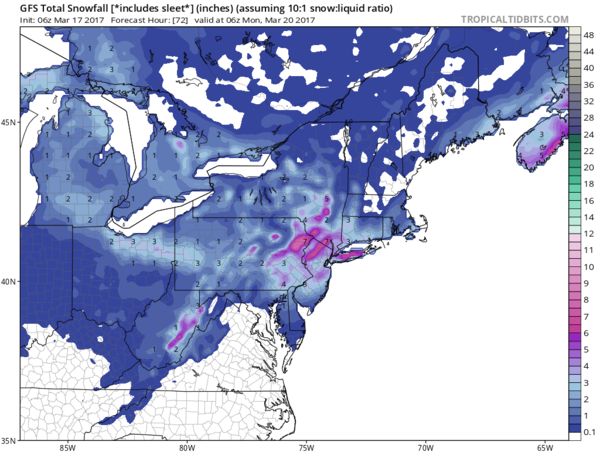 Below maps show snowfall from different computer models. SUNDAY: Mostly Sunny. Breezy. Highs near 39. SUNDAY NIGHT: Partly Cloudy. Lows near 25. TUESDAY: Mostly Cloudy Skies. Showers towards evening. Highs near 45. OVERNIGHT: Mostly Cloudy skies. Showers. Lows near 38. WEDNESDAY: Mostly Cloudy Skies. Scattered showers. Breezy. 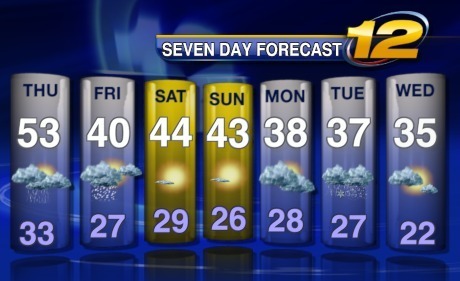 Highs near 48. OVERNIGHT: Mostly Cloudy. A few showers. Lows near 38. THURSDAY: Mostly Cloudy Skies. Scattered showers. Breezy. Highs near 50. OVERNIGHT: Mostly Cloudy. A few showers. Lows near 38. Good Morning. 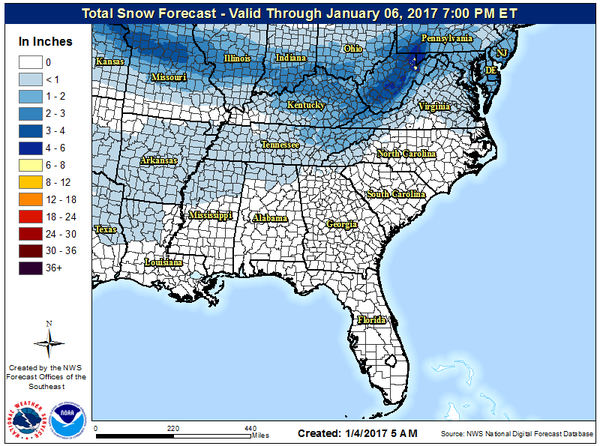 Weather updated by Meteorologist Rich Hoffman at 630am on Thursday January 19th 2017. ABOVE NORMAL THROUGH NEXT WEEK. with strong winds and heavy rain. and Clouds. Winds North-Northwest 5 to 10 mph. Highs near 50. Sunset: 4:54pm. the late afternoon. Highs near 45. SATURDAY NIGHT: Mostly Cloudy. Lows 35-40. 47. 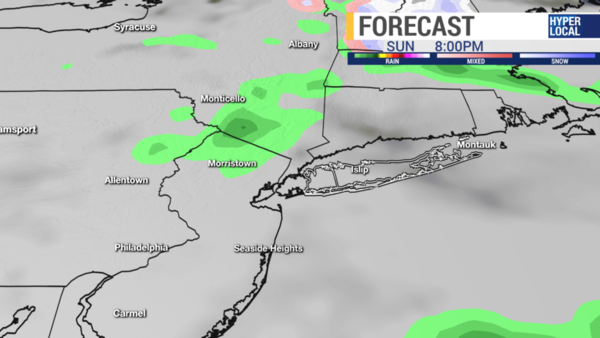 SUNDAY NIGHT: Mostly Cloudy with showers. Breezy. Lows near 36. STORMY - Cloudy skies with Rain. Rain, Heavy at times. 1 to 2 inches. Some street flooding possible. 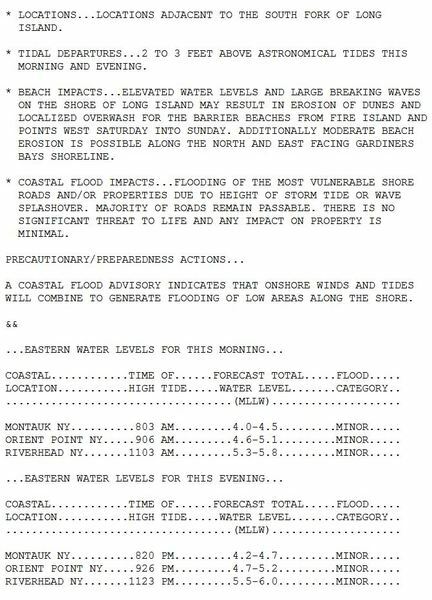 Possible coastal flooding and beach erosion. Windy. Wind gusts 30 to maybe 45 mph. Highs near 46.
with showers. Windy. Lows near 38. What about snow...... 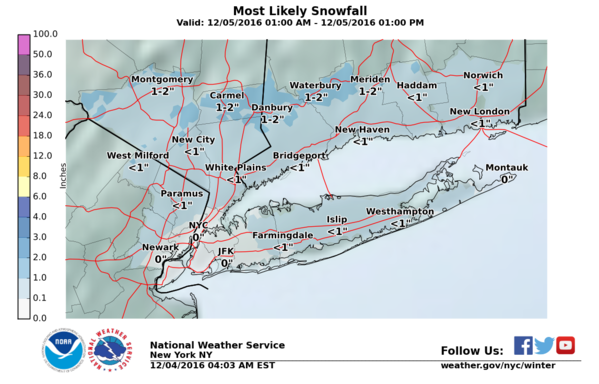 Yes there will be snow, but NO snow for Long Island -- Unless there is a huge shift in the storm track - Snow will fall in Northern NY into New England. Cloudy skies with showers. Breezy. Some street flooding possible. 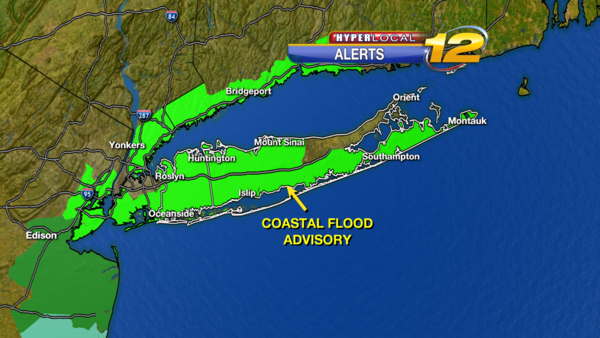 Possible coastal flooding and beach erosion. 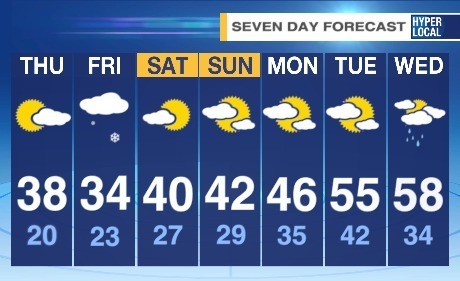 Highs near 48.
showers. Lows near 38. 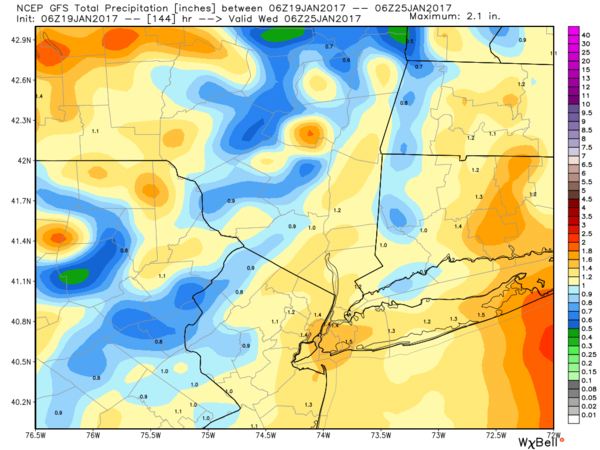 3 DAY RAIN TOTALS 2 to 4 inches possible. Sun and Clouds. Highs near 50. WEDNESDAY NIGHT: Partly Cloudy skies. Lows near 35. Sun and Clouds. 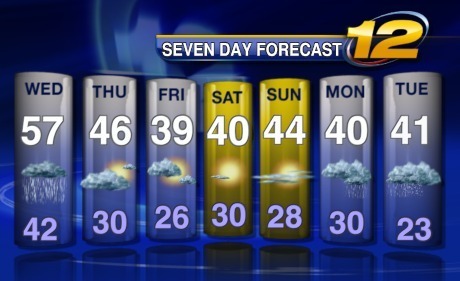 Highs near 48. THURSDAY NIGHT: Mostly Cloudy. Lows near 32. I hope you are all off to a great start to the weekend! We have quite the weather ride on the way for Monday and not the best of weekends of weather either. So, let's go over it! 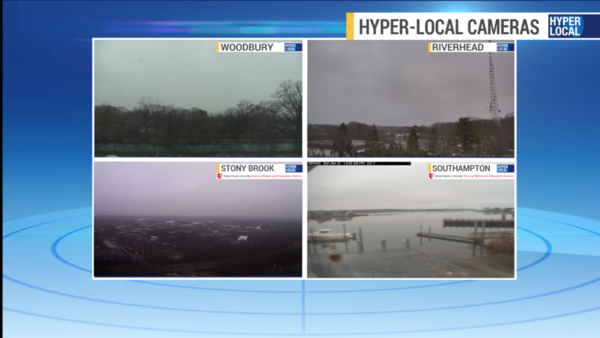 We started off today with an overcast sky and also some reduced visibility in spots with patchy fog. Areas of fog will be returning tonight. Late tonight, it's still mainly cloudy and it will be dry before midnight. 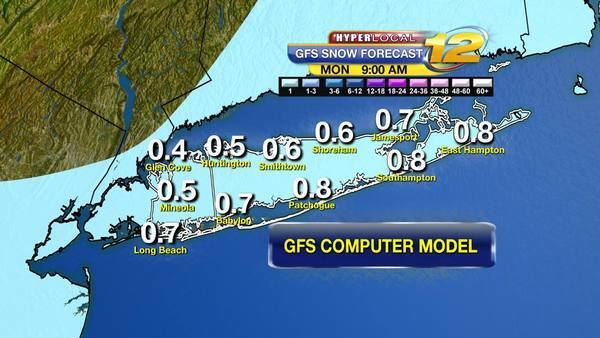 By Monday, we'll be dealing with a Nor'Easter. You can clearly see those tighter lines. No, that's not an error - that's a STRONG easterly wind gusting 50 to 60 mph. By Monday morning, as you can see above, we'll have SUSTAINED WINDS 25 to 35 mph with much higher gusts. 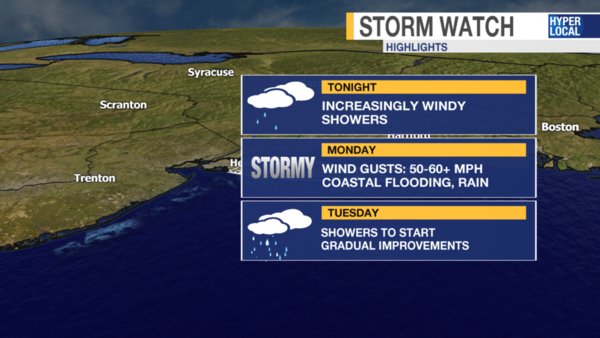 So our STORM WATCH HEADLINES: Coastal flooding will be a big concern Monday as well. Through Monday evening, we're looking at 1-2" of rain with some additional rain after 7pm Monday too. To recap today - Mainly Cloudy - light winds for now - highs WELL above average in the low 50s! Tonight will be dry to start, but expect a shower late after midnight. Good evening! 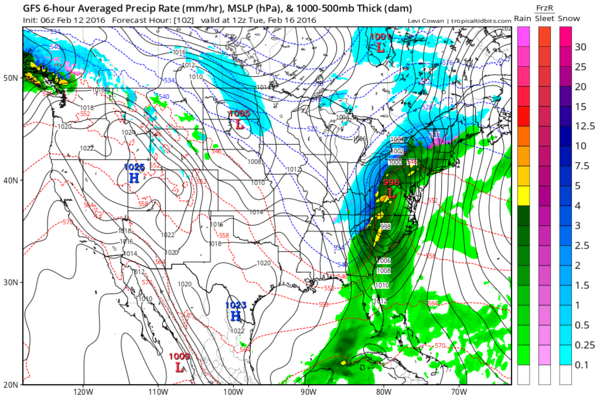 While the southeast US has been dealing with severe weather, including tornadoes, this weekend, we gear up for our nor'easter that arrives Monday. Today we've seen a lot of clouds and we did have some breaks of sunshine too. Temperatures stayed very mild again with highs into the upper 40s and lower 50s! 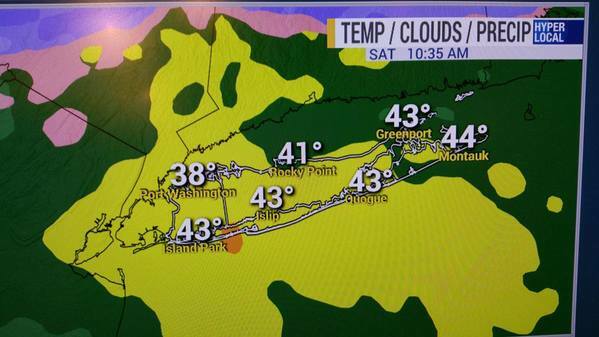 Islip MacArthur Airport hit a high of 54 today. This is actually a NEW RECORD which breaks the previous record of 51 degrees set last in 1986! However, we have much more important things to talk about than a new record high temperature today. As we go into tonight, you'll notice the wind start to pick up. 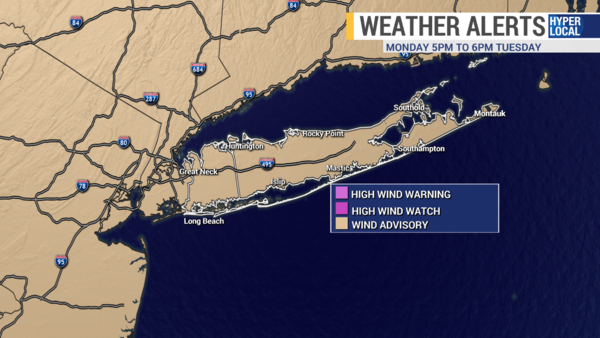 Our HIGH WIND WARNING officially begins 1AM Monday and goes until 1AM Tuesday. 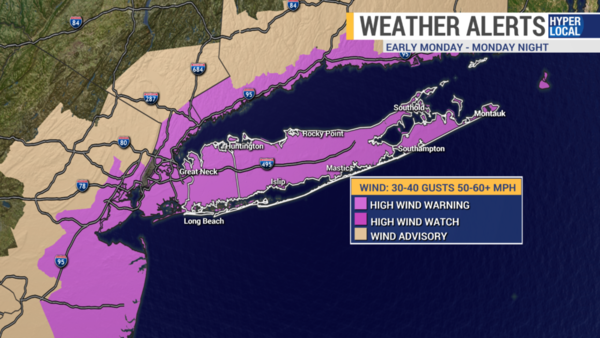 We're looking at sustained winds of 30-40 mph with gusts at least 50-60 mph. It is very possible to see some isolated gusts that go higher than this. 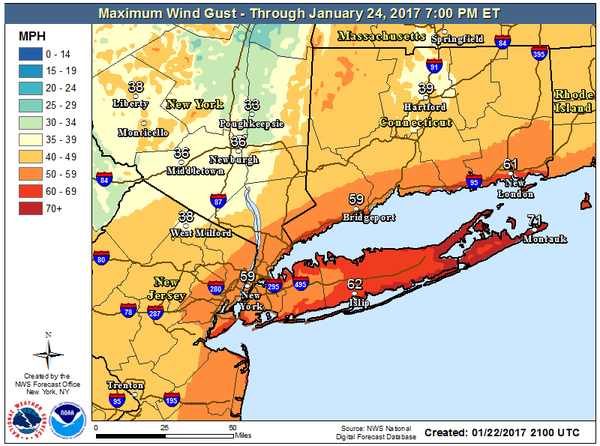 In fact, take a look below and you can see what the National Weather Service is outputting for the MAXIMUM potential wind gust through the storm. 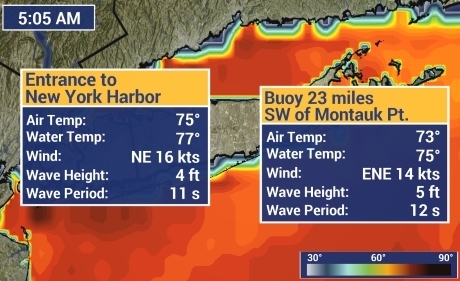 Montauk point with the potential to see a 70+ gust! Whether it's 50-60 mph or a few higher gusts, these winds mean business and will create problems tomorrow. This means we'll likely see at least some power outages...with the best chance for this during the afternoon and evening hours on Monday. We'll be bordering on the "moderate" potential by that point. 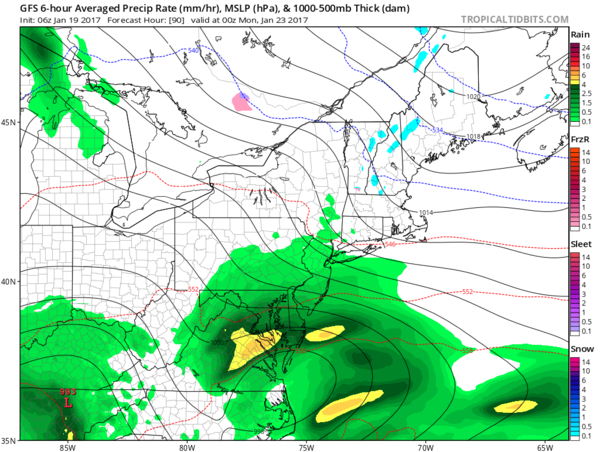 Monday morning around 7AM...expect light rain showers...nothing too crazy with the rain just yet, but by this point the WIND will really be cranking already and we could see some MINOR coastal flooding during the early high tide cycle. By early afternoon, and definitely by 3PM as depicted here, we're looking at moderate to heavy windswept rain and dangerous driving conditions. We have to watch for some ponding on roadways in addition to the strong, gusty winds. Well to our NW, there could be some wet snow mixing in, but this is NOT the case this time for Long Island. Showers will linger Monday night and into the day on Tuesday. Throughout Tuesday, we will see gradually improving conditions with some clearing by Tuesday night. 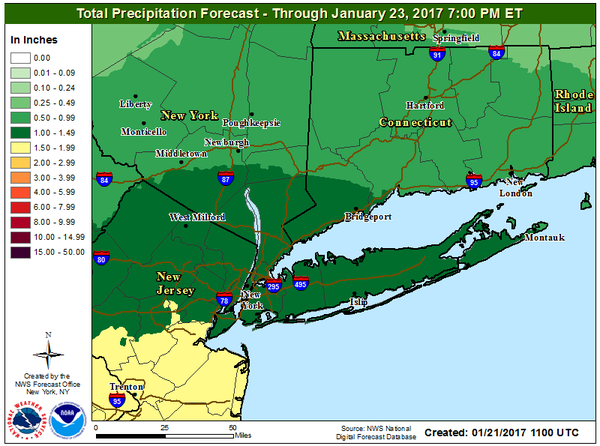 Total rainfall amounts through the storm look to be on the order of 1 to 3 inches with some locally higher amounts possible. 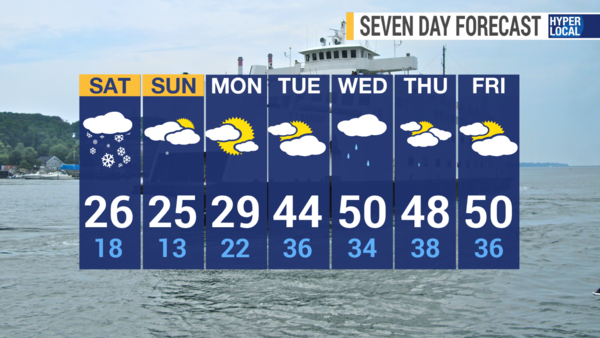 Once we get through the storm, we get the return of sunshine on Wednesday and it looks like drier weather will prevail for the rest of the week. 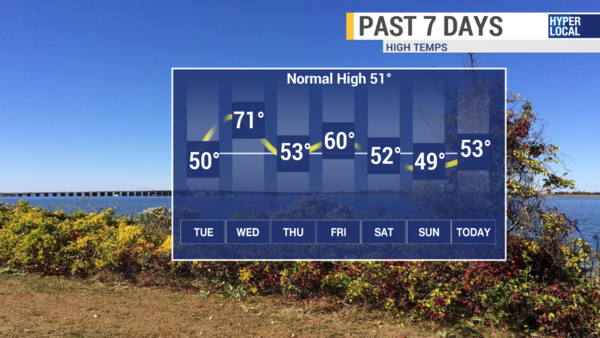 It stays quite mild for Wednesday and Thursday. 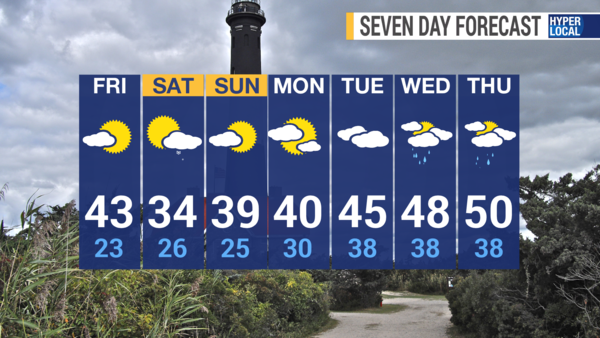 After that, temperatures drop to near seasonable levels Friday into next weekend. That's all for now. 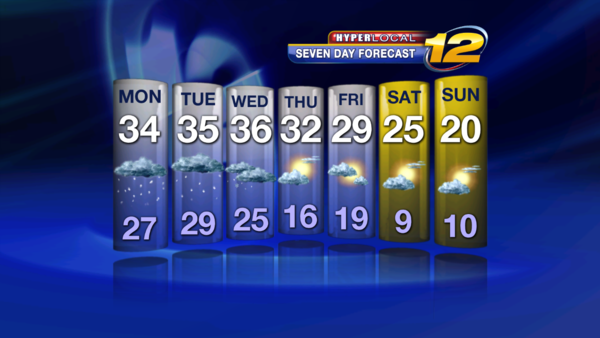 Please tune into Bruce Avery this evening and overnight on News 12 Long Island for updated forecasts. Rich Hoffman will guide you through the weather during the morning rush followed by Bill Korbel in the afternoon and evening. Feel free to reach out to me as well on Facebook, Twitter or Instagram and I'll do my best to respond. Also, tomorrow -- we can certainly use your storm photos and video! PLEASE ONLY TAKE PHOTOS AND VIDEO IF YOU CAN DO SO SAFELY! 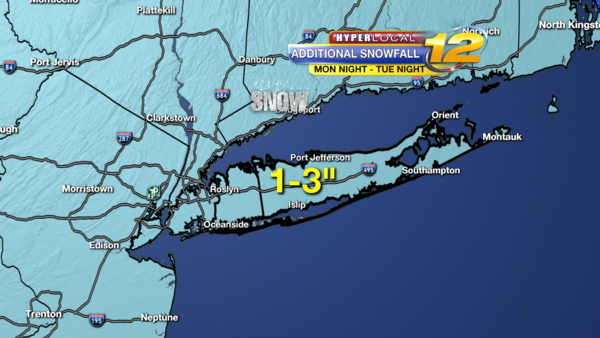 You can share with us on social media and email us at LIDesk@news12.com. From all of us here at News 12, we hope you stay safe during the storm and we'll do our best to give you the most up-to-date and accurate information possible. Going to be a fun next 60 hours. 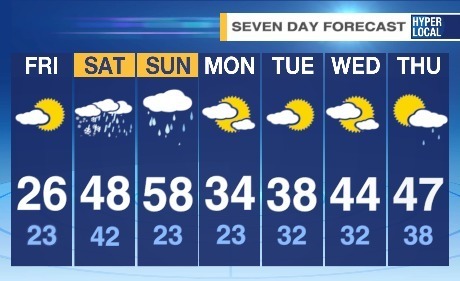 Chance for record highs and then 12 hours later, breaking out the shovels. On and off rain today one batch this morning and another early afternoon, looks like around quarter of an inch or rain. 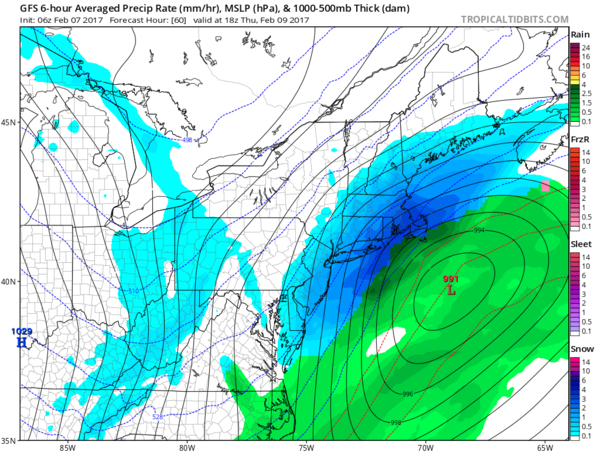 Warm for Wednesday… and then track of coastal storm is important – looks like we are on the northern edge so any shift in track will change snow totals. 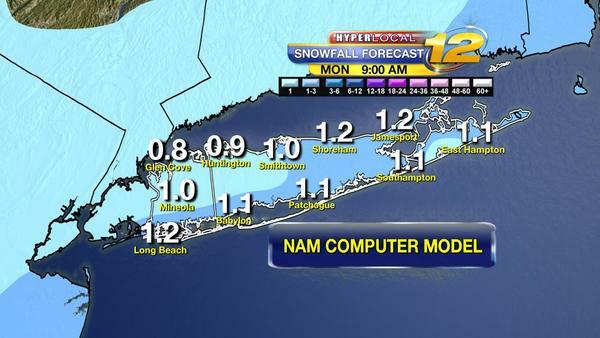 Tracking coastal storm - Most of the Major forecast models call for a moderate snowfall 3 to 8 inches. As we know with all storms track is very important. 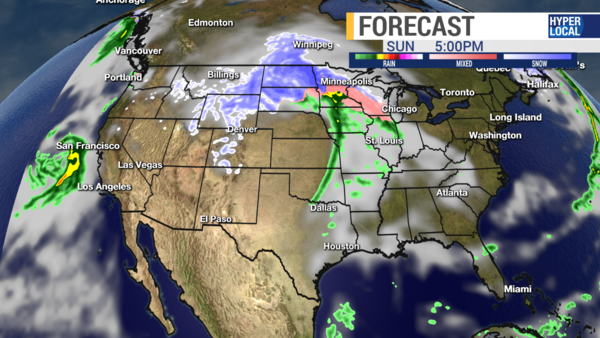 The storm will be fast moving and we have a high near Hudson bay that could suppress the south to the south. 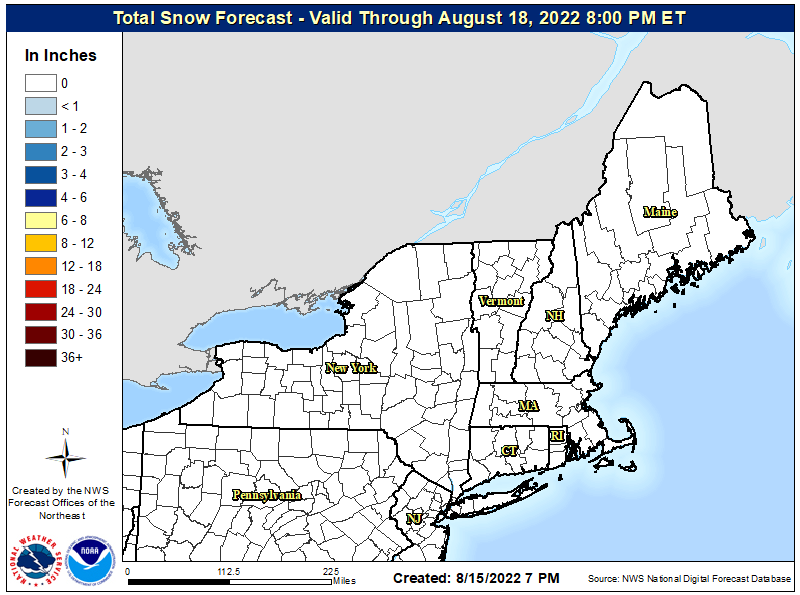 These would lower snow amounts. Much better idea tonight when the energy gets closer to the East Coast. TODAY: Areas of Fog and drizzle. Cloudy with periods of rain. South-Southeast 5 to 15 mph. Highs near 47. Sunset: 5:18pm. TONIGHT: Cloudy skies with areas of fog. A few showers. Winds Southwest 10 to 15 mph. Lows near 43. Sunrise: 6:55am. WEDNESDAY: Morning showers giving way to partly sunny skies. Highs near 58. Record High is 59 set in 2009. WEDNESDAY NIGHT: Cloudy skies with rain to wintry mix and then to snow after 2am. Snow could be heavy at times. Lows near 32. 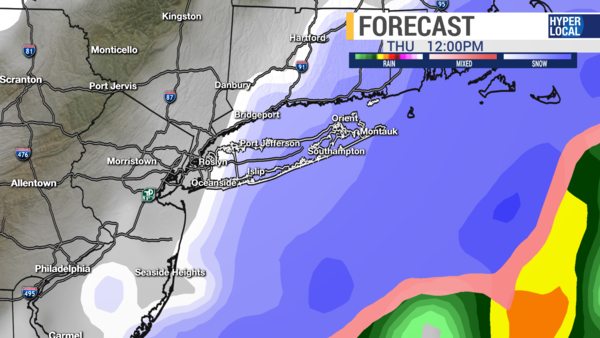 THURSDAY: TRACKING COASTAL STORM. 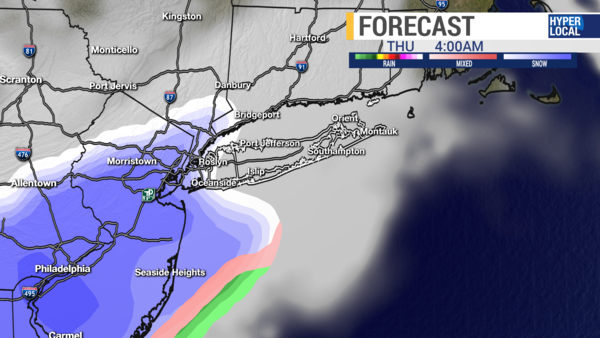 Snow, moderate to heavy in the morning tapering off in the afternoon. Get the shovels ready with potential of more than 3 inches. We the right track we could see more than 6 inches. Highs near 34. So how much snow? 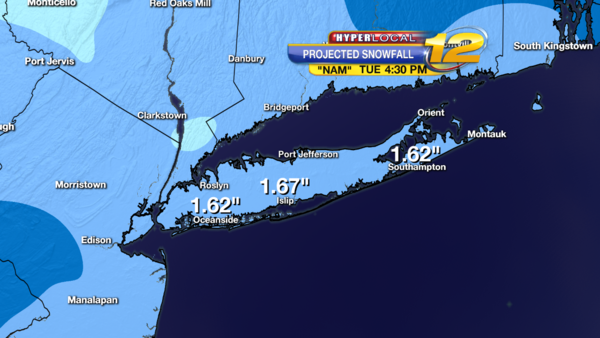 Below are the snow totals from the different models. So with all that being said, How much snow are we getting rich.. ? 3. Track is important - we are on the northern edge so any movement south or east we will see less snow. 4. 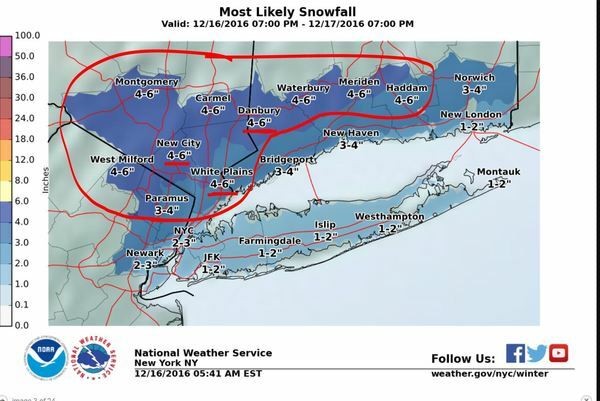 As of Tuesday morning - my idea - Northern and Western areas of Nassau county 3 to 5 inches of snow, Suffolk county 4 to 8 inches of snow. 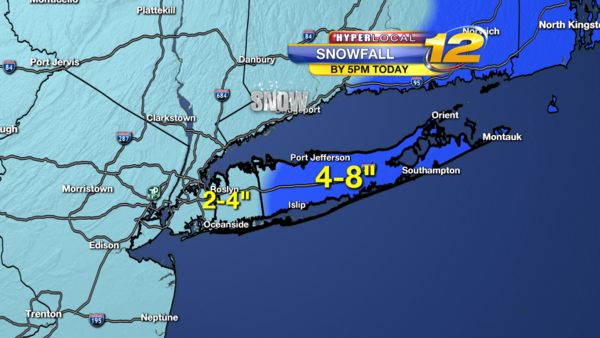 Highest amounts look to be in Suffolk county. 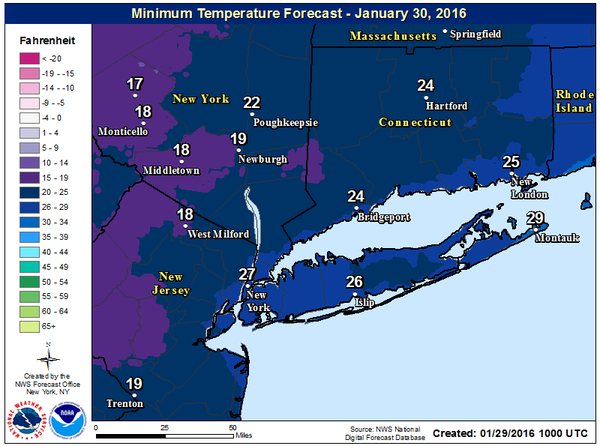 6. very cold weather Thursday night into Friday - lows teens and 20s highs near 30. THURSDAY NIGHT: Partly Cloudy. Cold. Lows 15 to 22. FRIDAY: Mostly sunny and cold with highs around 30. OVERNIGHT: Mostly Cloudy with some snow showers. Lows around 25. 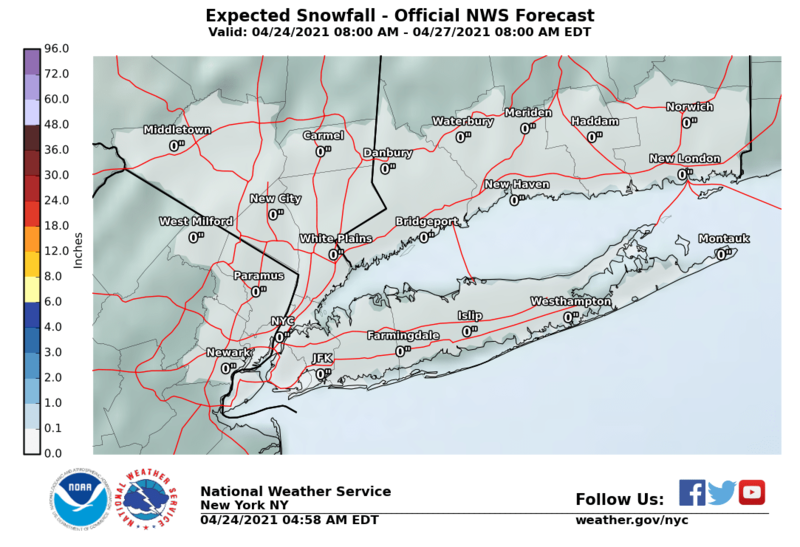 Minor snow accumulation possible. 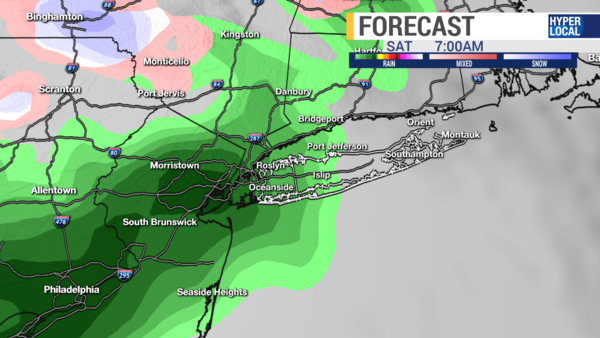 SATURDAY: Morning rain or snow showers possible. Partly Sunny in the afternoon. Highs near 43. 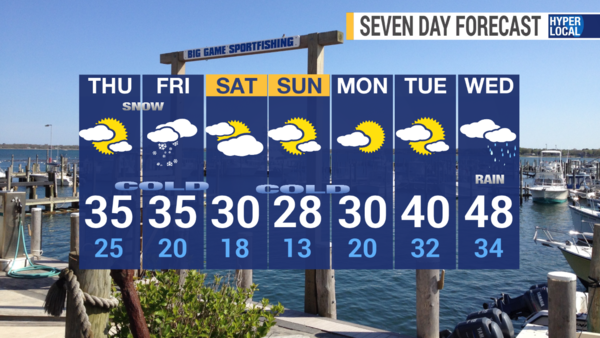 OVERNIGHT: Mostly Cloudy, chance of rain or snow showers. Lows near 32. 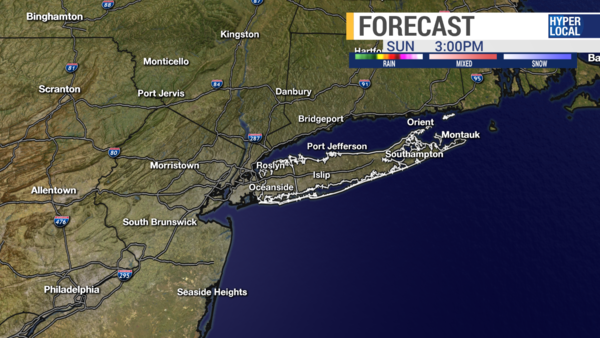 SUNDAY: Cloudy skies with rain showers. Highs near 44. OVERNIGHT: Mostly Cloudy skies. A few showers. Lows near 35. MONDAY: Sun and Clouds. Highs near 44. OVERNIGHT: Mostly Clear. Lows near 30. I hope everyone is having a good start to the weekend. 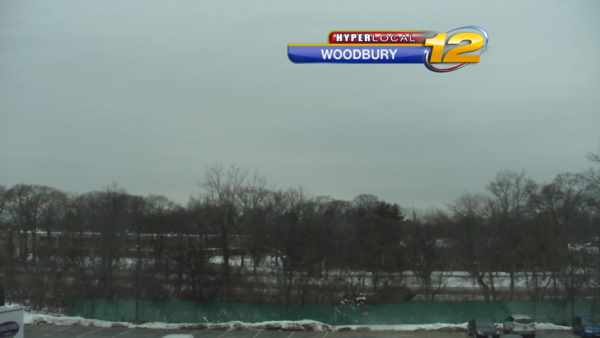 We saw mostly cloudy skies today and we have some wet and wintry weather on the way to discuss. I talked about a lot of this on Facebook this morning (www.facebook.com/MattHammer12) if you'd like to see a video version. Here, you can look at some of those graphics and more in addition to getting full details on the next seven days. So, as we go into tonight...skies will remain mainly cloudy and it'll be dry for much of the night. 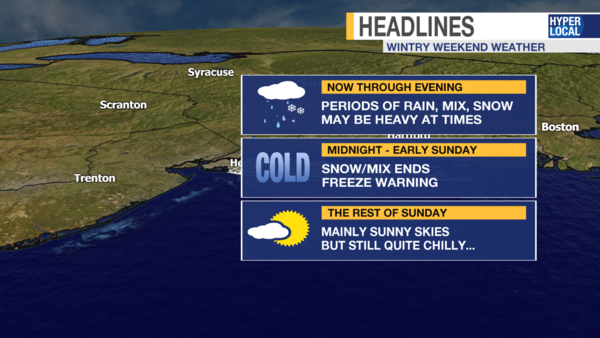 As we look towards early Sunday morning, that's when some big changes arrive. After topping off above average in the mid 40s this afternoon, eventually overnight temperatures will be falling back to around freezing. This is very important because as our next system moves in tomorrow morning, it will begin as wintry weather. This begins to take place well after midnight though. So, any evening plans tonight will be just fine. I'll show you a few futurecast images below. Notice the temperatures. 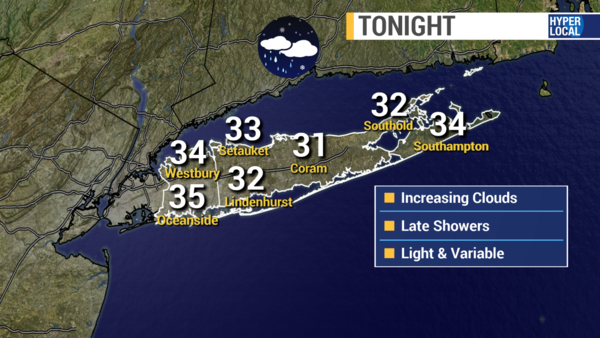 Around 4am the wet and wintry weather will be closing on into Long Island with temperatures likely in the low 30s. By mid-morning, we are watching the chance for some problems. 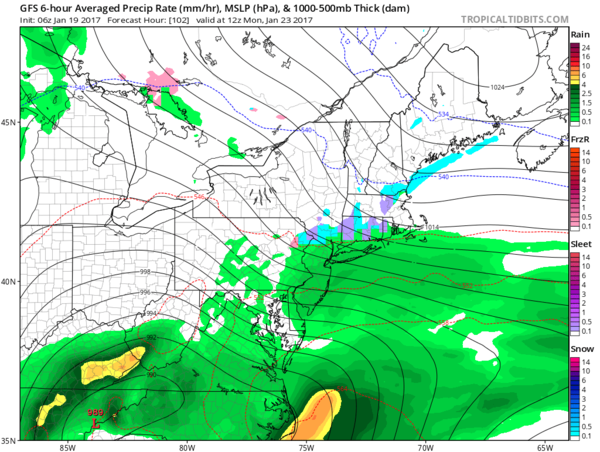 If we keep the colder air in place for a little while (...and I think we do...), we are looking at least a brief period of snow/wintry mix and the possibility of freezing rain. 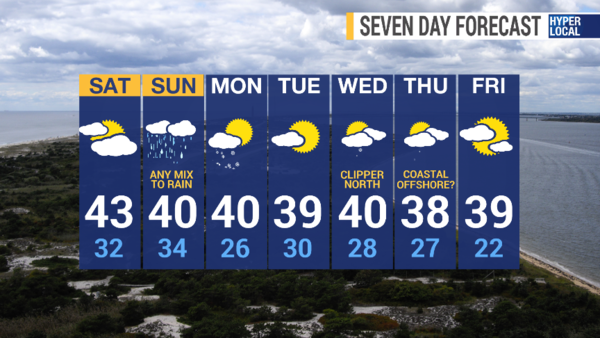 Basically a sloppy, slushy, potentially icy mess before plain rain. It would not take much to create some very slippery travel for tomorrow morning. It's a close call and especially the North Shore could see up to an inch or two of slushy wet snow before a changeover. We'll be watching this closely tonight and tomorrow morning. Roads will likely be very messy to start the day tomorrow. We eventually go over to a plain, cold rain which will likely be moderate to heavy at times. The rain in conjunction with melting snow will create big puddles and may cause some minor issues near poor drainage areas. 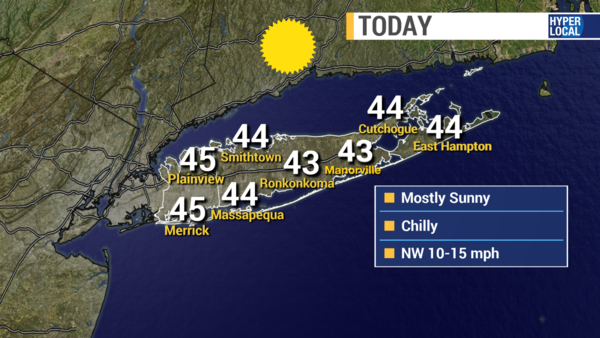 Temperatures barely make it to 40 tomorrow. 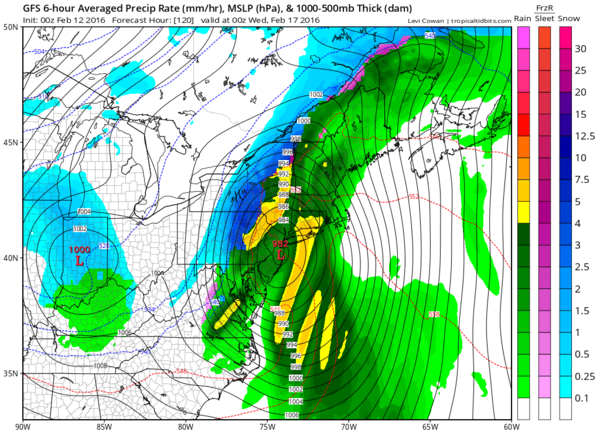 This is all a part of what's going to become a major blizzard for areas in New England NORTH OF LONG ISLAND. 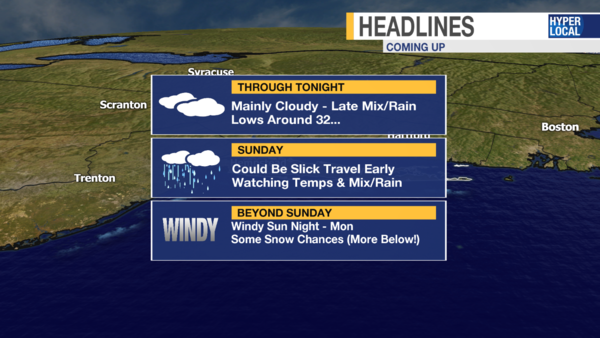 We get the sloppy mess on Sunday, followed by increasing winds and very windy conditions Sunday night into Monday. Wind gusts easily 40-50mph with a few higher gusts possible. 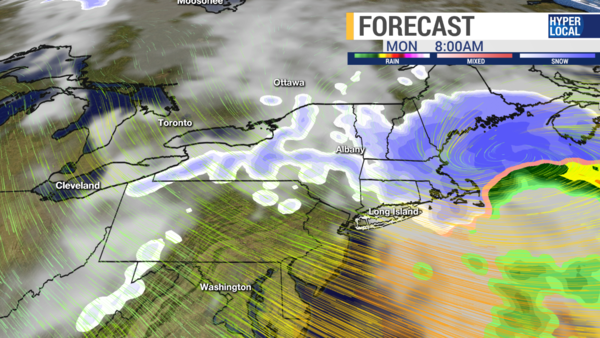 You can see a map of the storm below by early Monday morning. The lines you see indicate a strong wind over the northeast and Long Island on the backside of the storm out of the northwest. This is a colder wind and will help bring some colder air...and potentially some snow showers back in the picture for the first part of Monday. 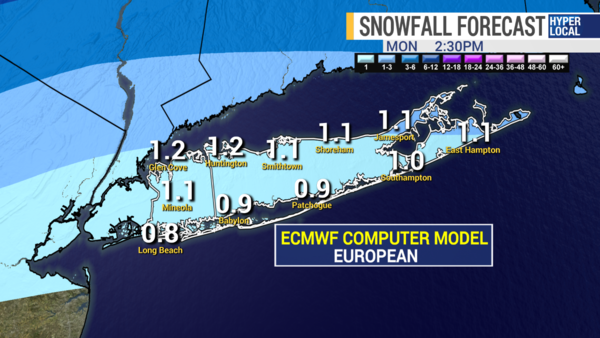 The best chance for any snow will be east on Monday and computer models are suggesting a coating to an inch or two at most right now for that. 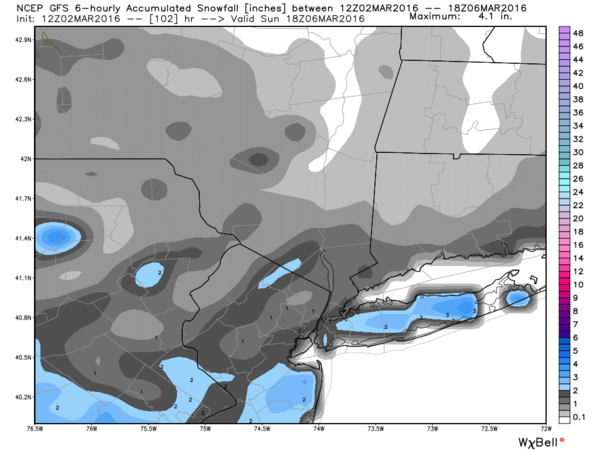 Above you'll see the potential light accumulation projected lighter than the EURO on the North American Mesoscale Forecast System (NAM) model - around a coating to one-half inch on this projection. At the end of the day...it is likely to see a light accumulation and a slick commute Monday morning....after a sloppy Sunday. Tonight - dry, fine, becoming colder. 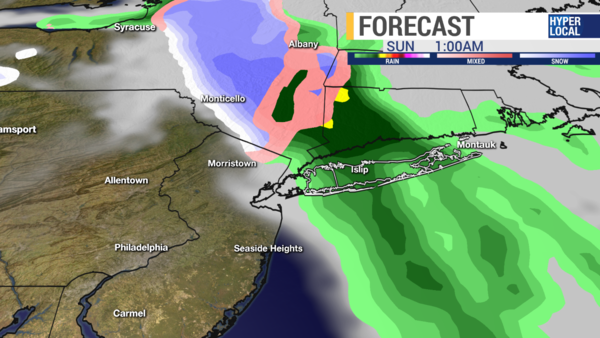 Early Sunday - snow/wintry mix/rain moves in. 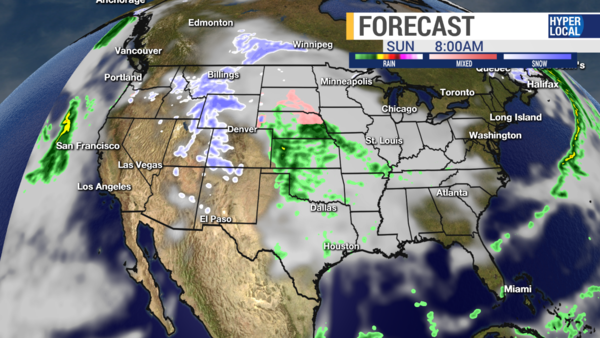 We watch temps and precip closely for any icy, messy travel. Sunday Midday - a cold rain - it's breezy and becoming windier late. 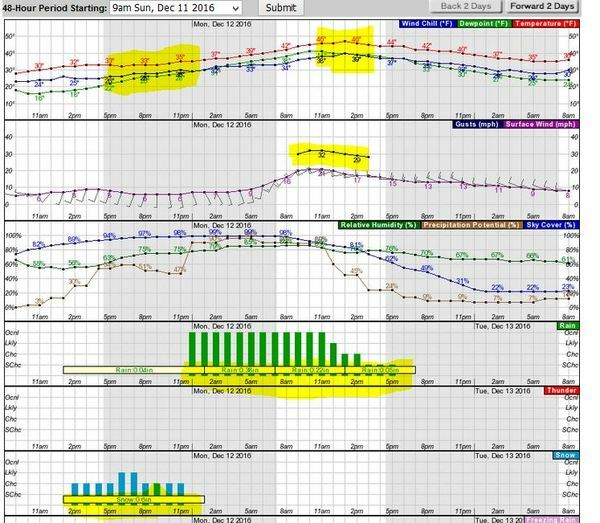 Sunday Night - showers, becoming very windy. 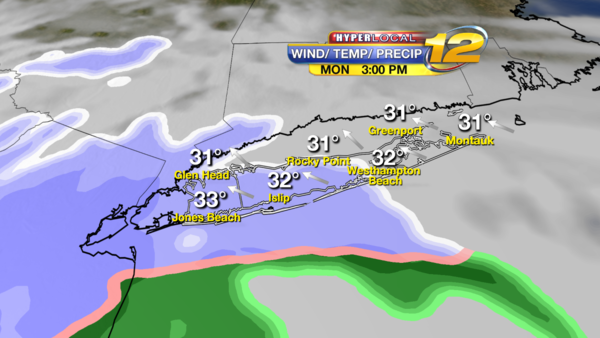 Monday - Very windy with the chance for some morning snow in spots. Tuesday - dry and sunny. 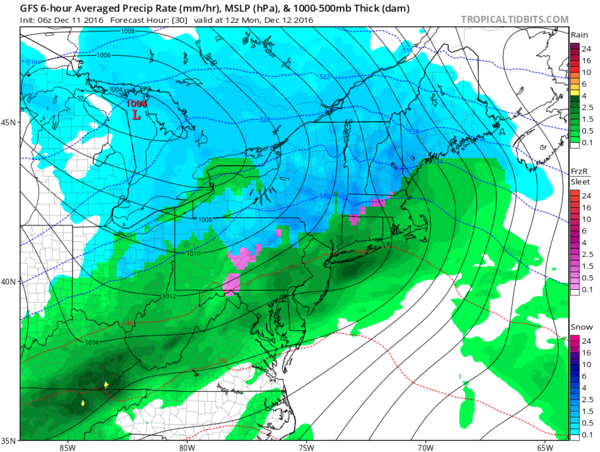 Wednesday - a clipper system passes to our north. 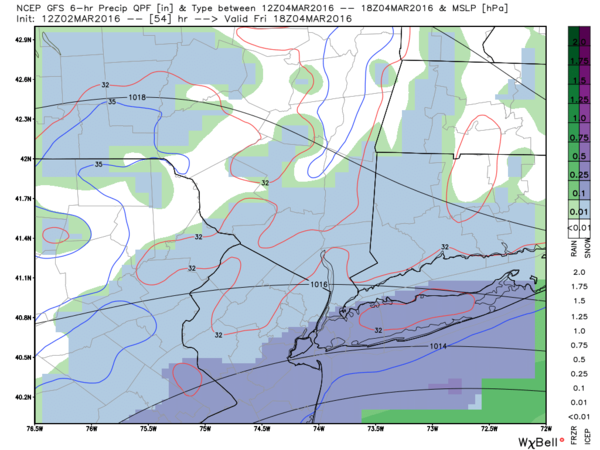 Perhaps some scattered snow showers. 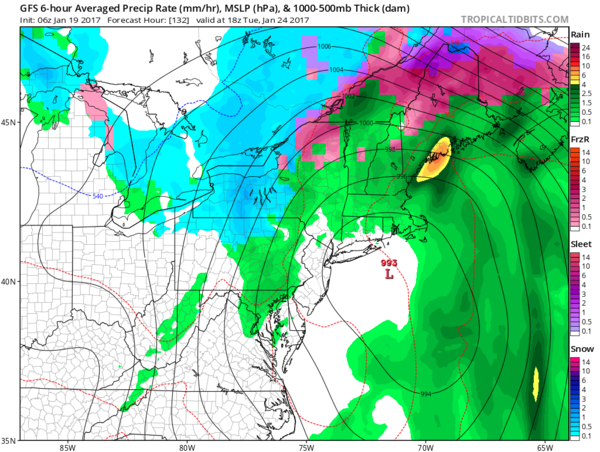 Thursday - You may read online or see on social media people talking about a big storm for Thursday. 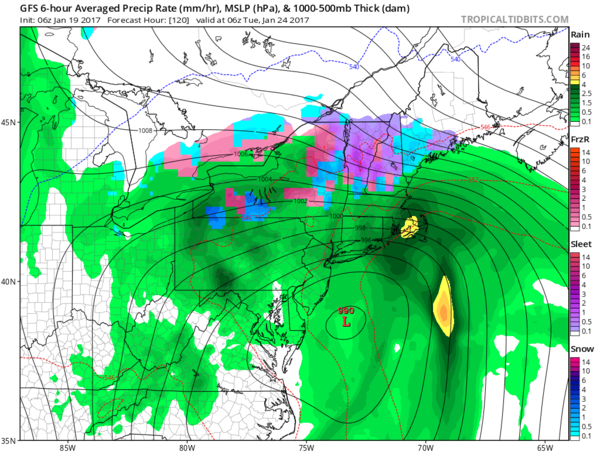 As of today, that storm is shown offshore. This could change and we really won't start to have a good idea on its whereabouts until Monday. Feel free to reach out to me on Facebook, Twitter or Instagram and have a great Saturday! I will update quickly on those pages before sleep tonight and be back on-air at 7AM with any potential issues tomorrow morning. Happy Saturday everyone! We'll keep this brief because the weather is very much cooperating this weekend. 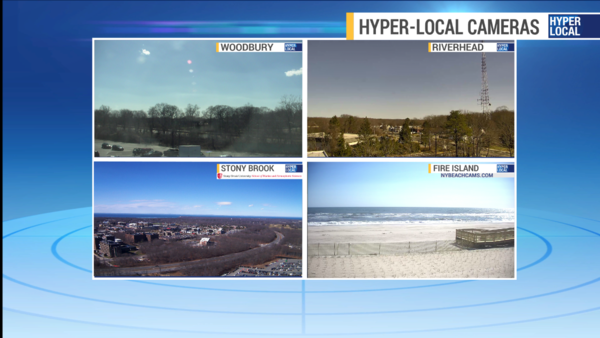 We are seeing gorgeous conditions all across Long Island today. 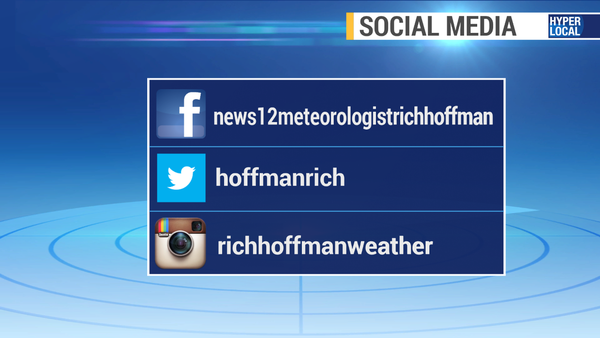 If you happen to take a weather related photo be sure to send it my way on social media - thanks! 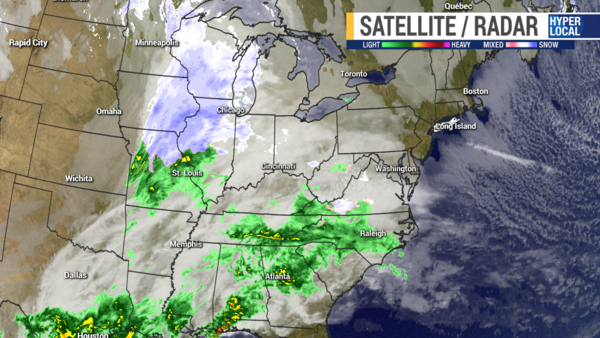 We have nice, dry weather in control across much of the northeast today. We'll see some fair-weather clouds around, but that's it. Our morning low temperatures were COLD, but actually close to the average of around 26 in most spots. These temps are the coldest we'll see all weekend! FUTURE WEATHER MAP for the middle of this afternoon shows mainly sunny skies and highs in the upper 40s to low 50s...normal high is 41. Then, get ready for an even warmer day tomorrow! Mostly sunny skies develop again with highs in the upper 50s. The exception being the east end, but it will still be well above average there too. 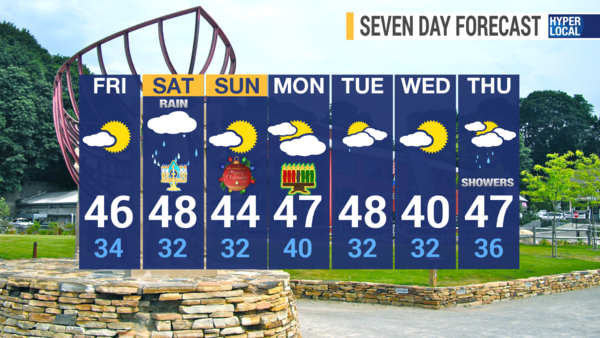 Over the next seven days we will see mainly dry weather. Also, mostly above average temperatures. The chilliest weather will be Monday and Tuesday. 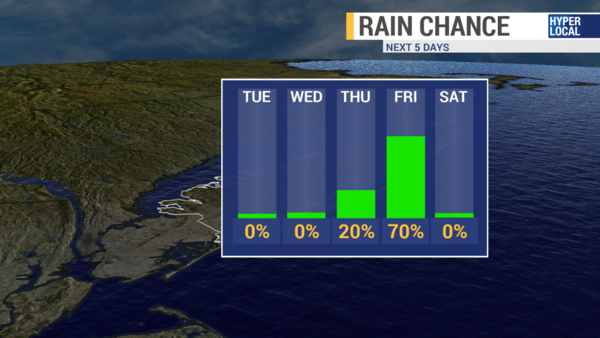 A few rain showers are possible Wednesday and then we have a shot at some steadier rain for the start of next weekend. Good afternoon! It is certainly tough to fathom the return of winter in a big way as we look to tomorrow and the weekend when we are enjoying more warm temps today! However, that's exactly what's going to happen. We've also seen an enhanced risk for the spread of wildfires today due to low humidity levels and our strong, gusty winds. 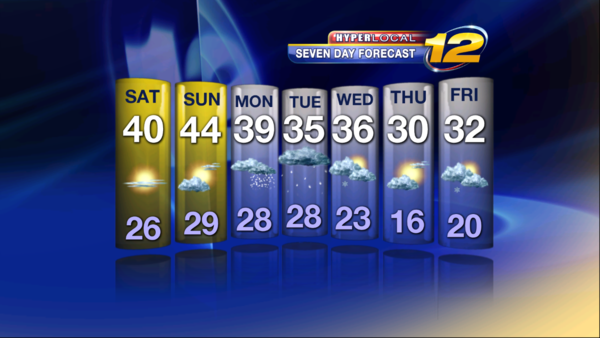 We have a nuisance snow on the way for tomorrow and there is still the chance for another winter storm early next week. So, let's go over the latest. 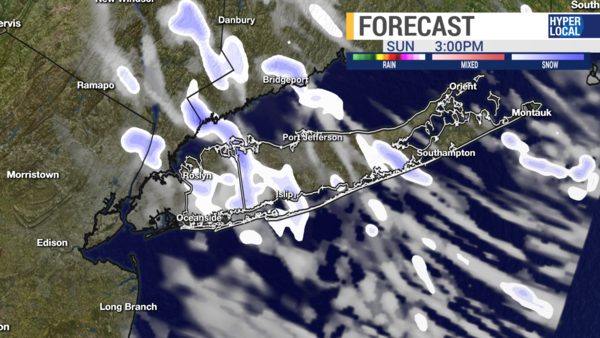 We have nice, dry sunshine over Long Island for now and we can see some snow and rain showers off to the West for now. 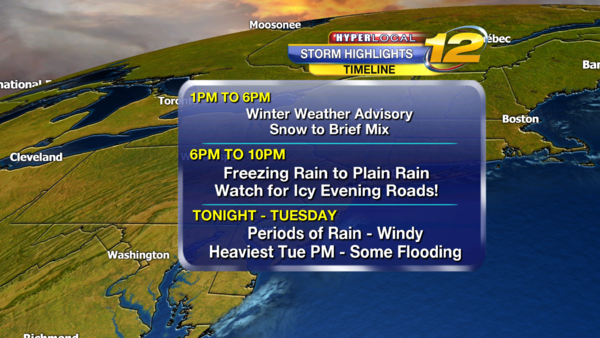 A WINTER WEATHER ADVISORY is in effect from late tonight through early afternoon tomorrow. We'll have some rain/mix develop overnight. We do not have cold air locked into place right now. 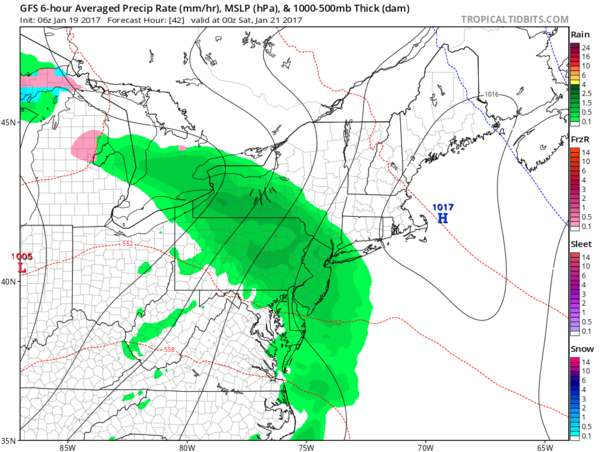 So, without that "prime" environment to support snow already in place, we'll start off in the upper 30s to near 40, with some rain/mix transitioning to snow by around daybreak or shortly before then tomorrow. 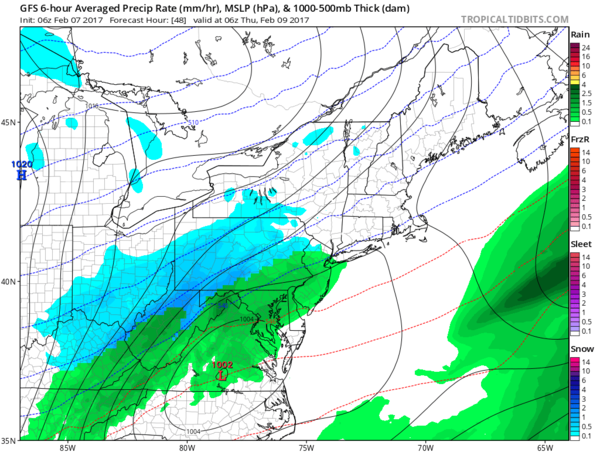 As we go through March, while we can and do see snow, it gets more difficult for that snow to stick to warmer surfaces unless we have a period of moderate to heavy snow to help drop those surface temperatures. Tomorrow, we should see several hours of that moderate snow. 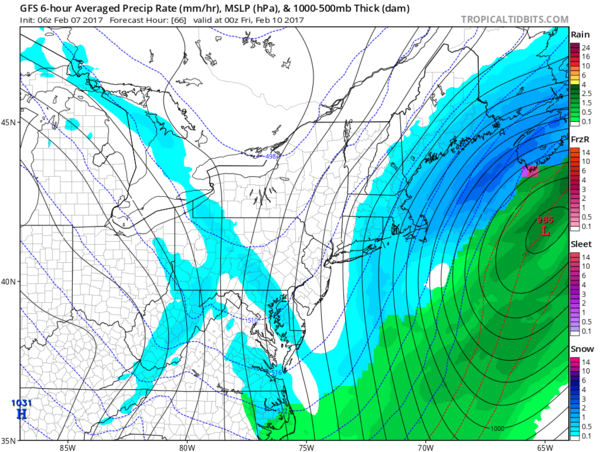 If this storm was happening in January, we'd likely be looking at higher snow totals. Overnight we'll see some rain to mix to eventually all snow early Friday morning. Roads will be wet to start, but will get sloppy throughout Friday. We may have to make slight adjustments to this this evening, but this should be close. 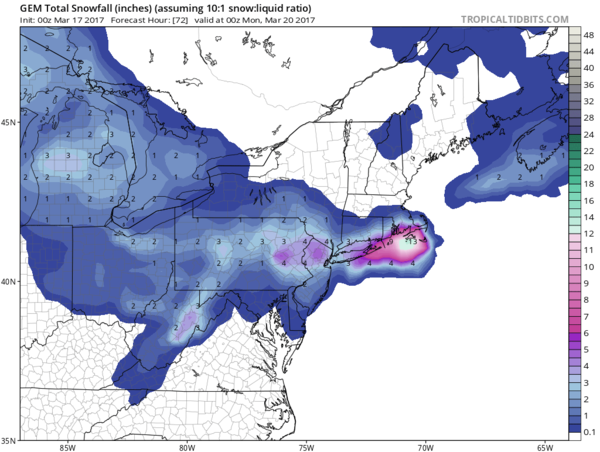 It's tough, especially without a good supply of colder air, to get really high snow totals out of this. 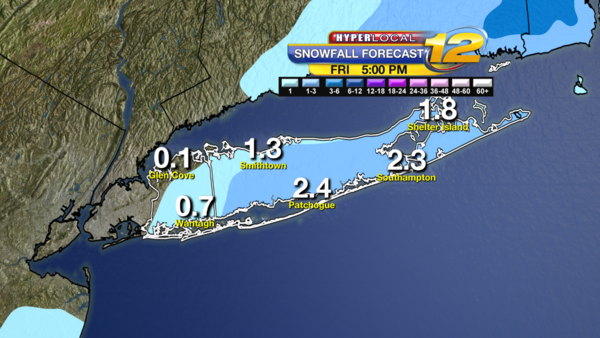 That being said, 2-5" of snow will be a nuisance and create sloppy and tricky travel on Friday. Highest snow amounts will be seen on grassy and colder surfaces and snow will be compacting a bit through the day. Until then...enjoy this afternoon and evening! Winter is certainly back through next week. VERY COLD air will be here from Friday night through the weekend. Watch for areas of ice. 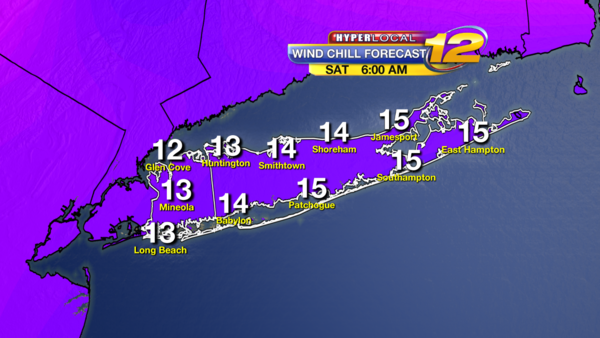 Wind chills on Saturday will be in the single digits to the teens. WE SPRING FORWARD Saturday night and lose an hour of sleep, but gain that extra hour of daylight! 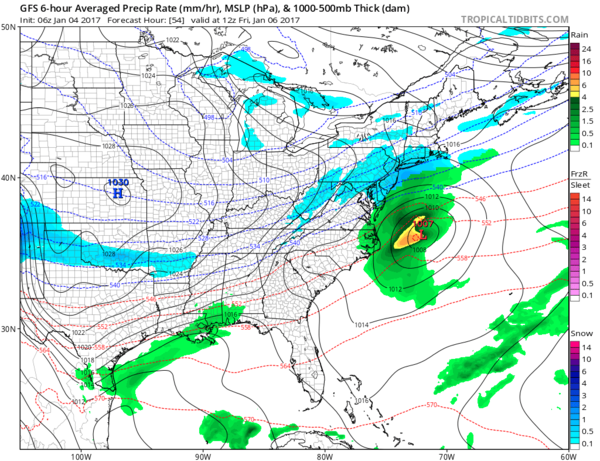 Yes, we are all still watching the potential for a more significant storm around the Tuesday time frame of next week, but it is still too early for any specifics on that. 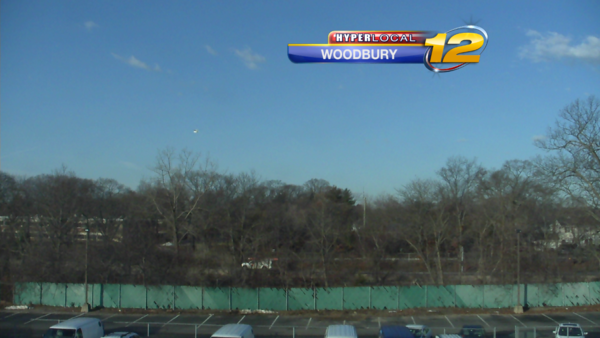 Be sure to check Bill Korbel's updated evening forecast on News 12 Long Island starting at 5pm. TRACKING A COASTAL STORM. 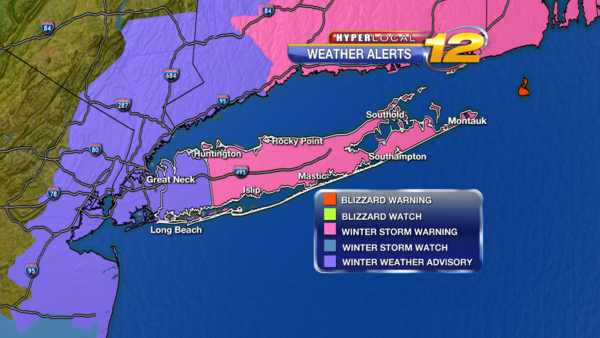 BLIZZARD Warning for areas West of the William Floyd Parkway. Winter Storm Warning for Areas East of the William Floyd Parkway. Periods of Snow, heavy at times with strong winds. 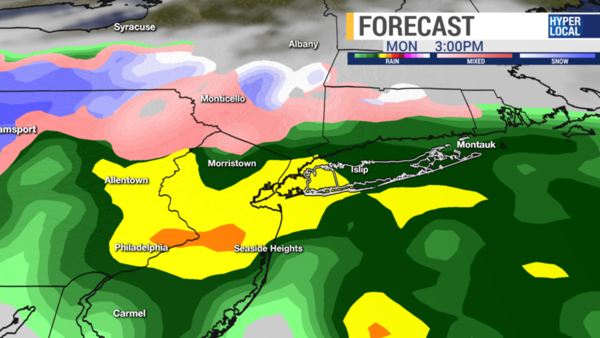 Snow mixing with Rain and Sleet between noon and 4pm. We could have a period of all rain over the East End. If the rain/snow line shifts east or west snow totals WILL change. Be Alert. Snowfall rates from 8am to Noon could be 2 to 4 inches per hour with Whiteout conditions and dangerous travel. 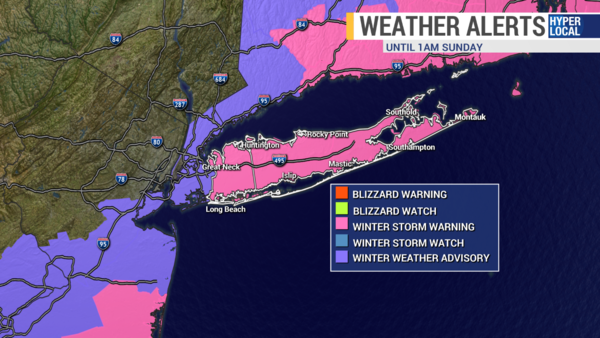 12-18" of snow in the Blizzard warning areas, and 6 to 12 inches in the Winter Storm warning. 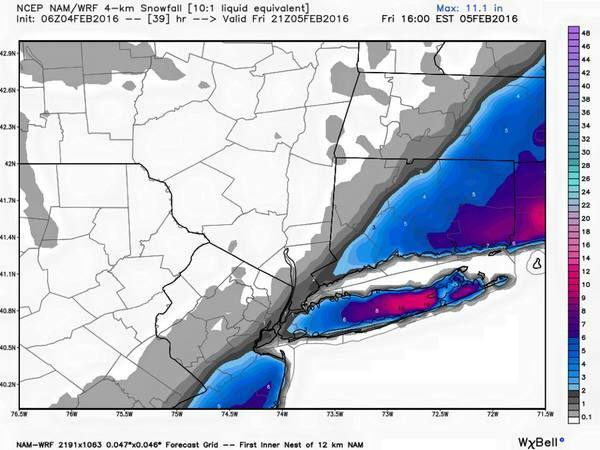 Difficult forecast for totals in Suffolk County because of location of rain/snow line. 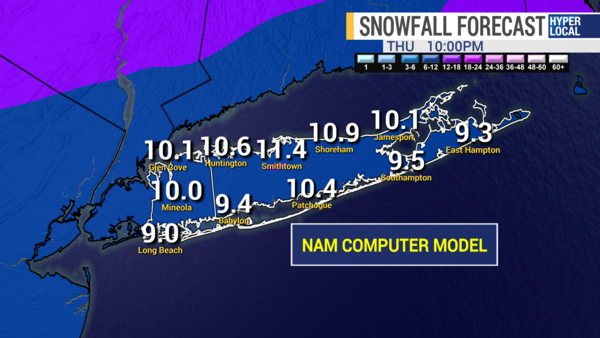 Highest snow totals will be in Nassau County west towards NYC. 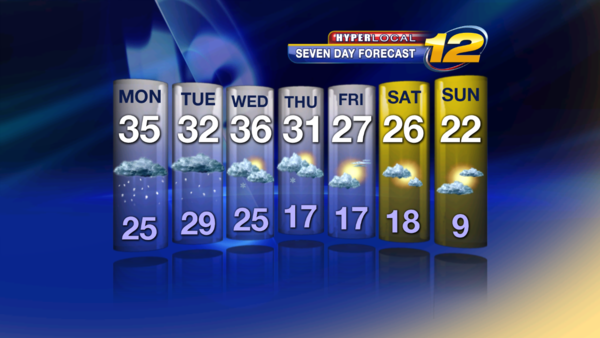 Stay with News 12, News12.com and News12 app for continuing updates. Any change in current storm track will mean the adjustment of our forecast projections. 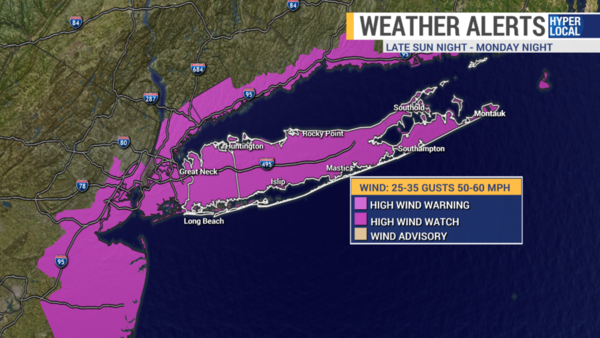 Winds Northeast Sustained 25 to 35 mph and gusts to 50 mph, some gusts 50 to 60 mph East End. 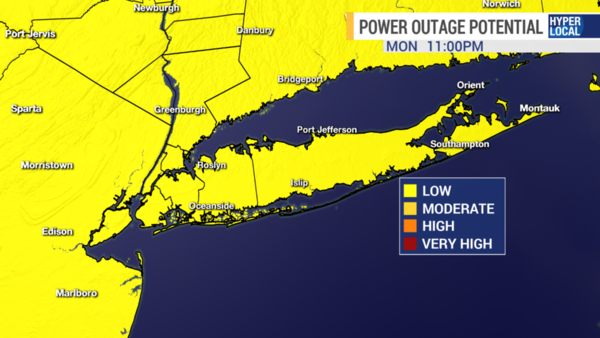 Power Outages likely. Blowing and drifting snow. Highs around 34. 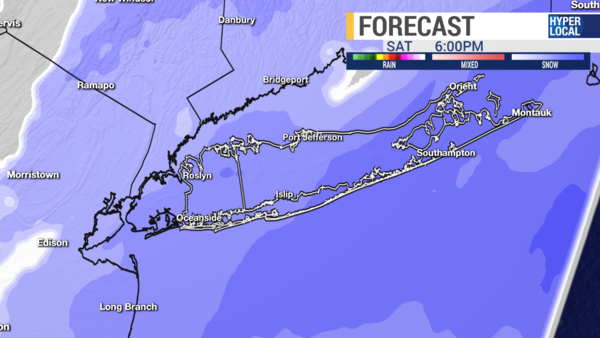 Precipitation tapers off after 4pm and most snow accumulation will be done. 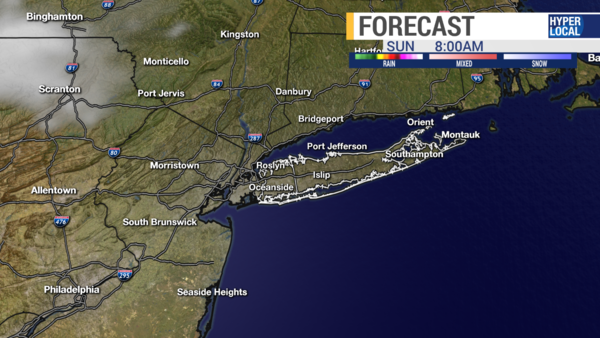 Coastal Flood Warning 8am to Noon. 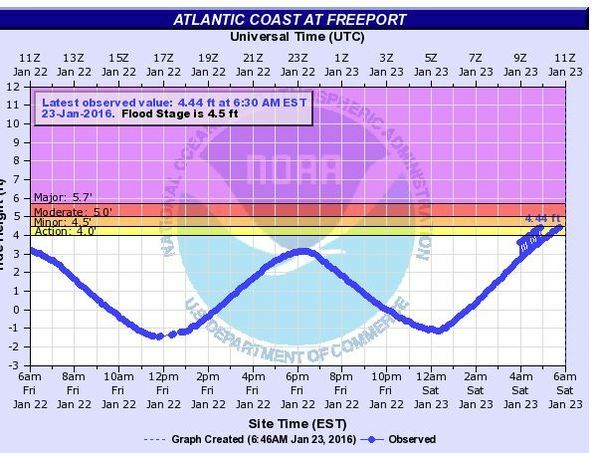 Tides 2 to 3 feet above normal, minor to moderate coastal flooding with water is streets. 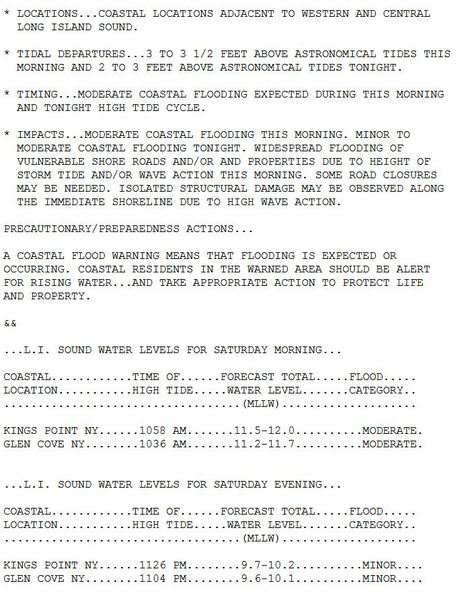 You will have to move your cars in flood areas. 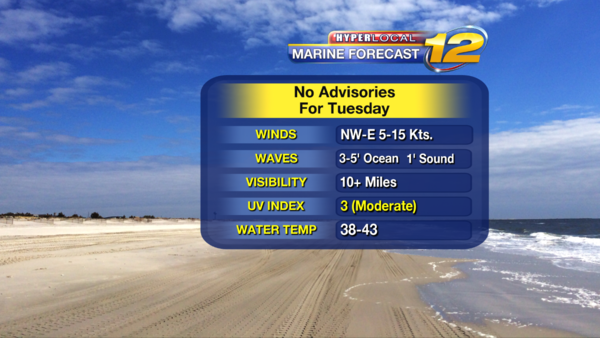 TUESDAY NIGHT: Mostly Cloudy and Windy. Icy and snow Covered roads. Dangerous Travel. Winds Northwest 20 to 30 mph. Lows 20 to 25. 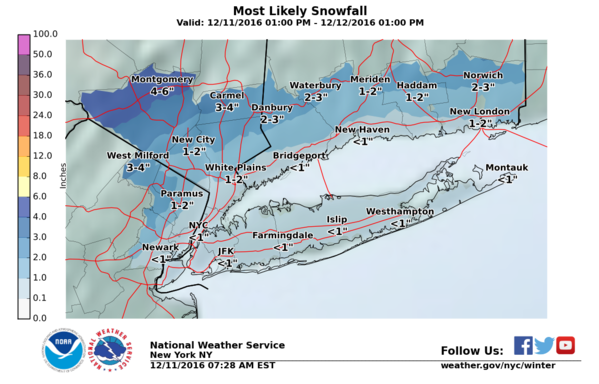 More snow on the way and YOU CAN MAKE THE CALL. 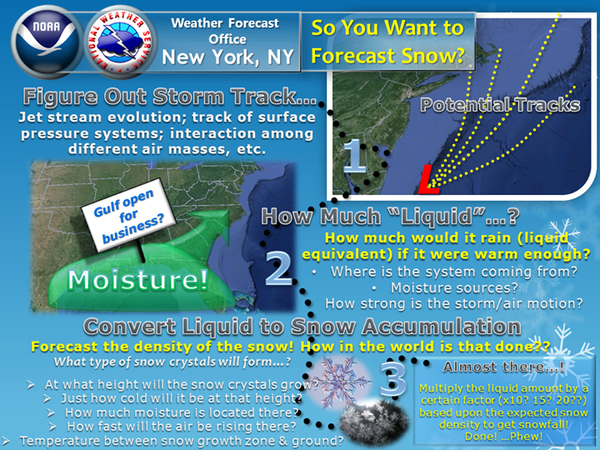 So how do you forecast a Snow storm? Here on the major ones most people use.